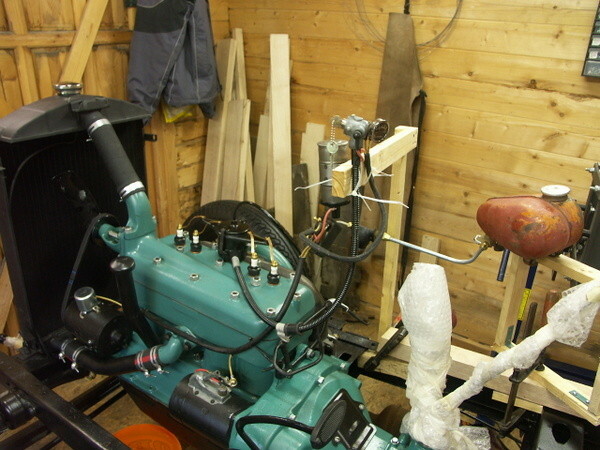 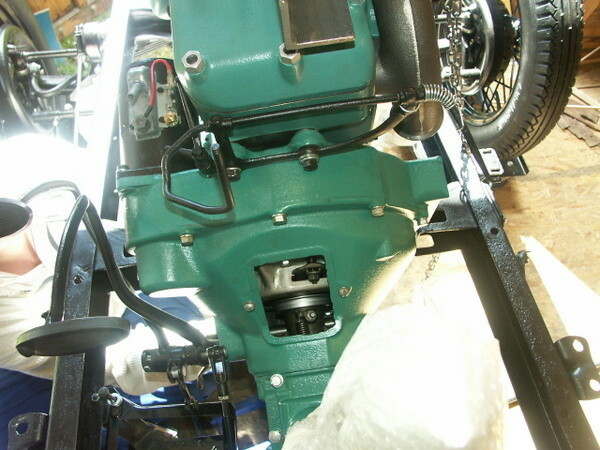 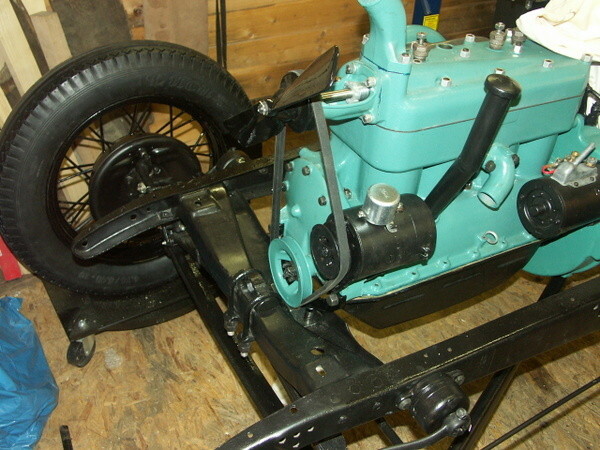 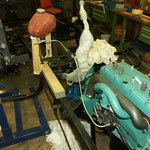 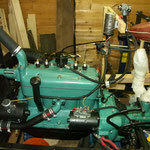 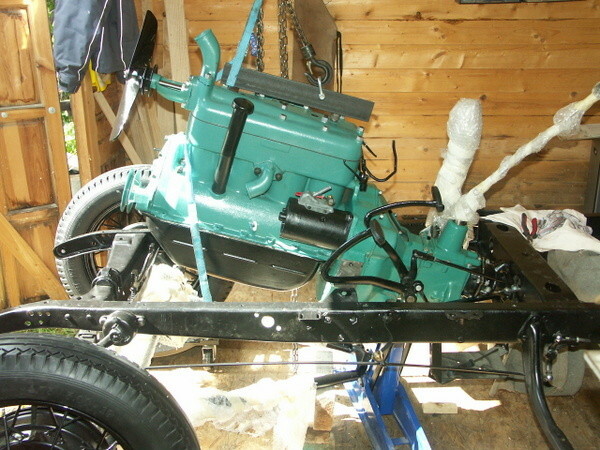 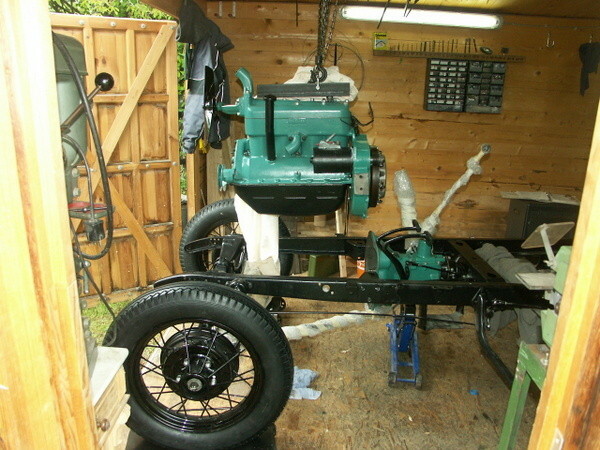 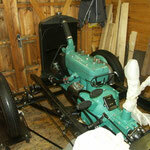 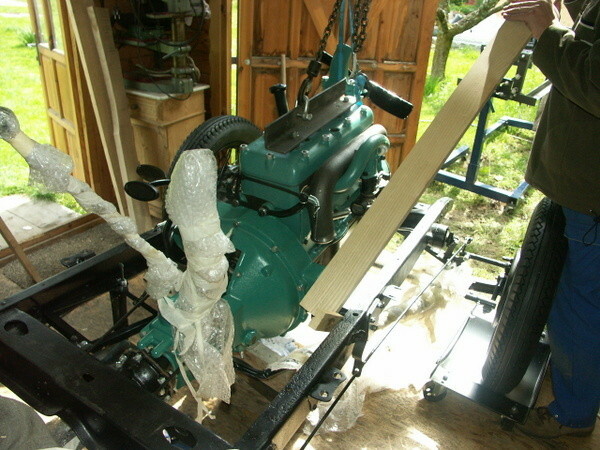 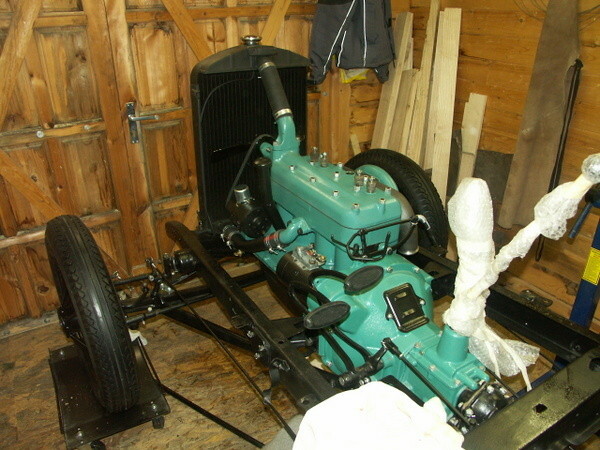 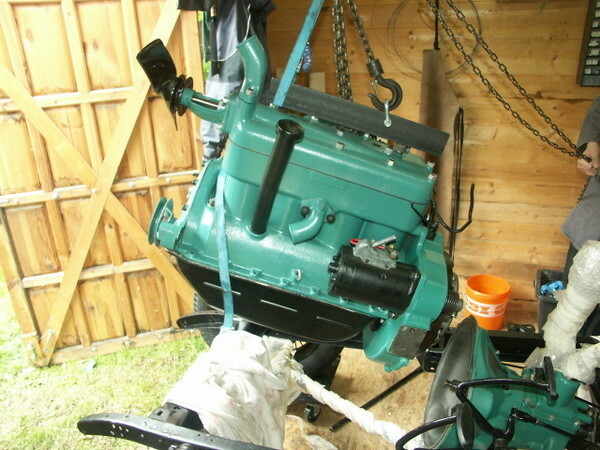 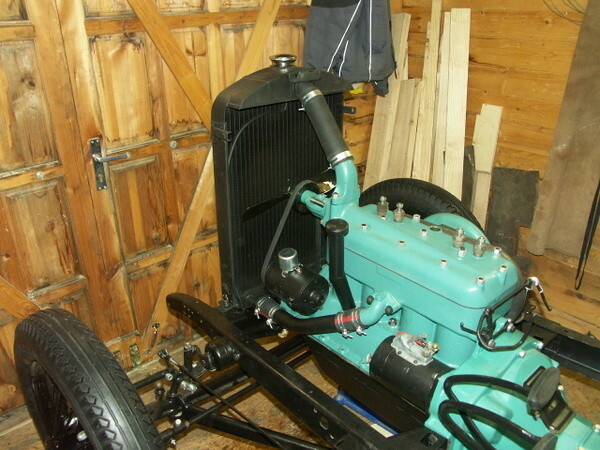 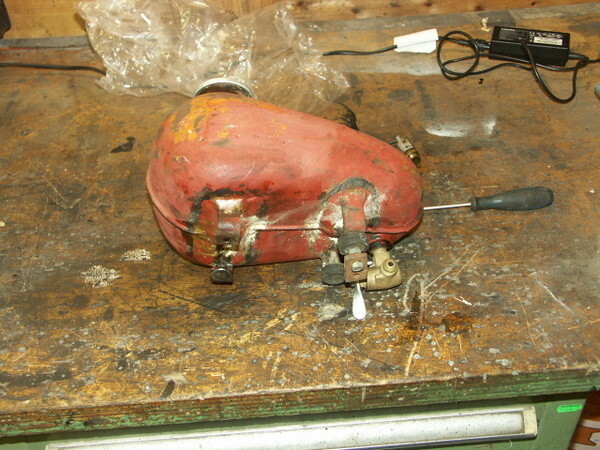 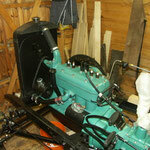 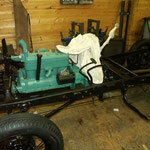 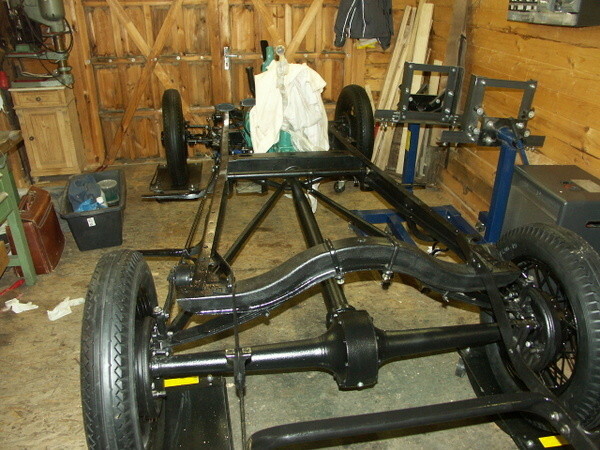 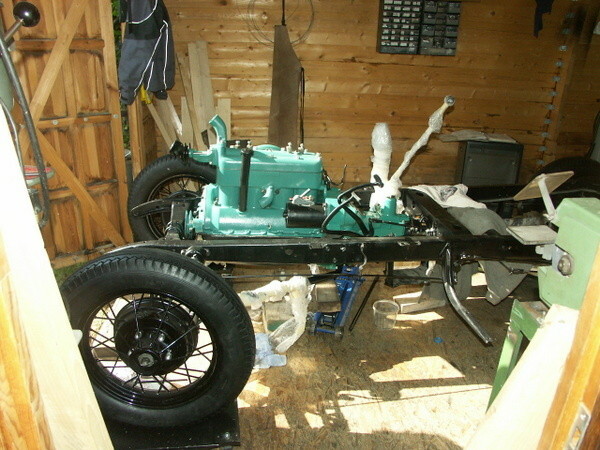 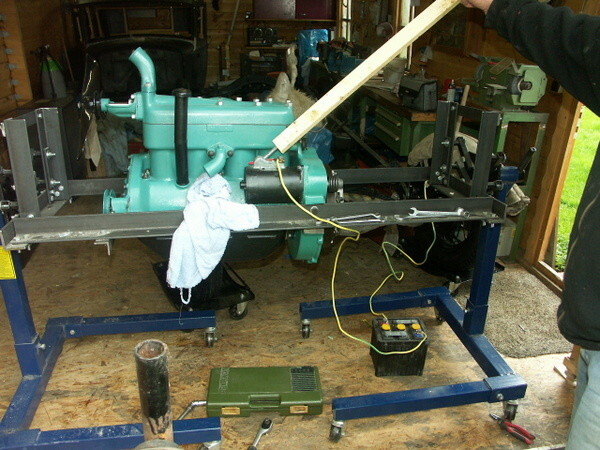 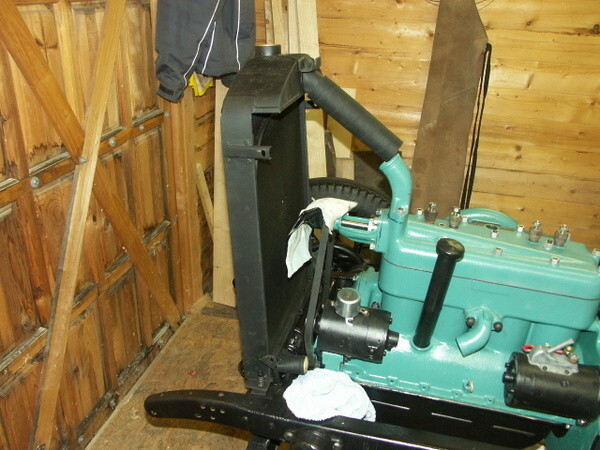 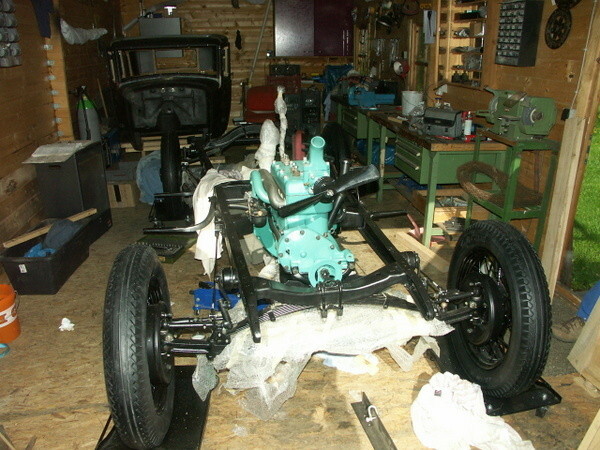 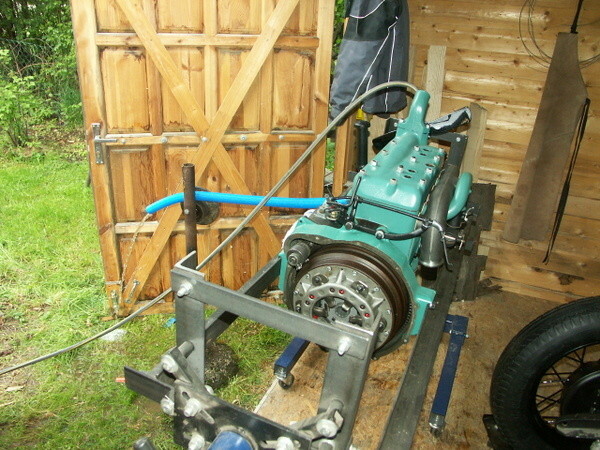 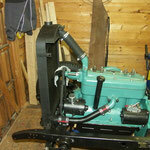 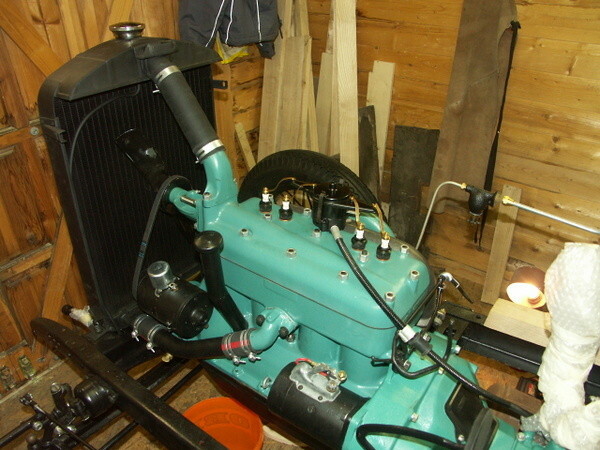 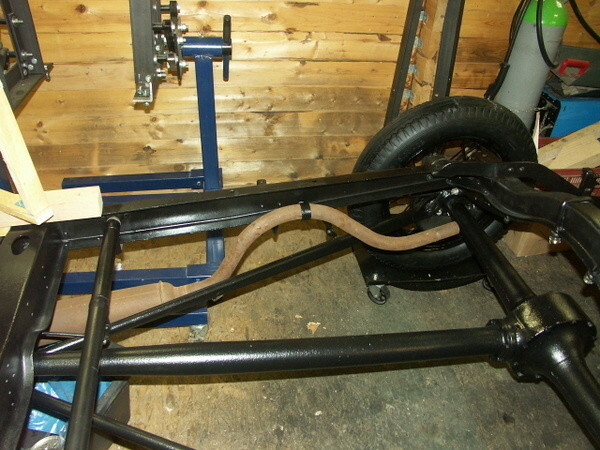 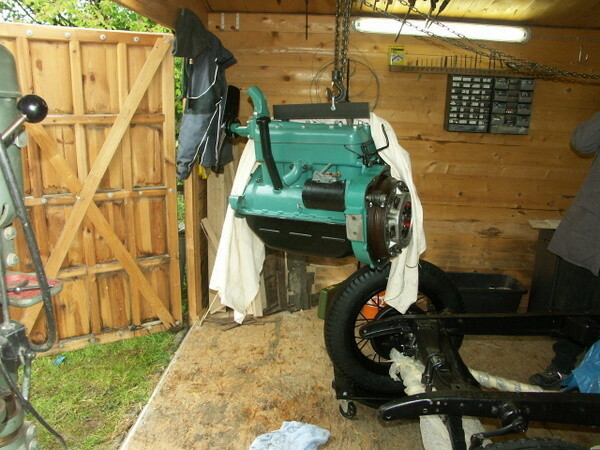 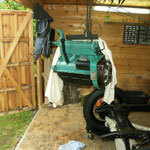 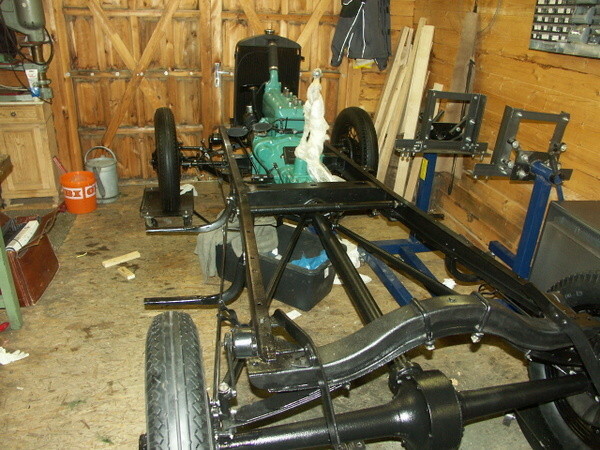 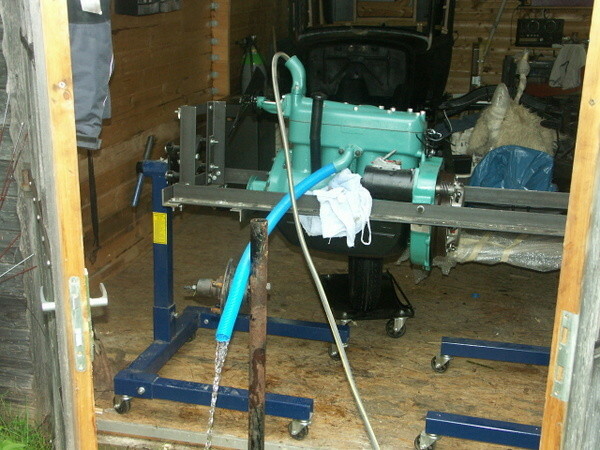 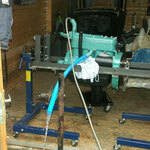 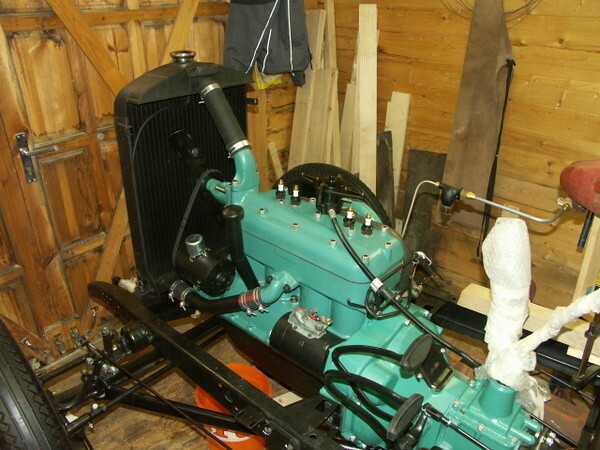 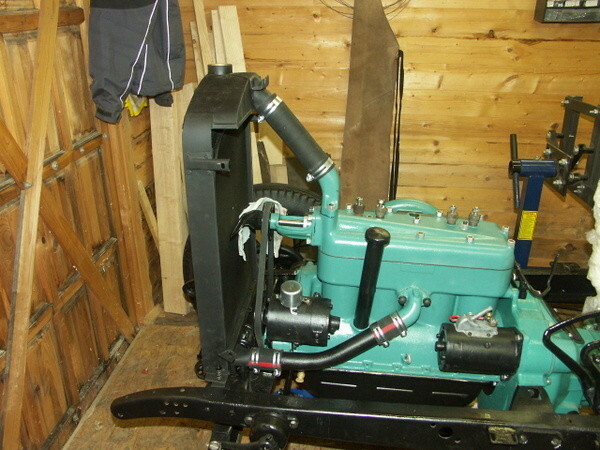 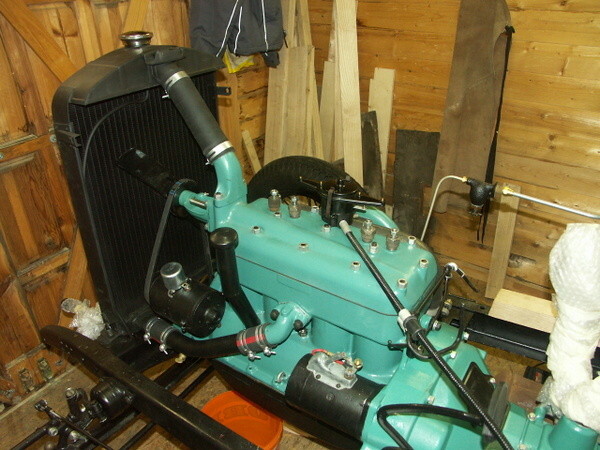 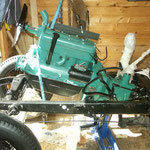 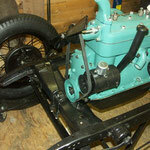 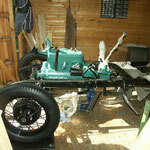 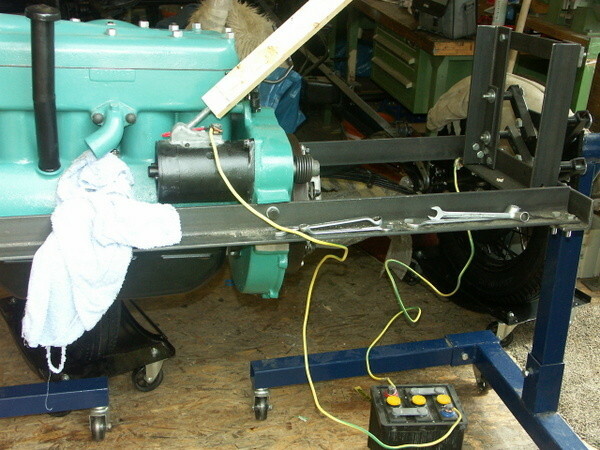 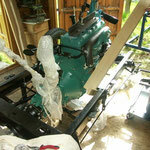 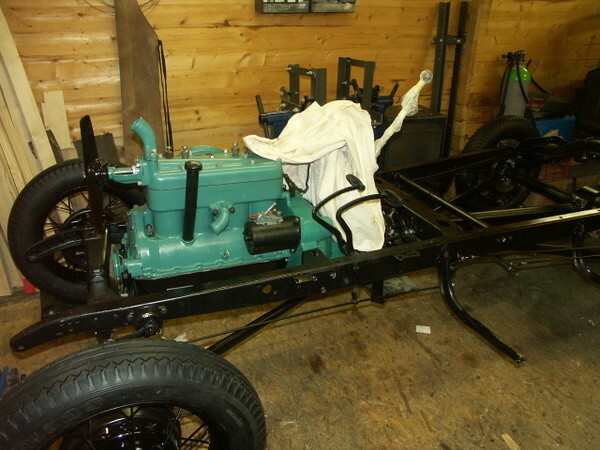 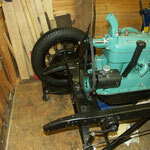 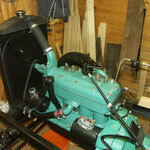 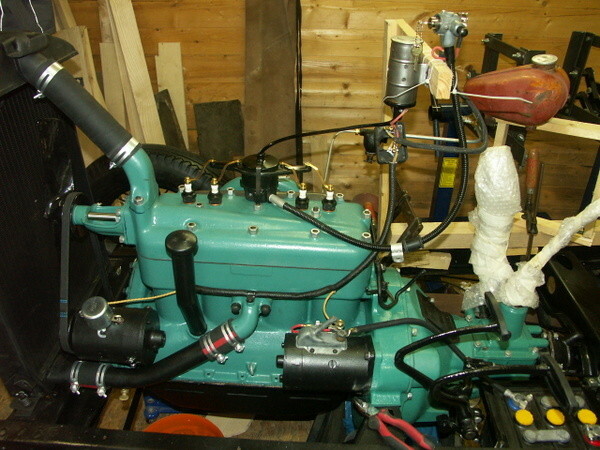 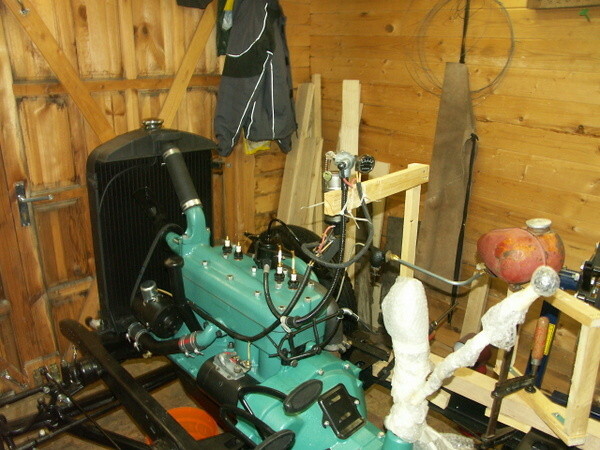 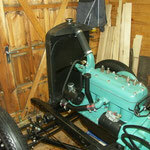 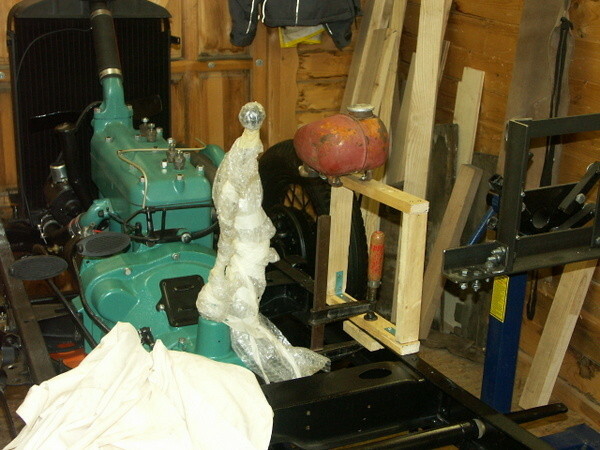 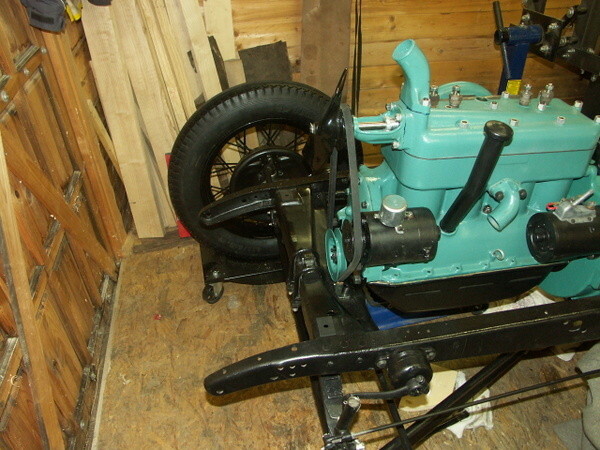 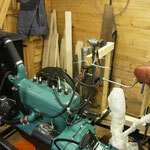 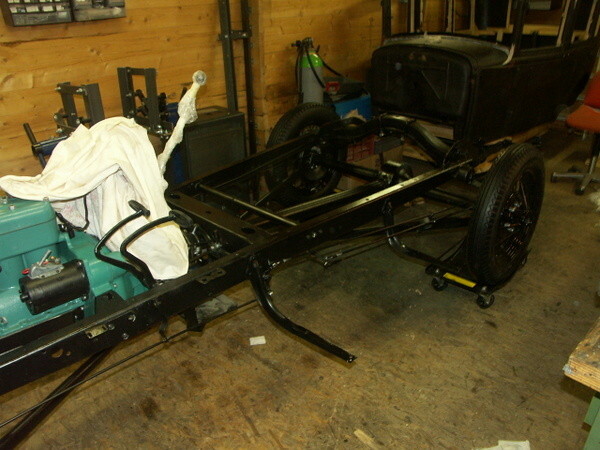 May 19th: Engine mounted in chassis, timing set, temporary fuel tank (old motorbike tank) attached and THE ENGINE IS RUNNUNG! 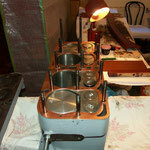 See bottom of page for pictures and video! 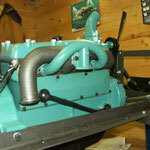 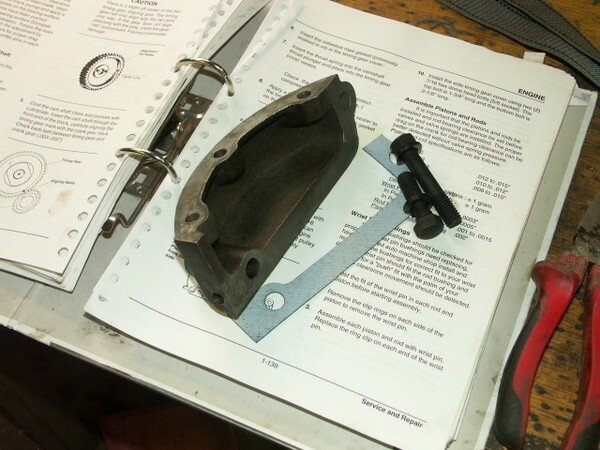 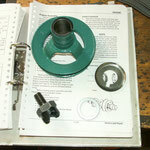 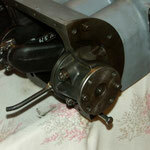 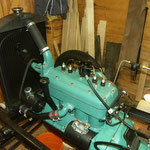 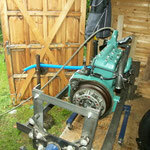 February 16th 2014; Flywheel, head, starter, manifold and water pump, see bottom of page. 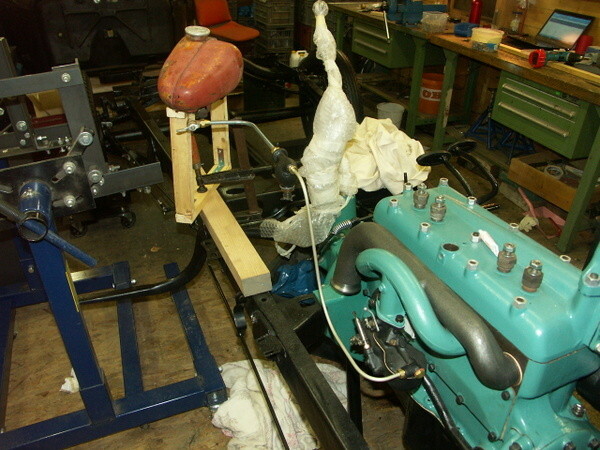 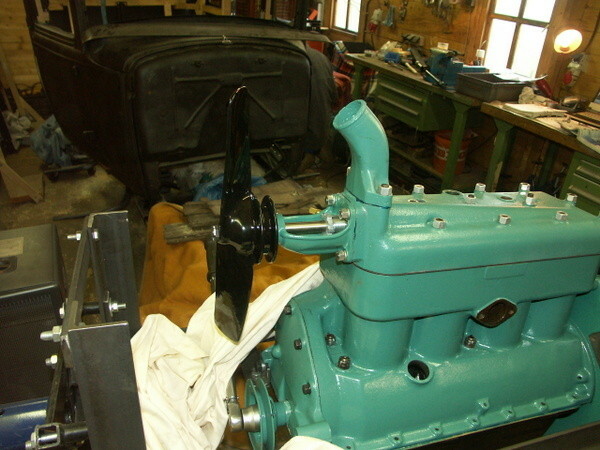 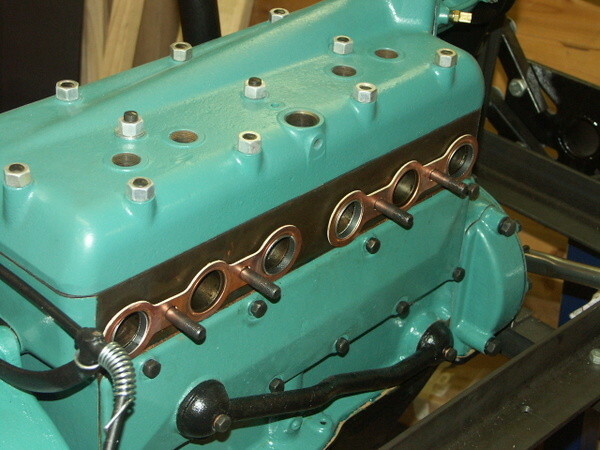 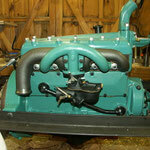 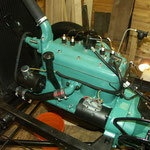 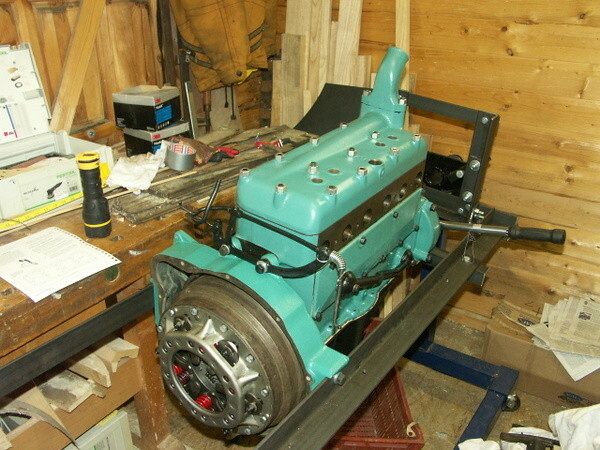 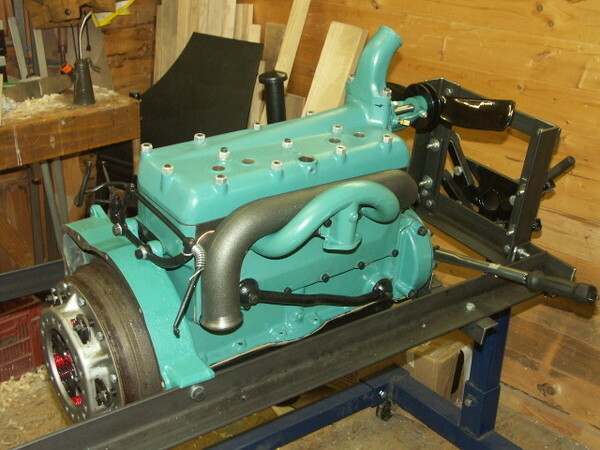 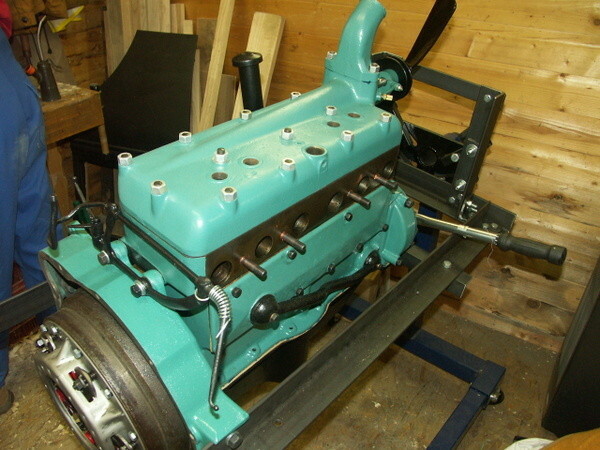 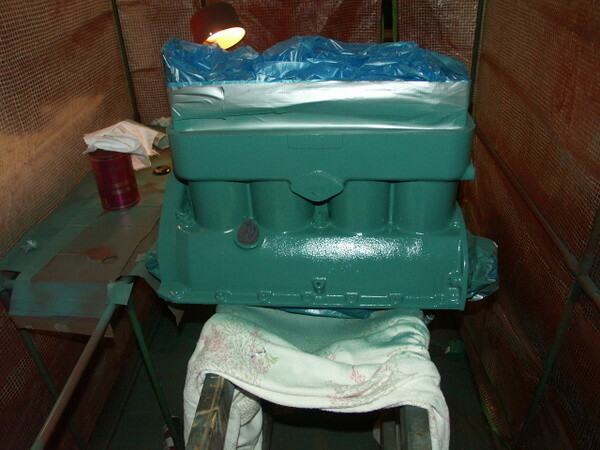 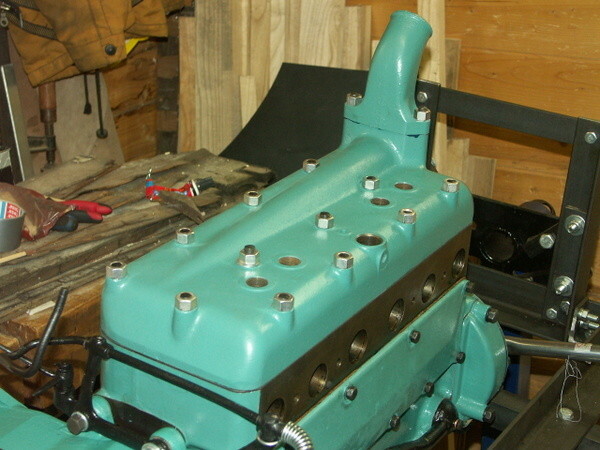 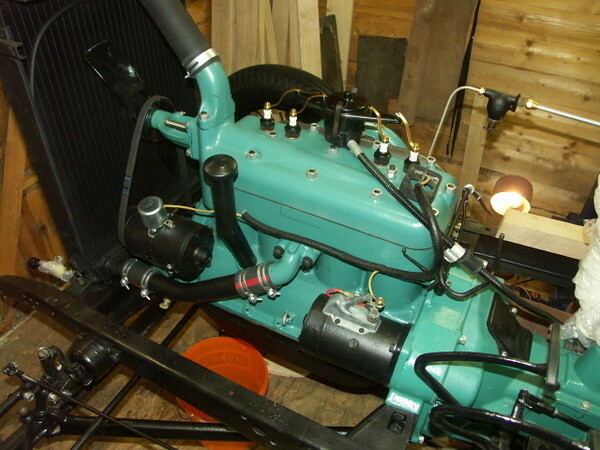 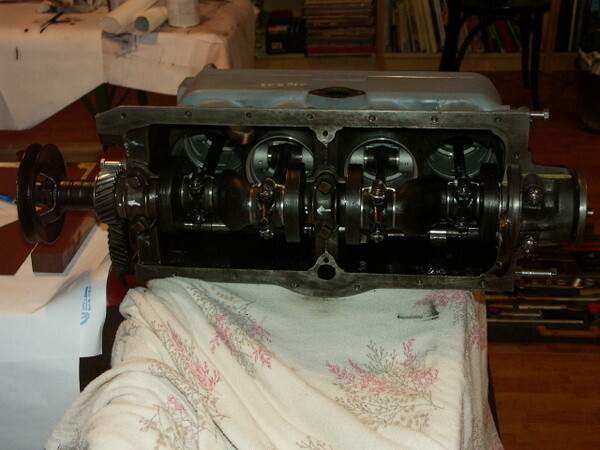 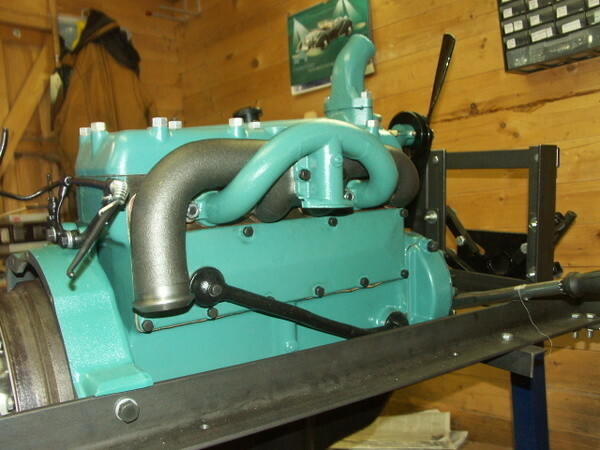 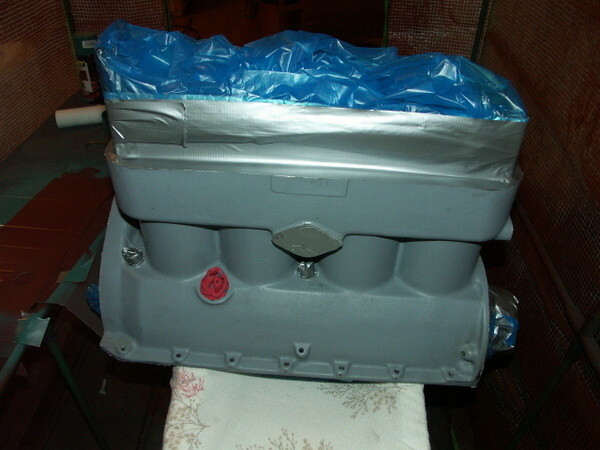 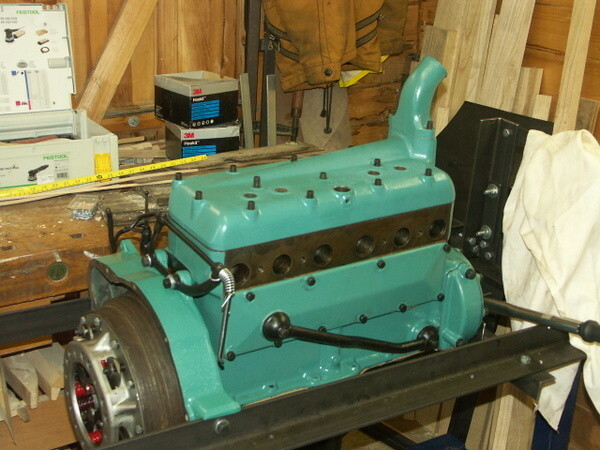 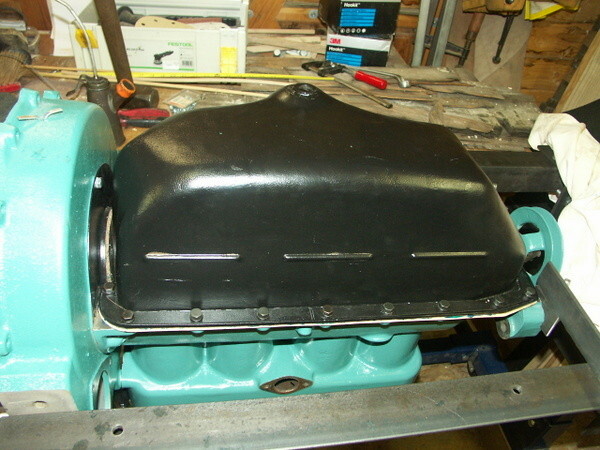 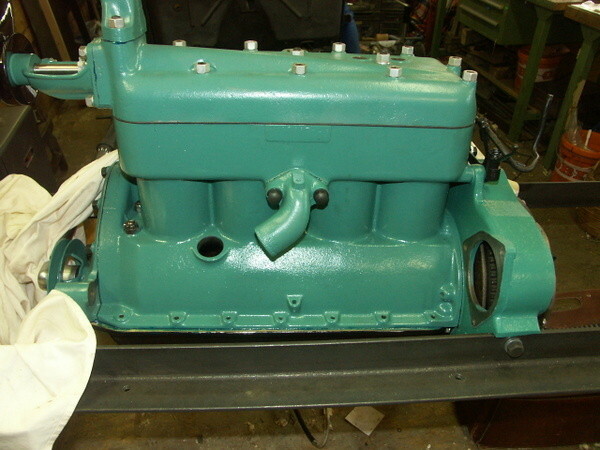 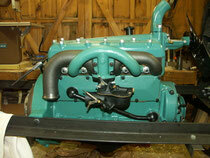 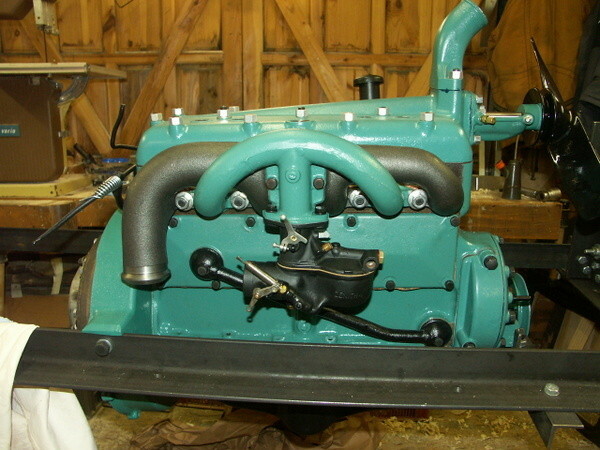 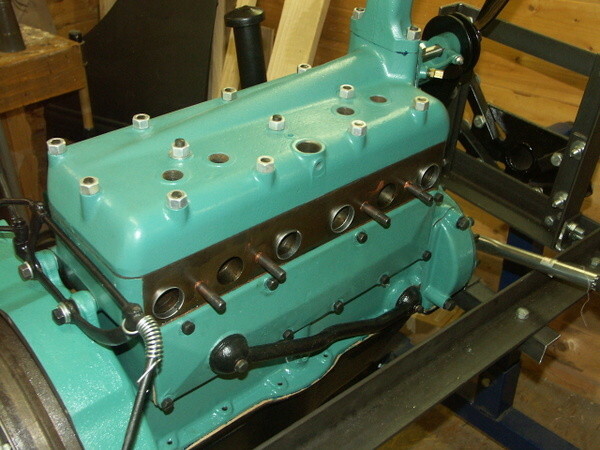 January 26th 2014: Timing and valve covers, flywheel housing oil pan, carburetor and water pump assembled. 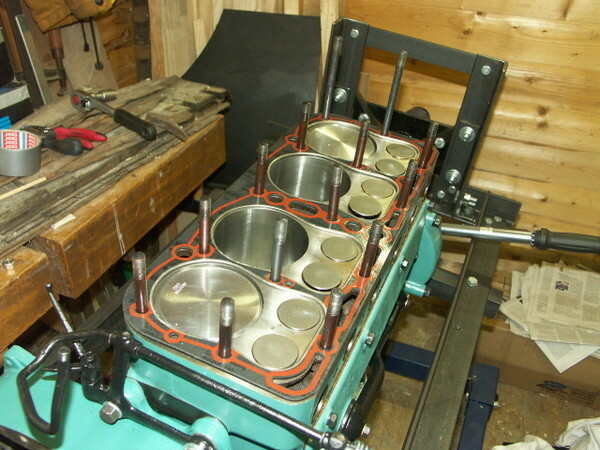 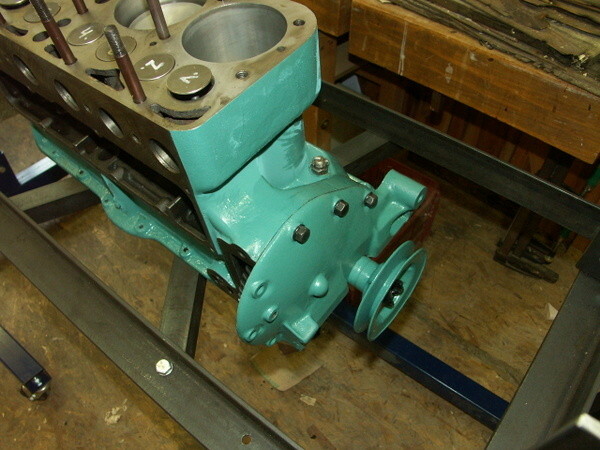 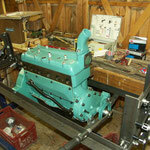 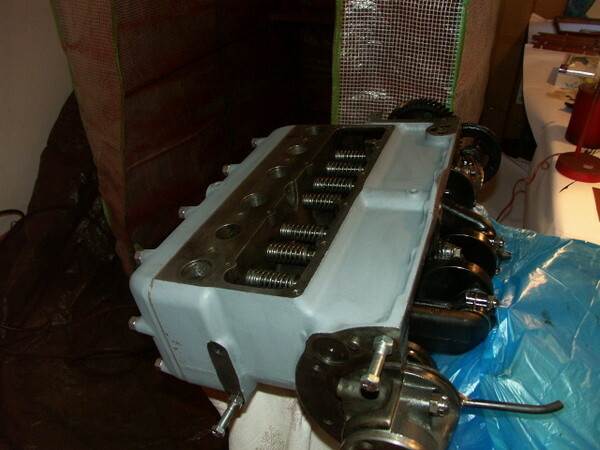 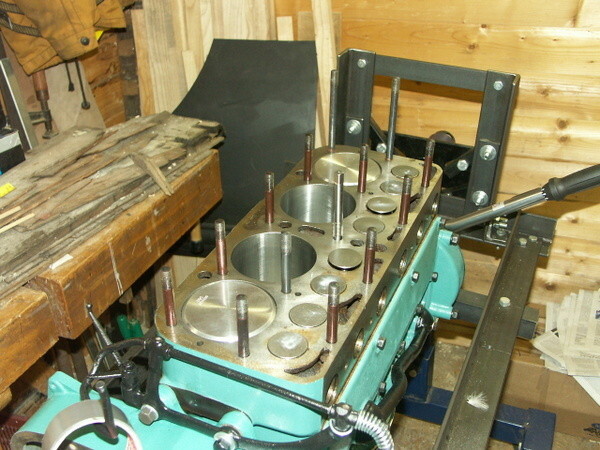 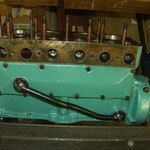 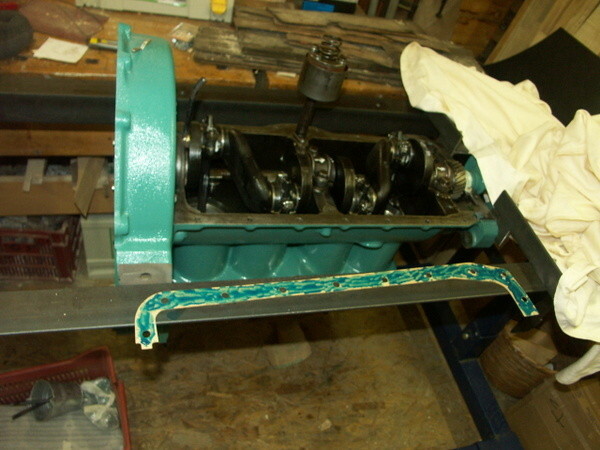 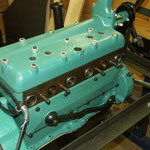 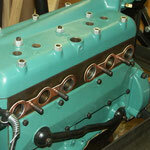 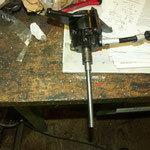 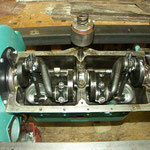 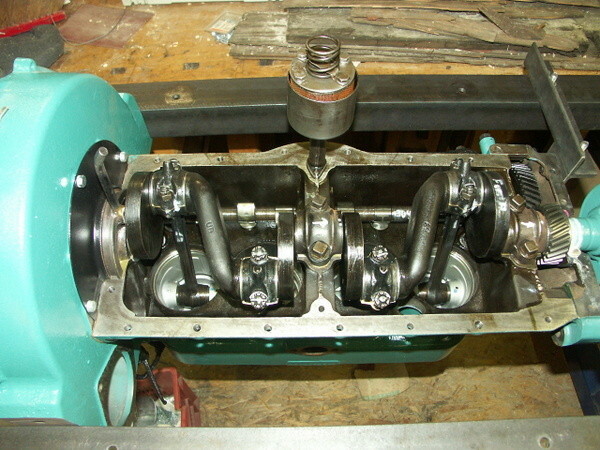 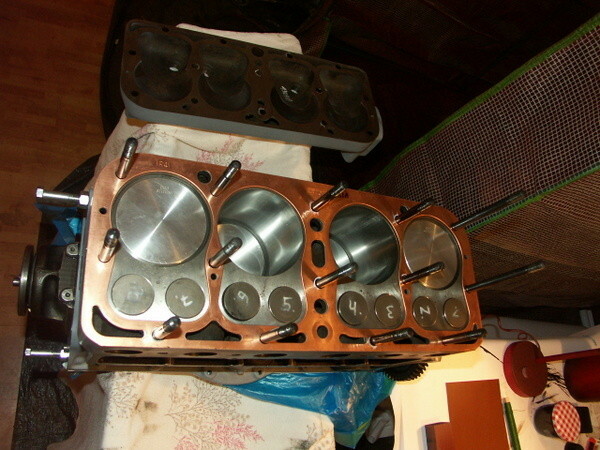 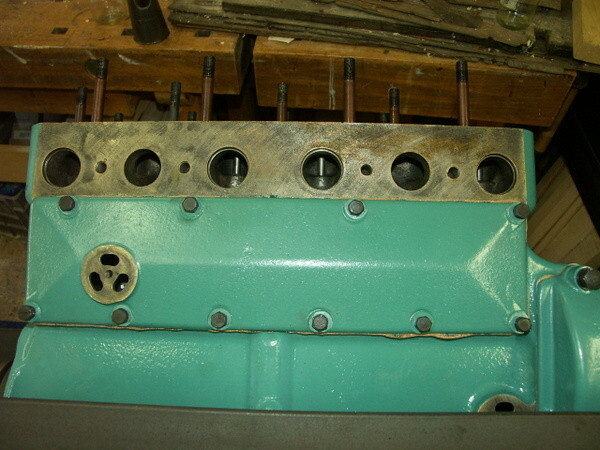 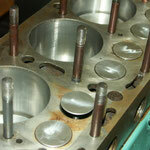 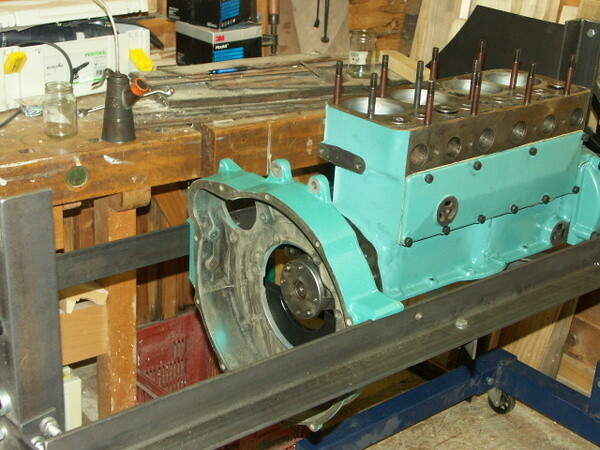 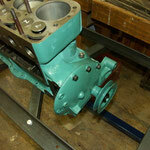 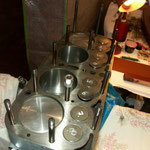 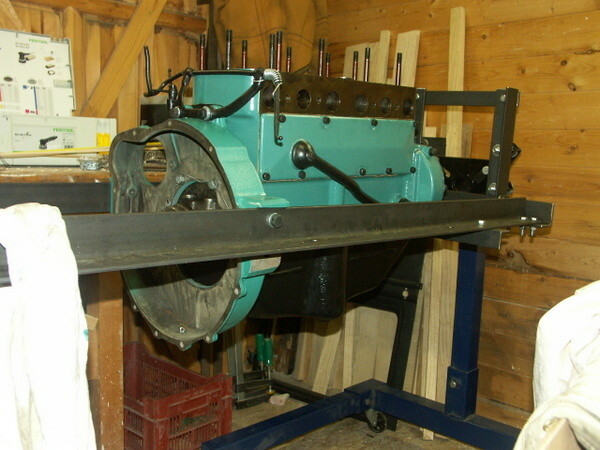 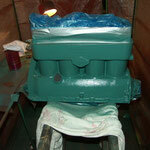 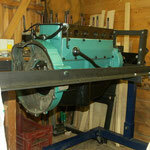 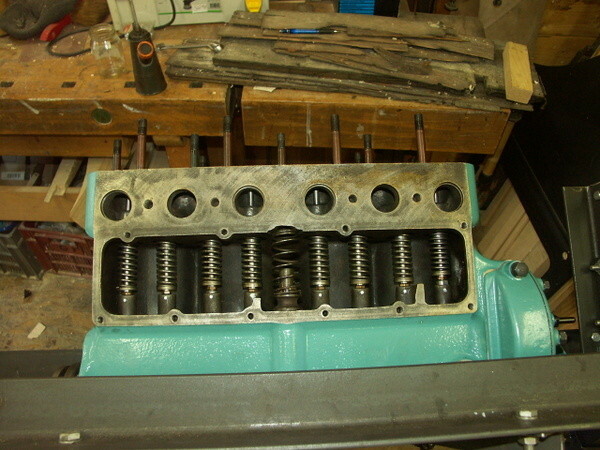 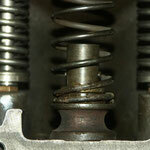 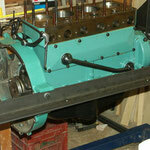 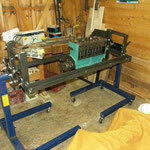 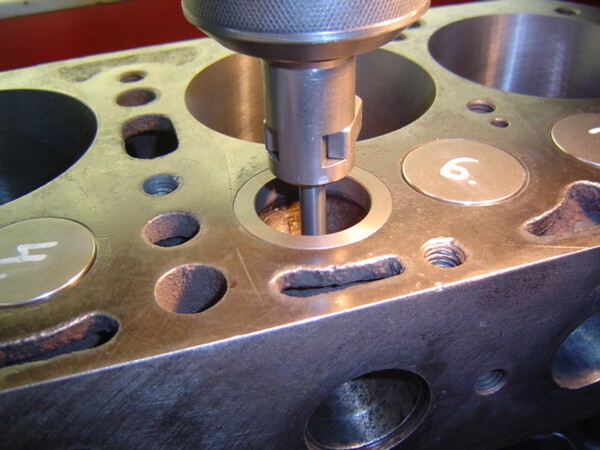 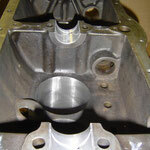 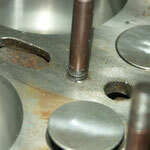 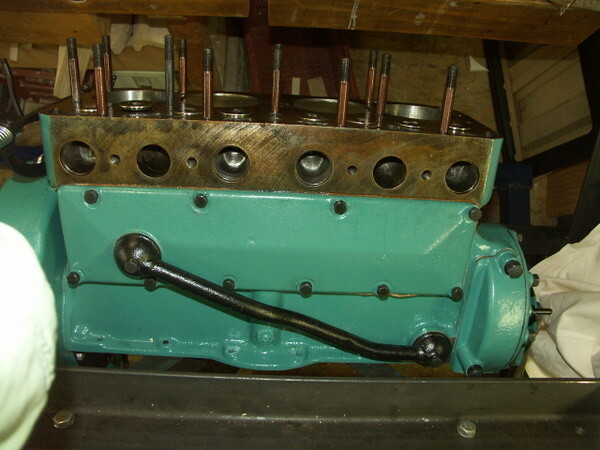 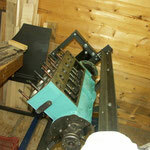 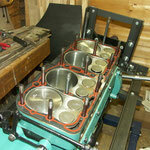 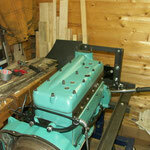 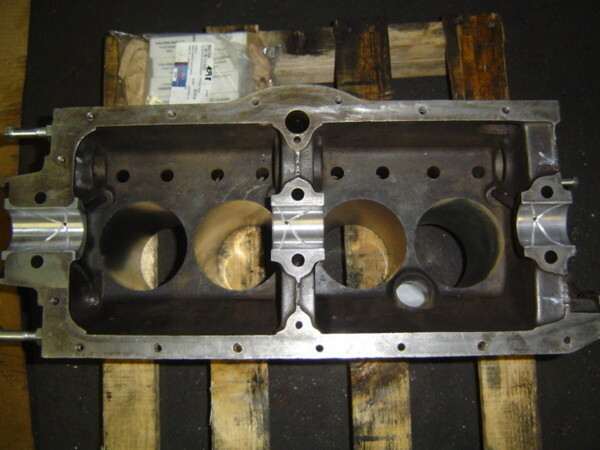 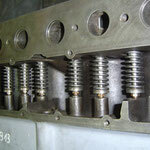 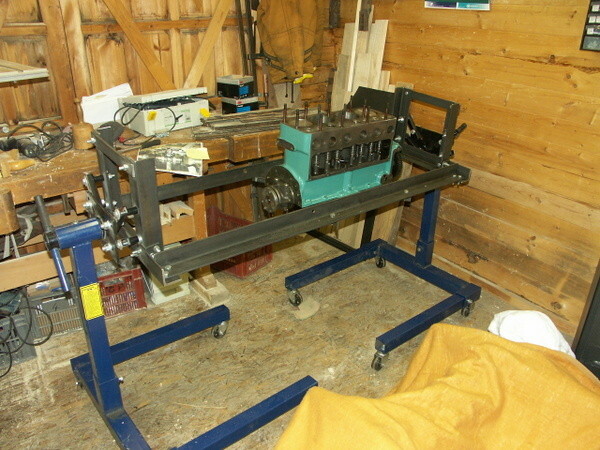 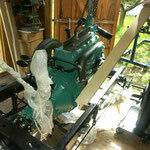 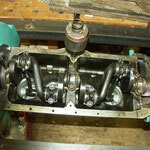 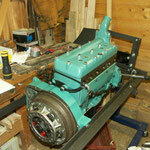 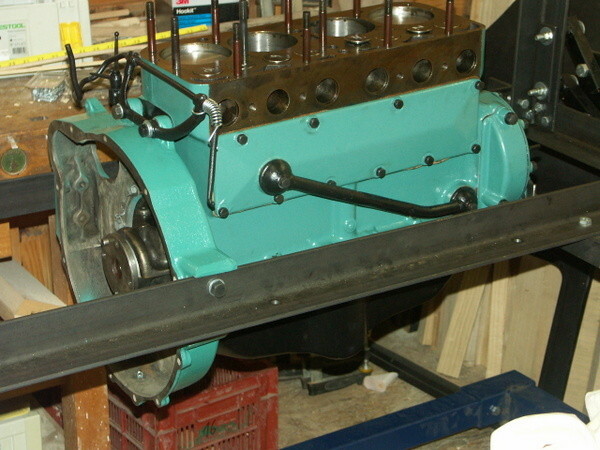 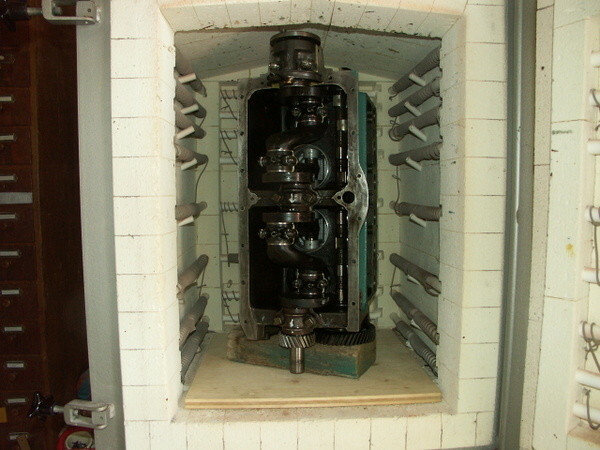 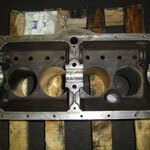 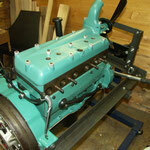 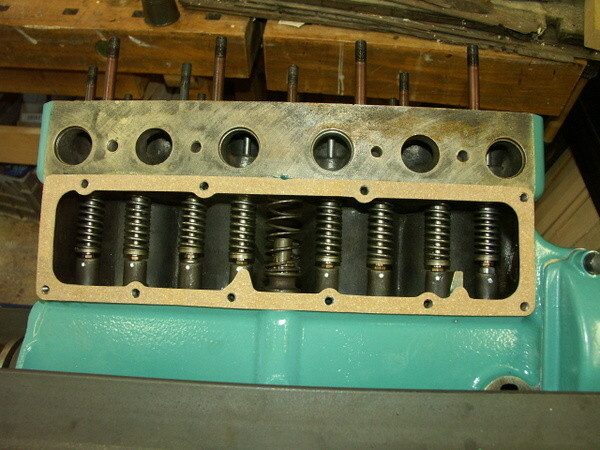 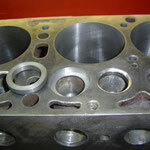 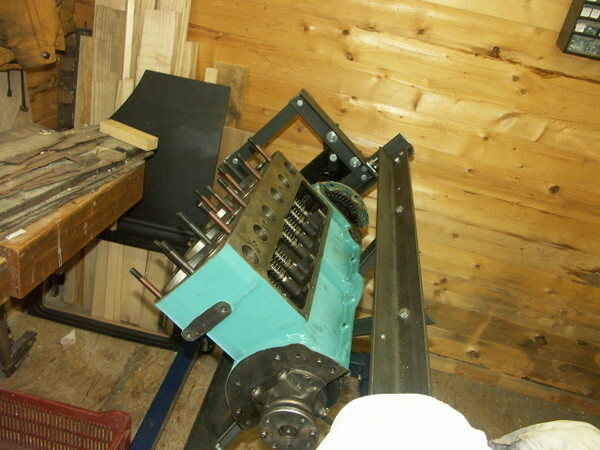 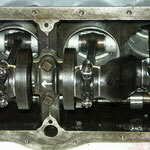 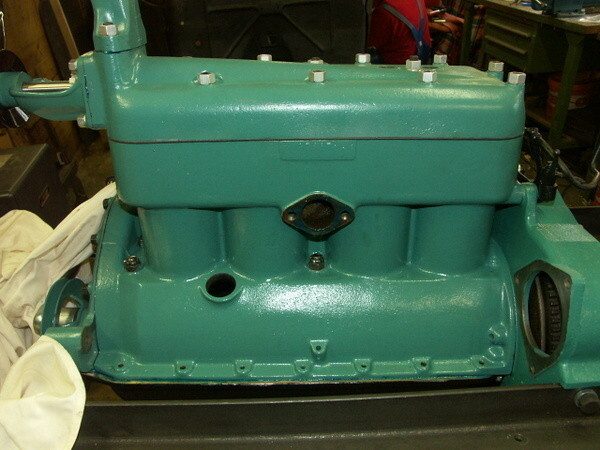 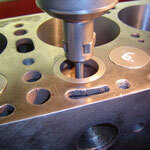 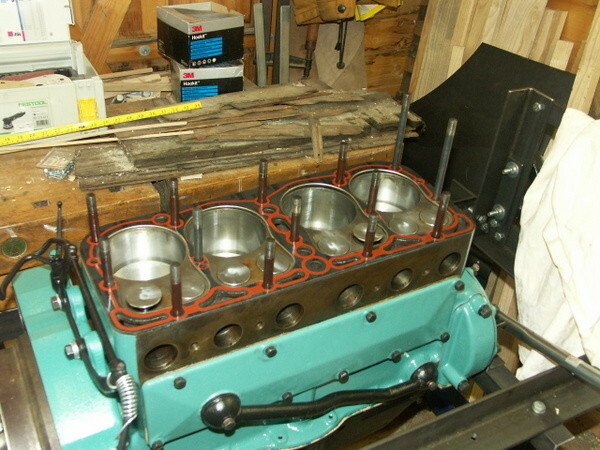 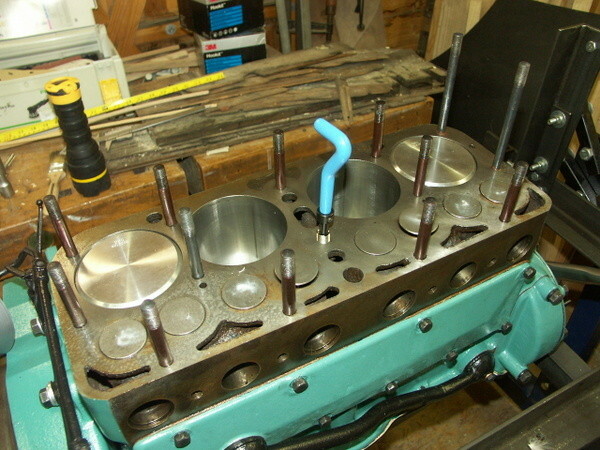 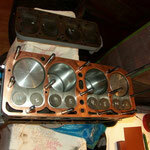 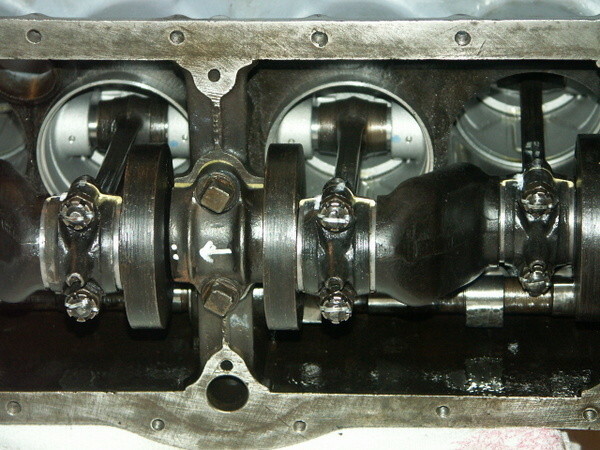 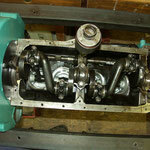 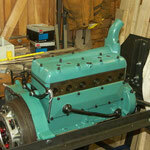 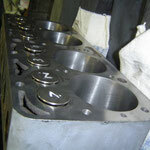 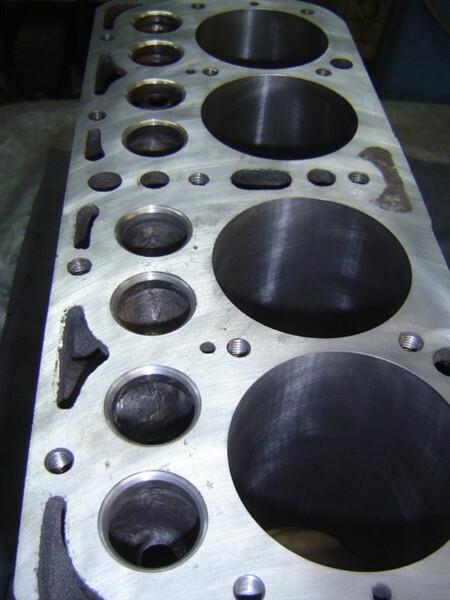 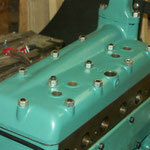 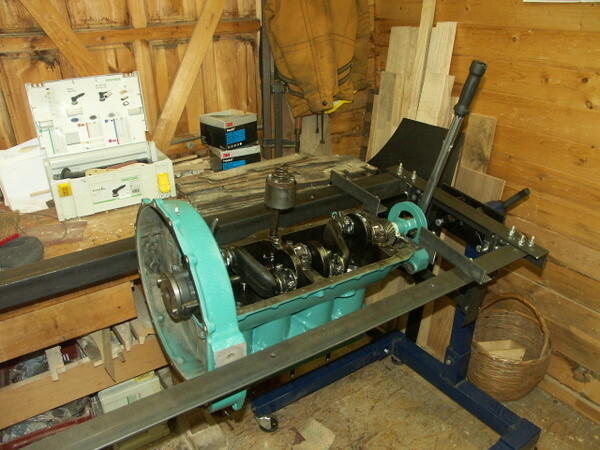 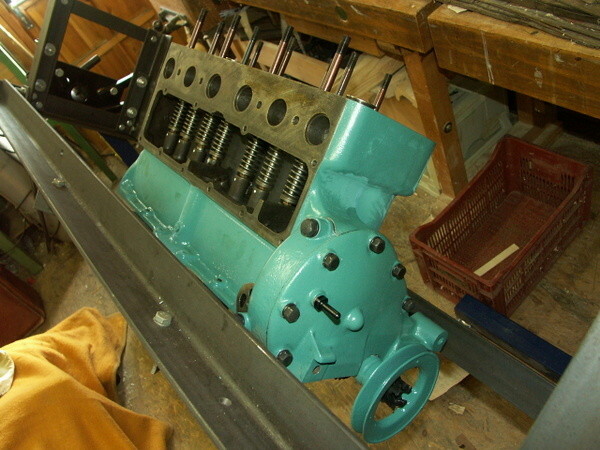 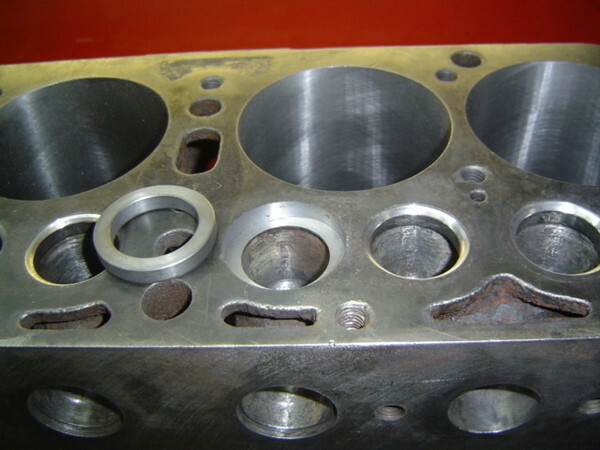 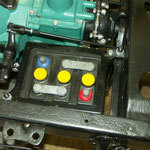 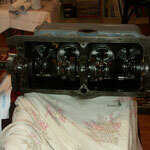 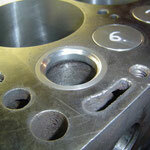 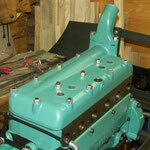 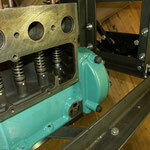 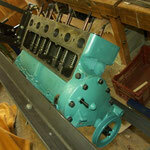 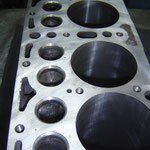 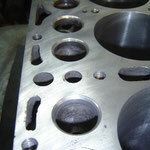 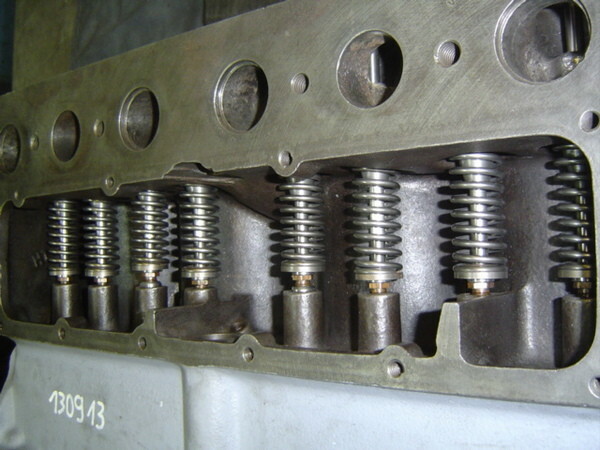 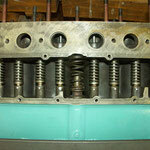 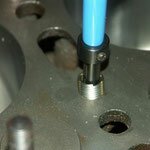 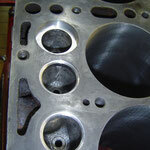 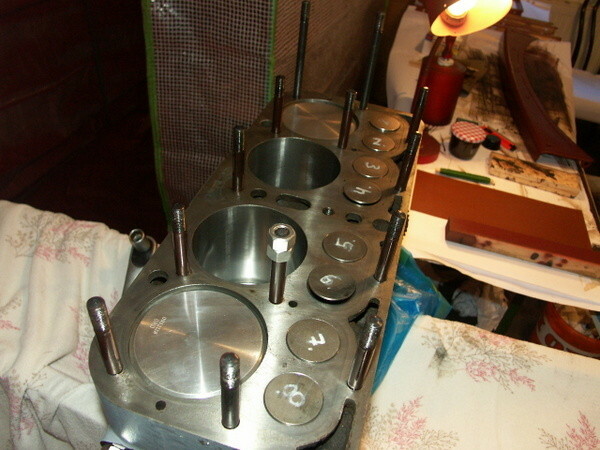 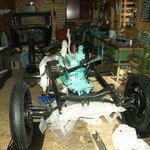 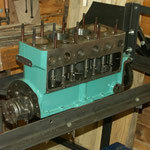 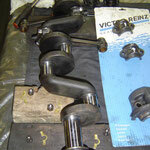 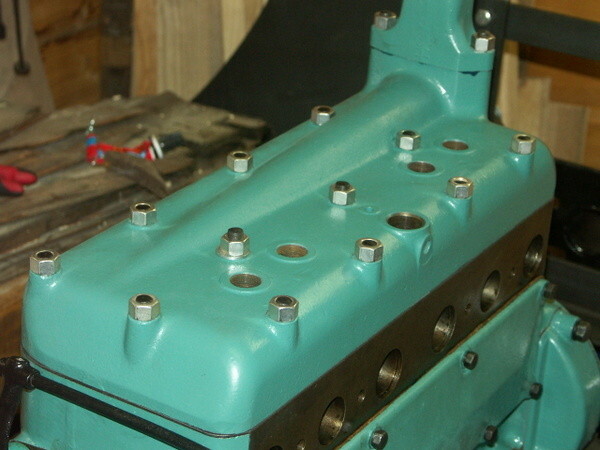 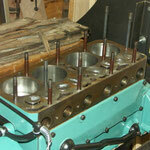 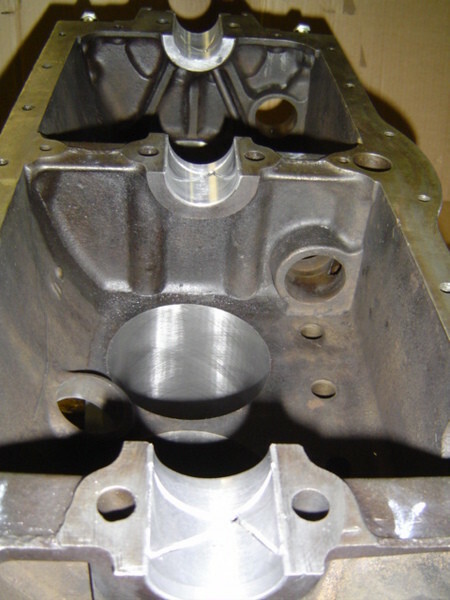 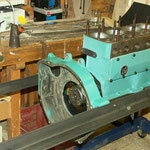 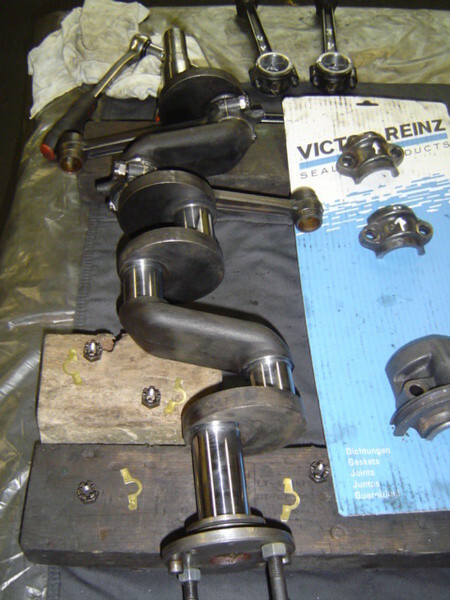 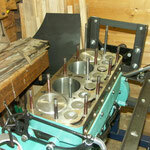 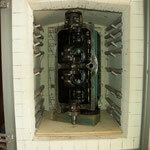 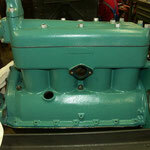 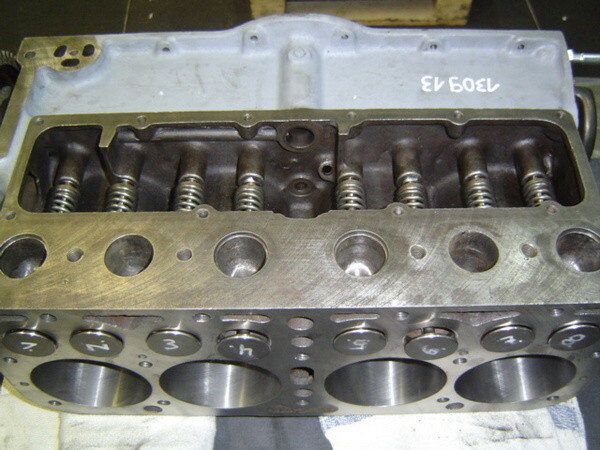 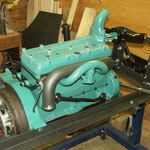 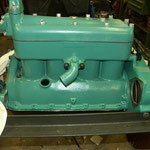 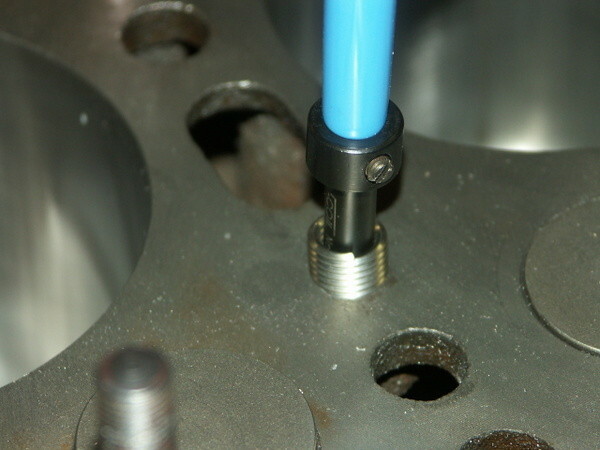 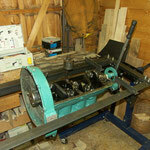 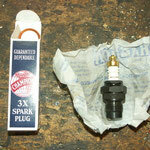 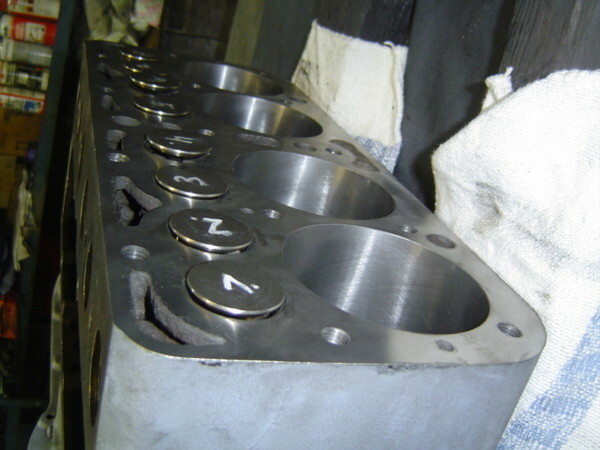 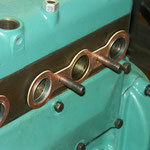 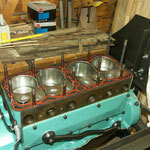 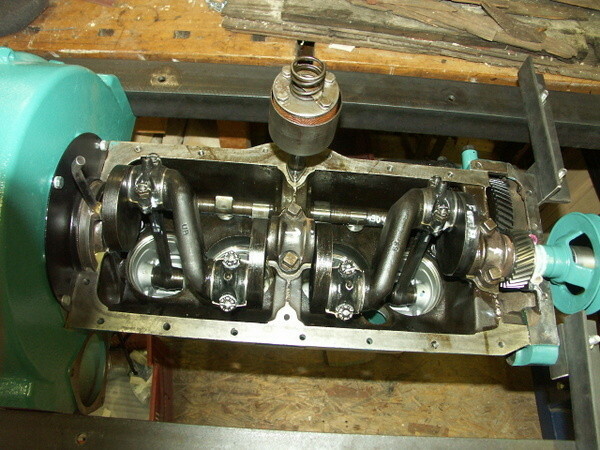 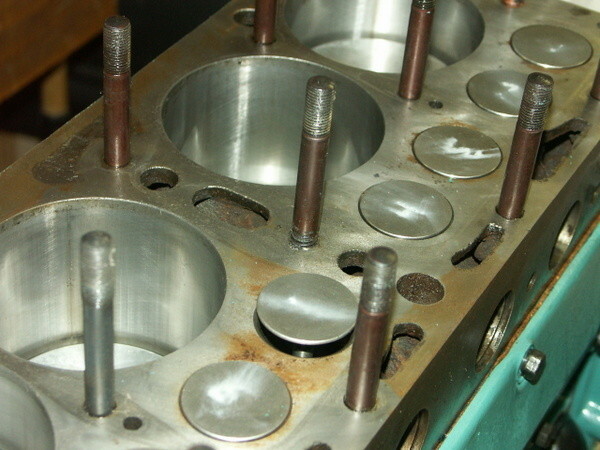 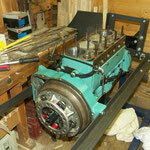 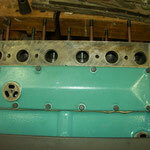 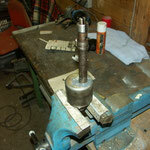 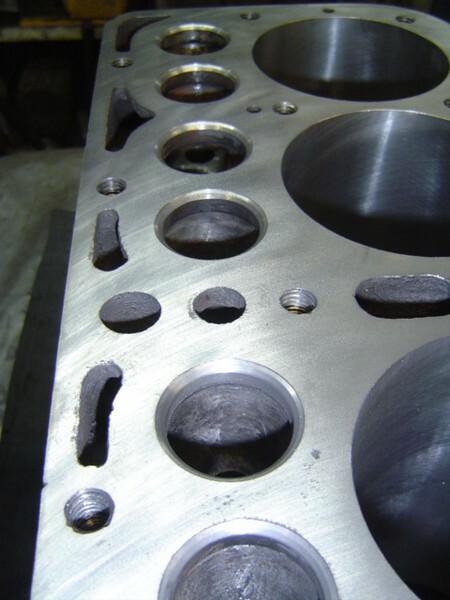 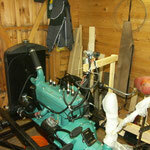 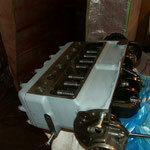 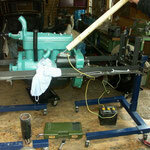 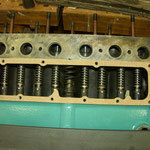 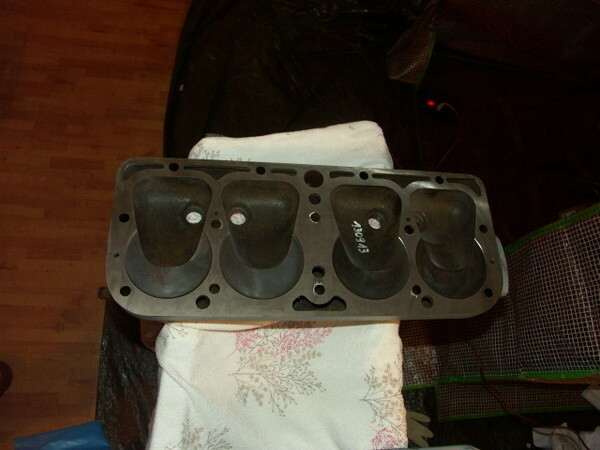 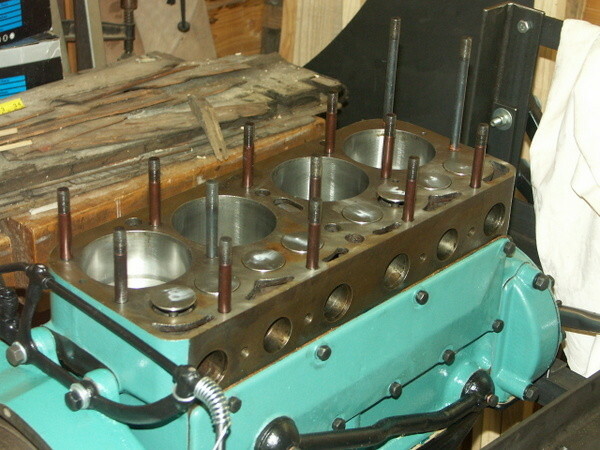 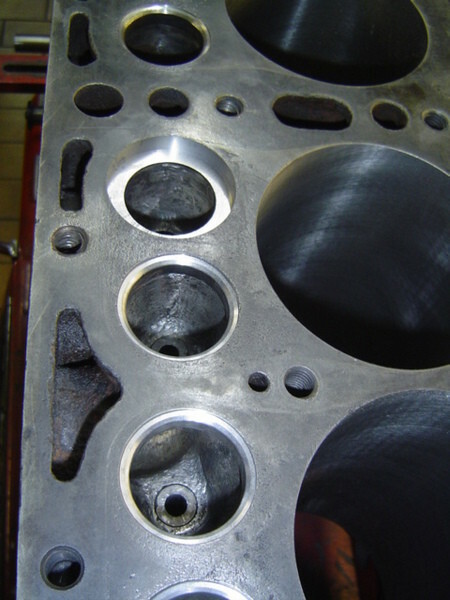 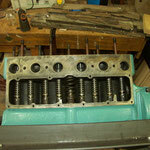 Assembling and fitting crankshaft, pistons, rods, camshaft, valves and head. 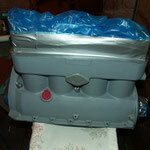 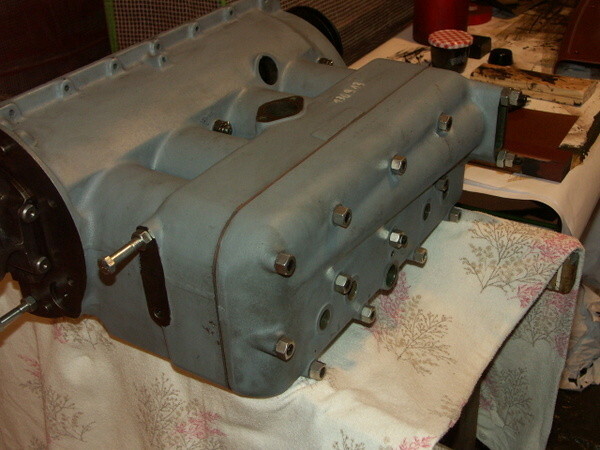 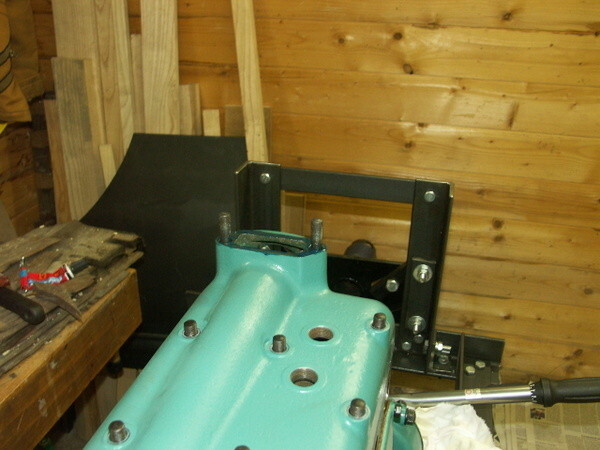 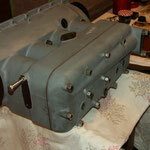 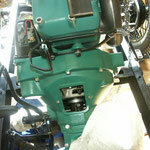 Timing covers, valve cover, distributor drive gear and spring assembled. 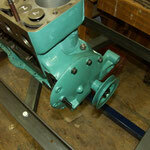 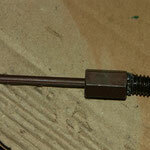 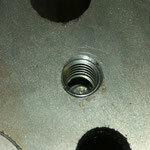 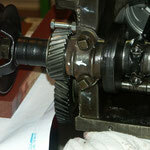 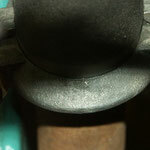 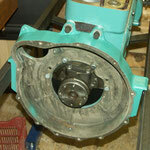 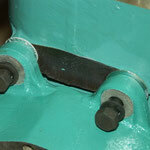 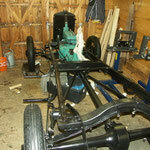 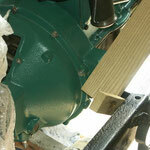 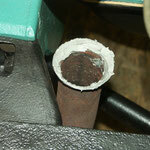 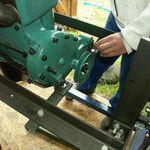 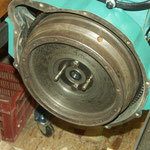 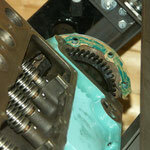 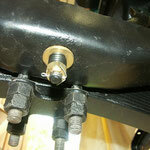 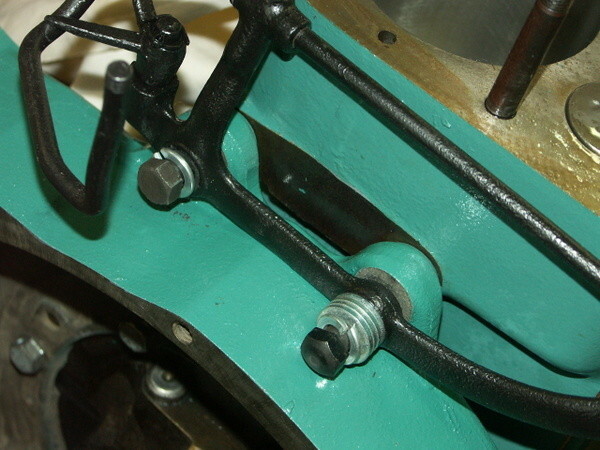 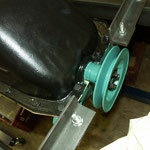 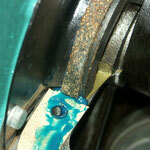 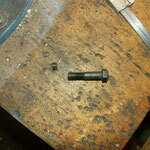 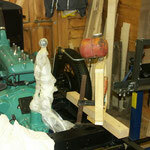 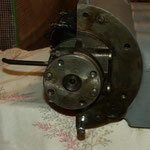 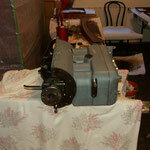 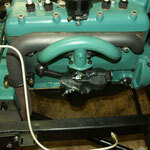 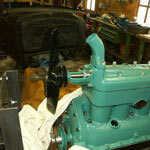 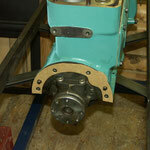 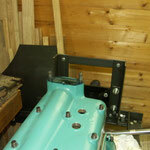 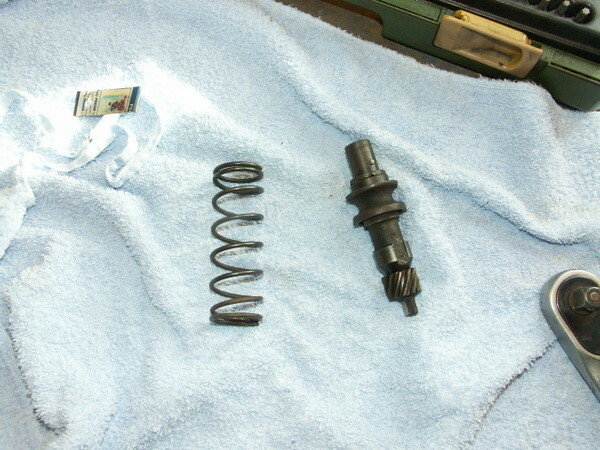 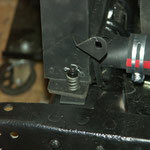 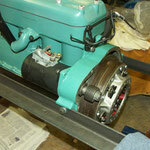 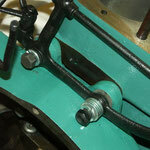 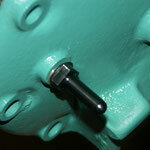 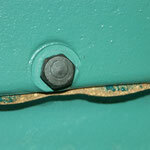 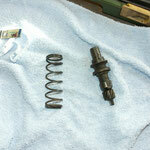 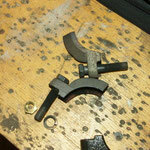 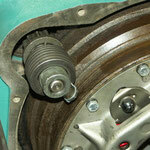 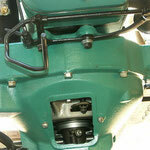 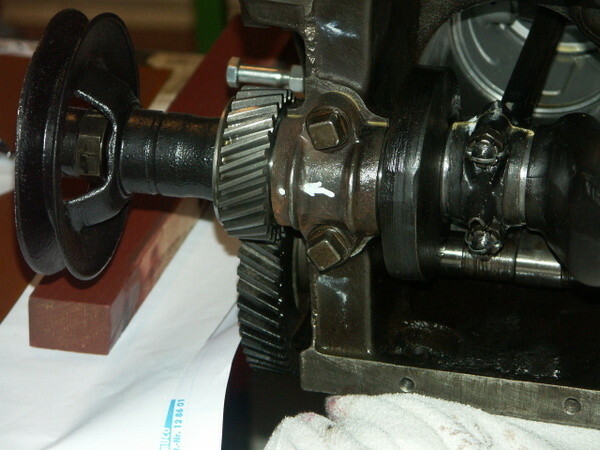 During the assembly of the Flywheel housing one of the threads in the block at the accelerator assembly bolts broke. 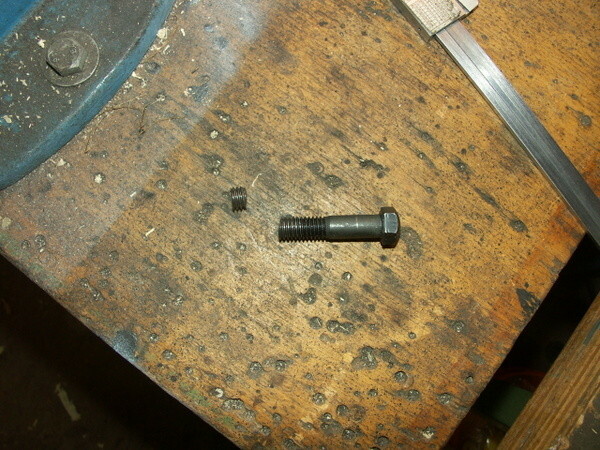 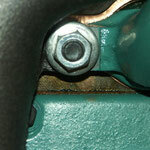 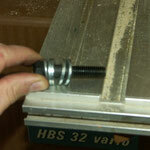 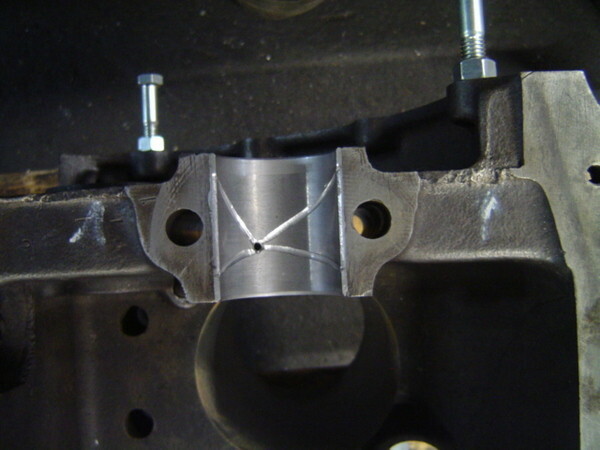 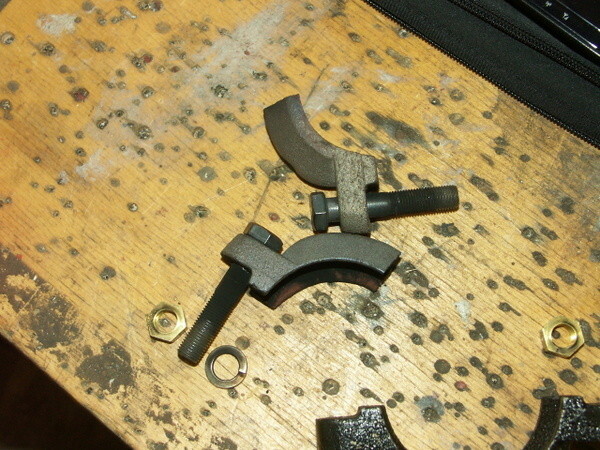 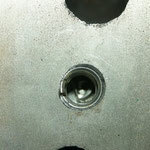 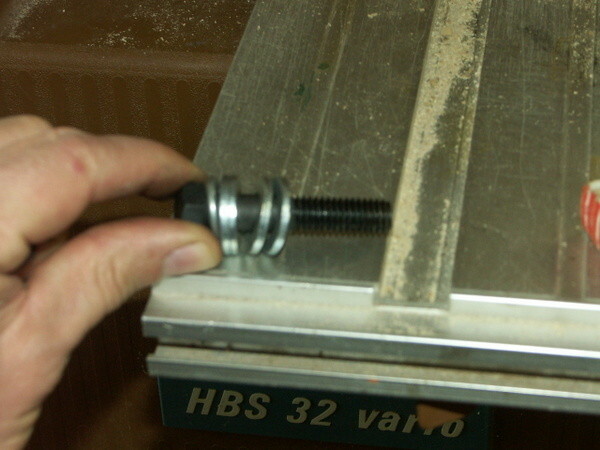 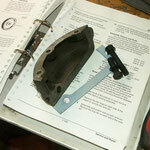 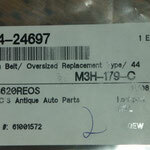 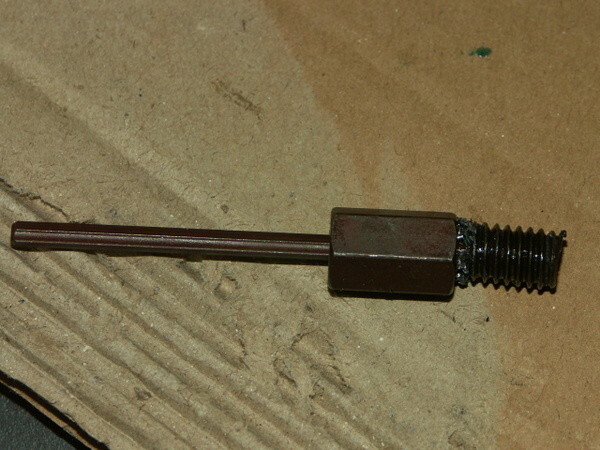 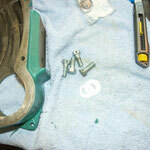 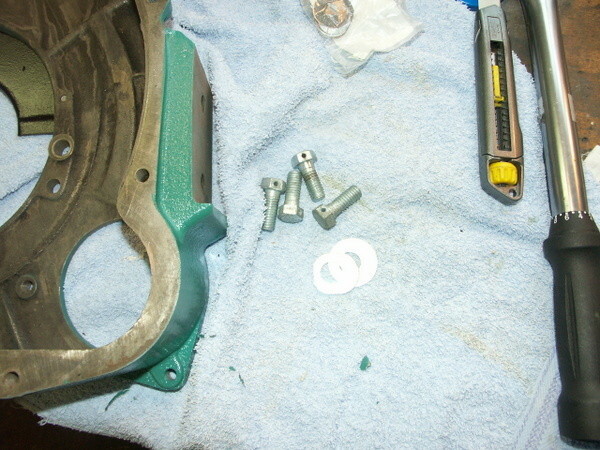 We replaced the bolt with a longer one out of the "side timing cover bolt set", which had to be cut to length. 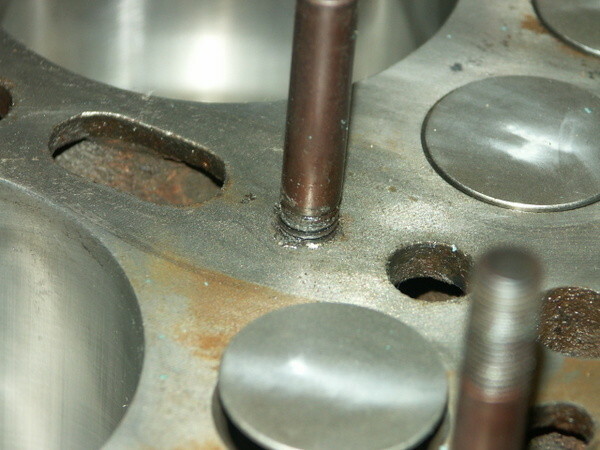 The threads in the block were luckyly deep enough! 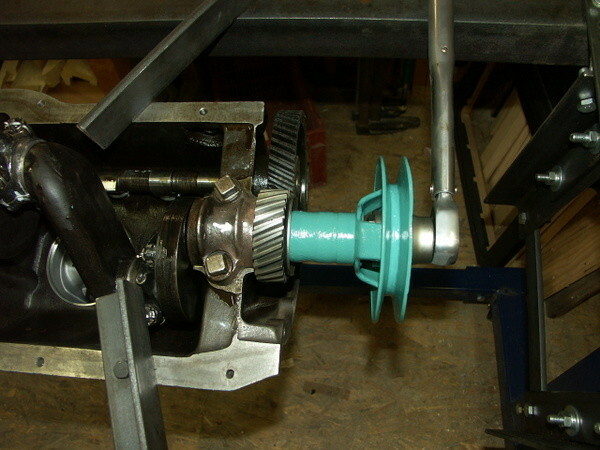 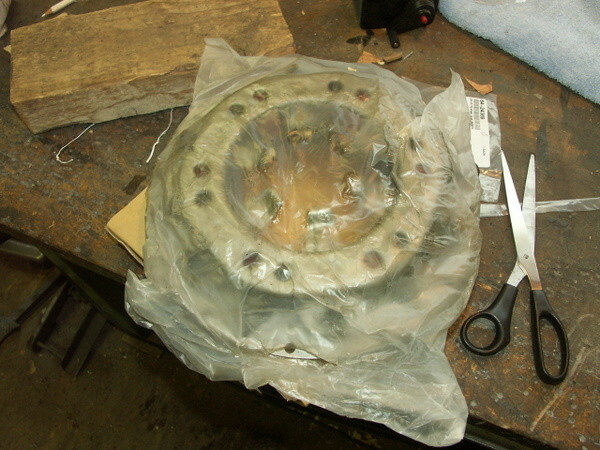 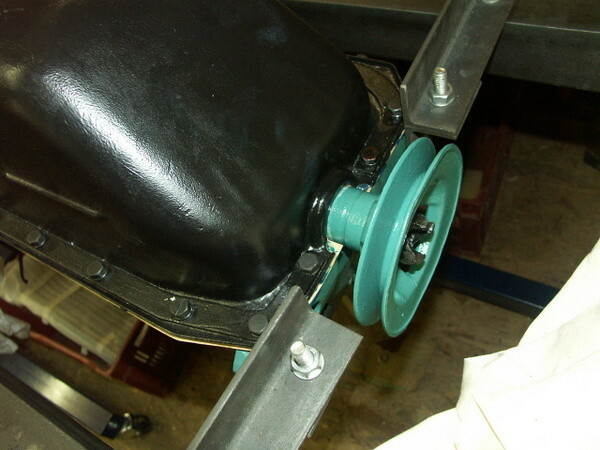 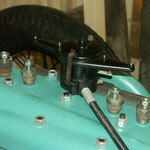 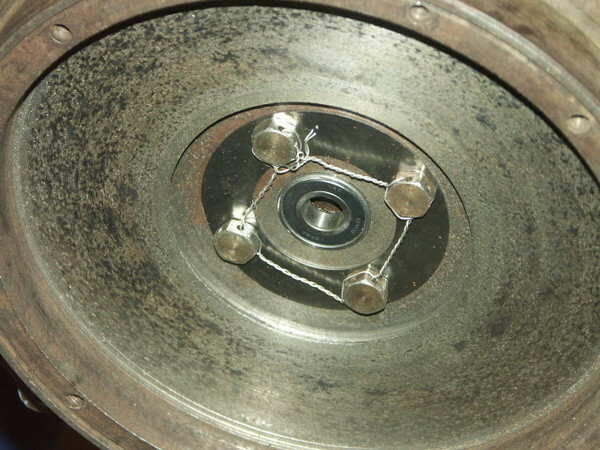 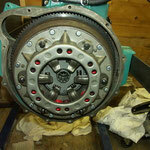 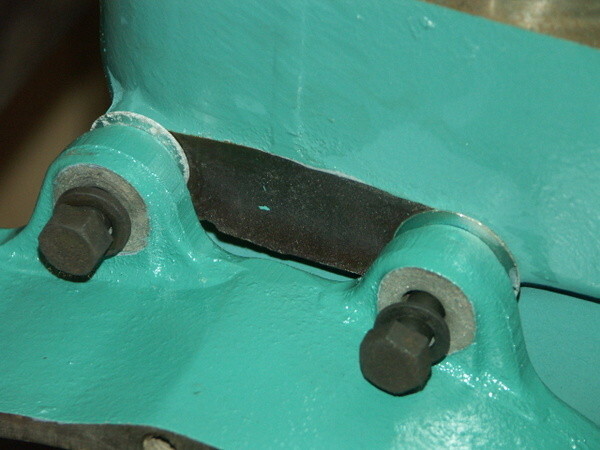 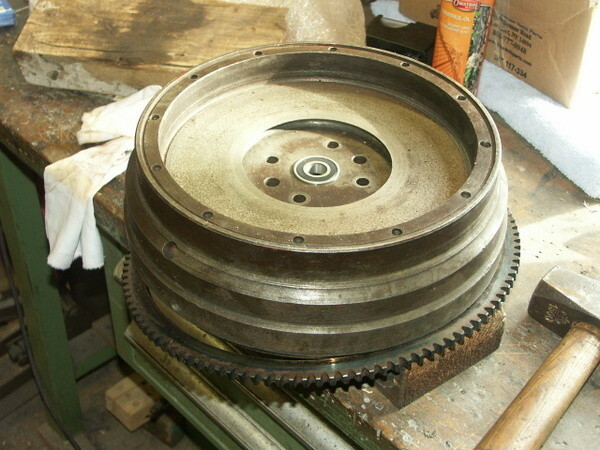 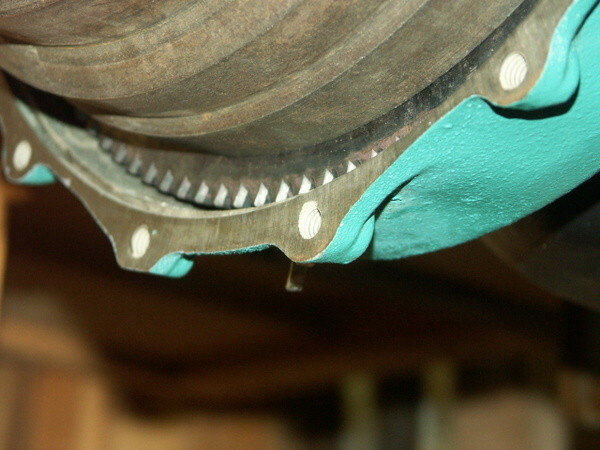 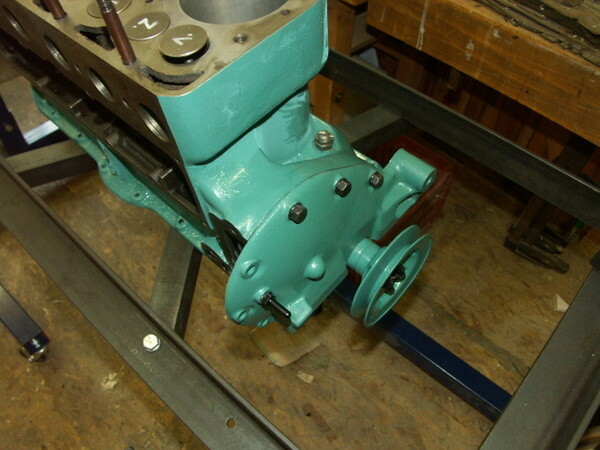 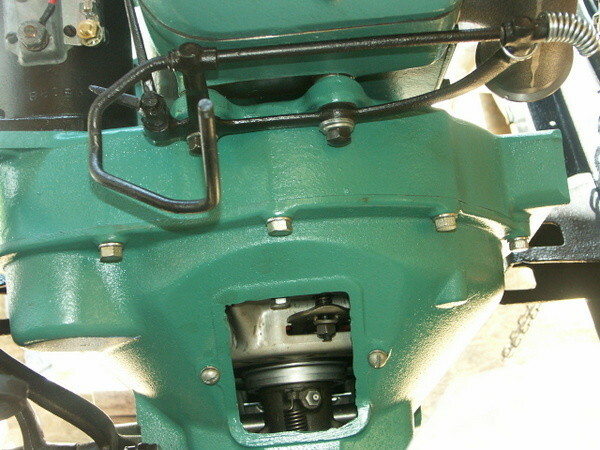 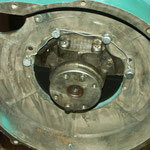 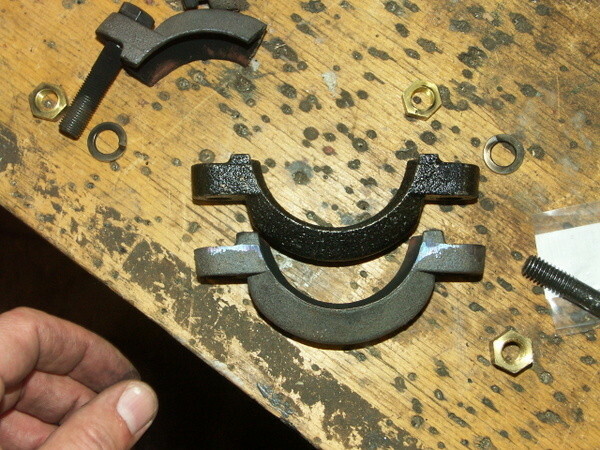 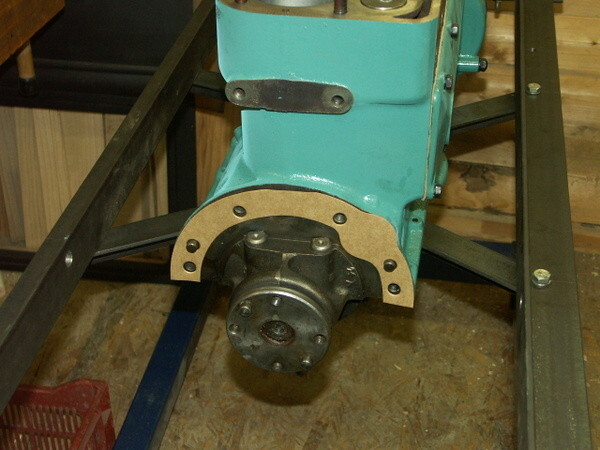 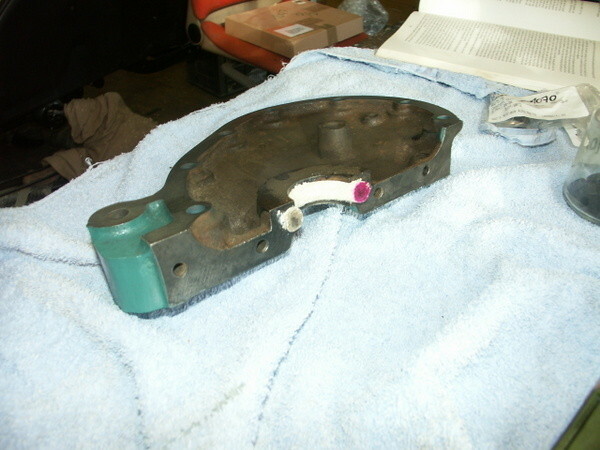 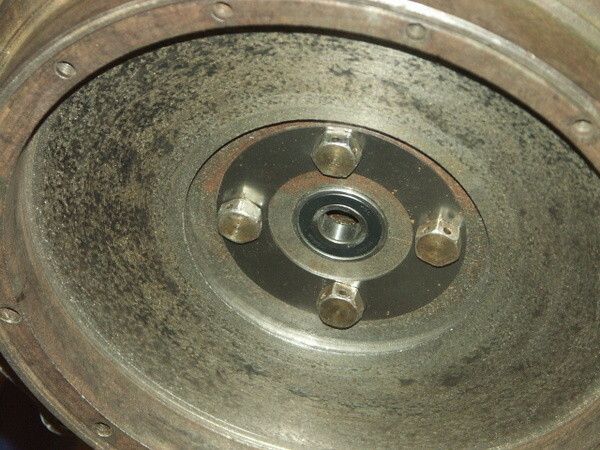 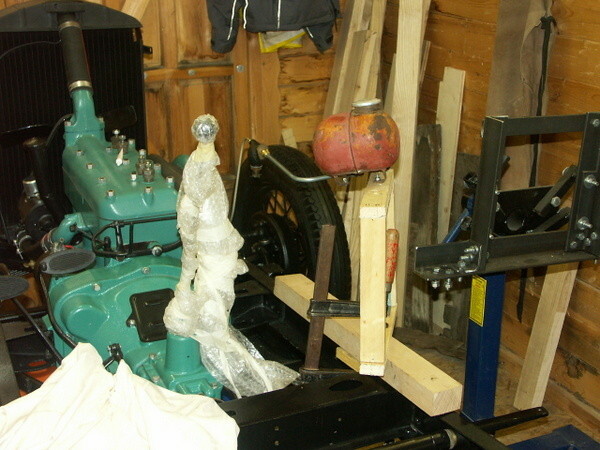 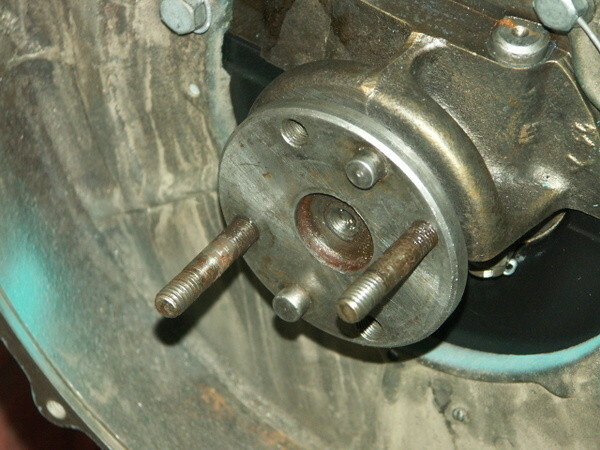 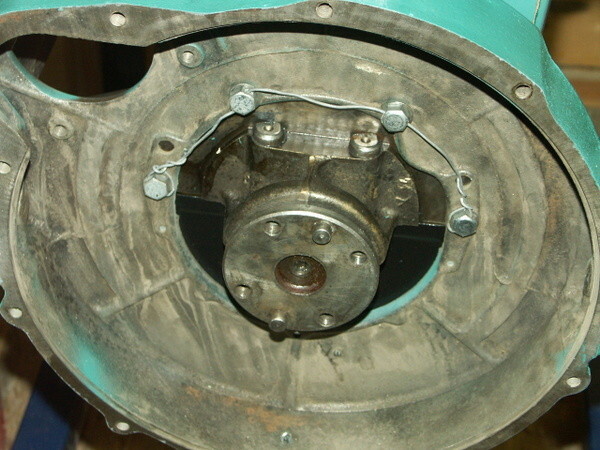 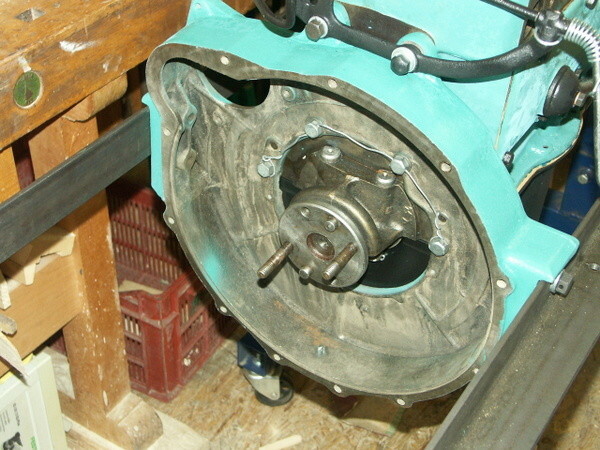 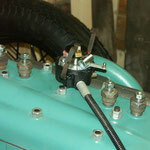 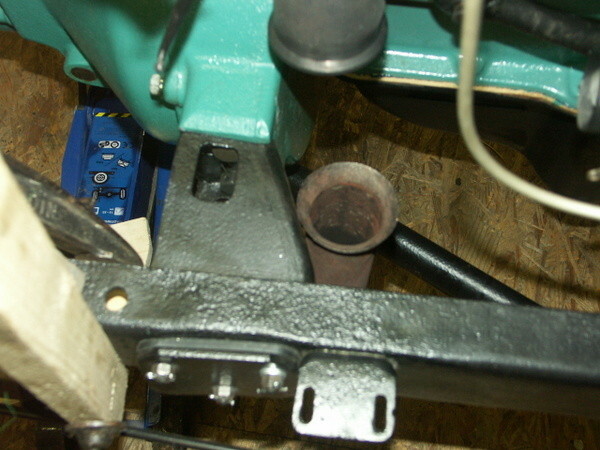 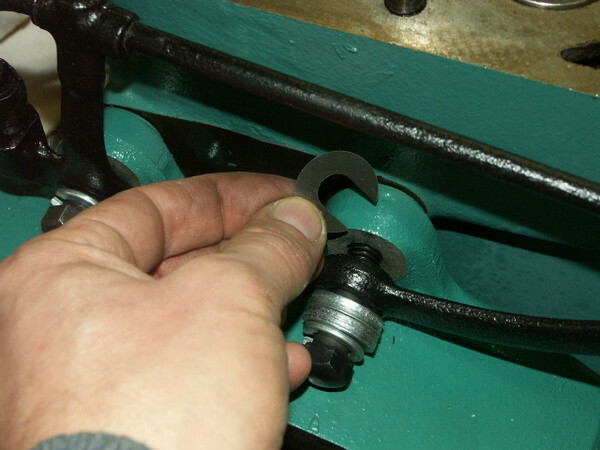 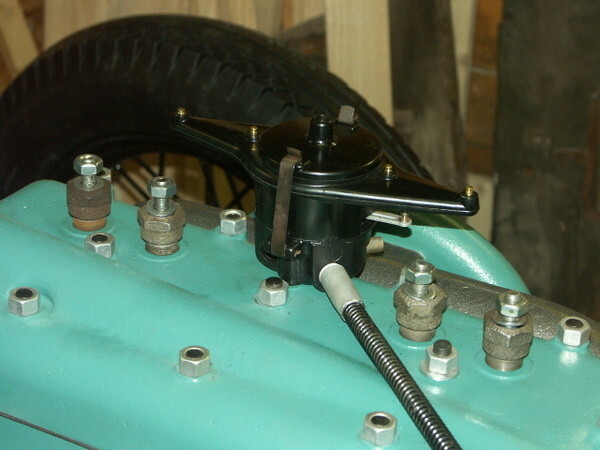 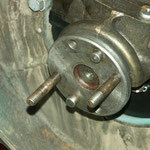 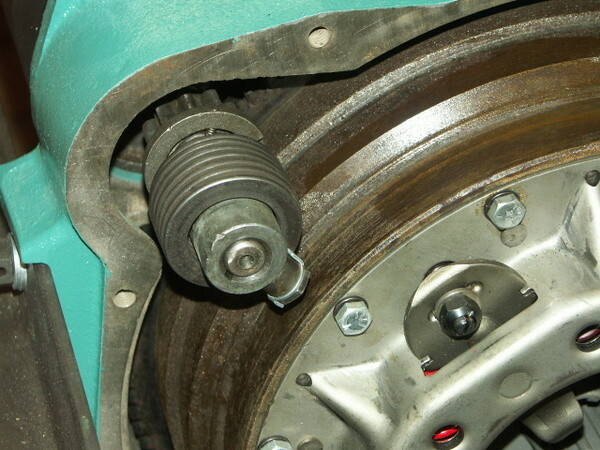 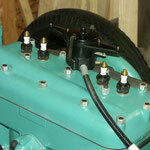 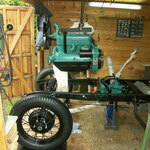 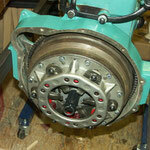 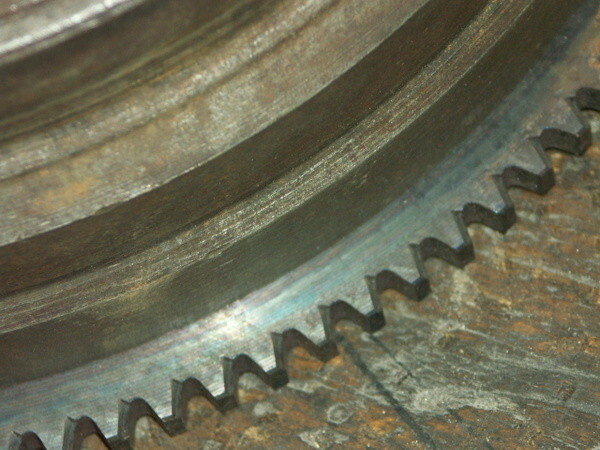 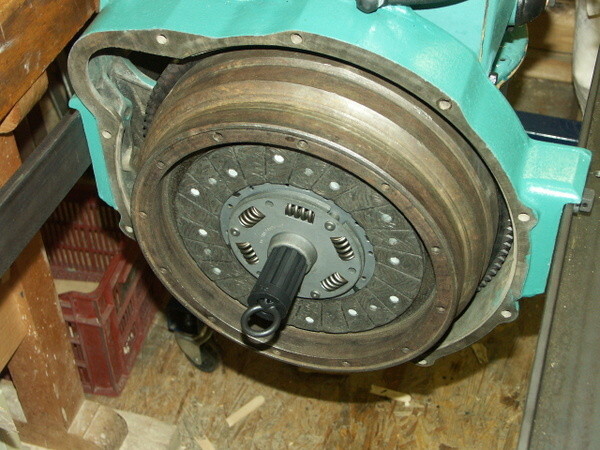 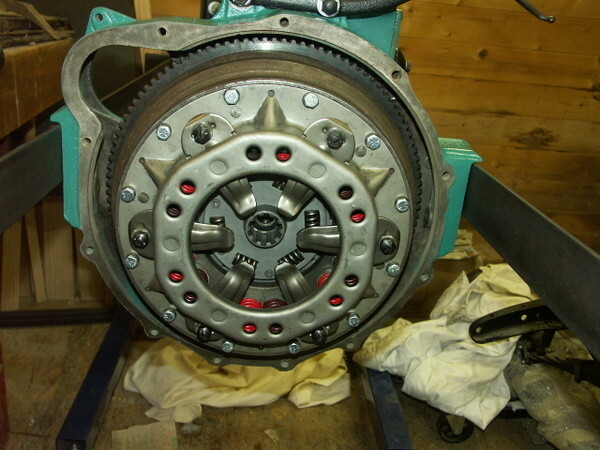 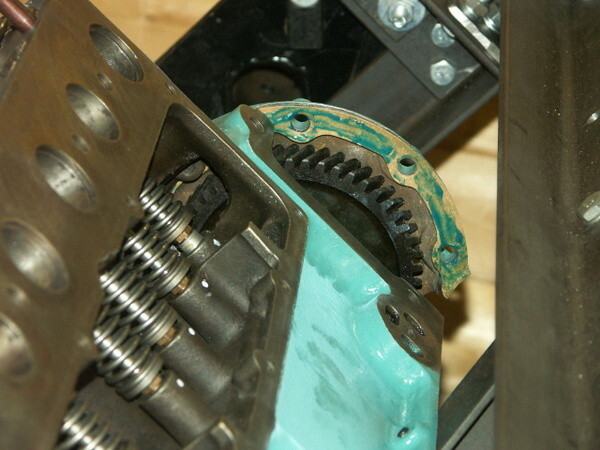 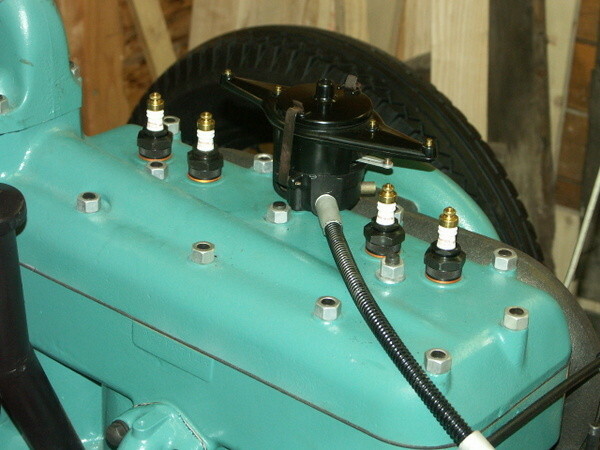 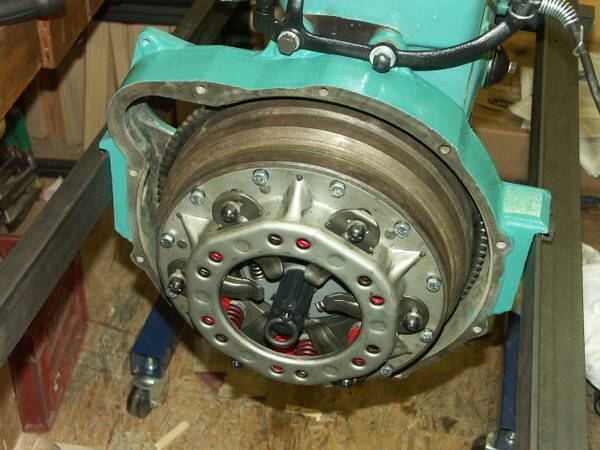 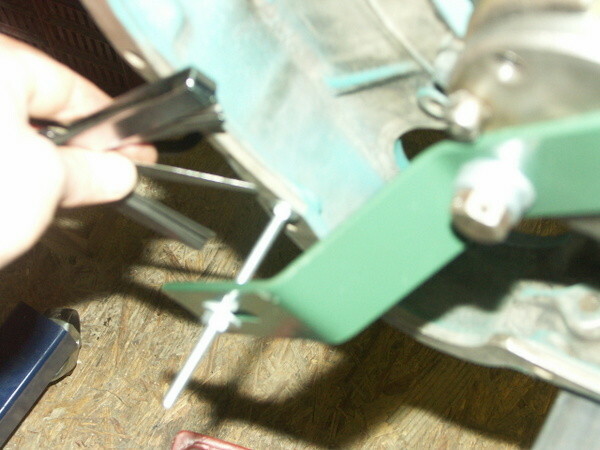 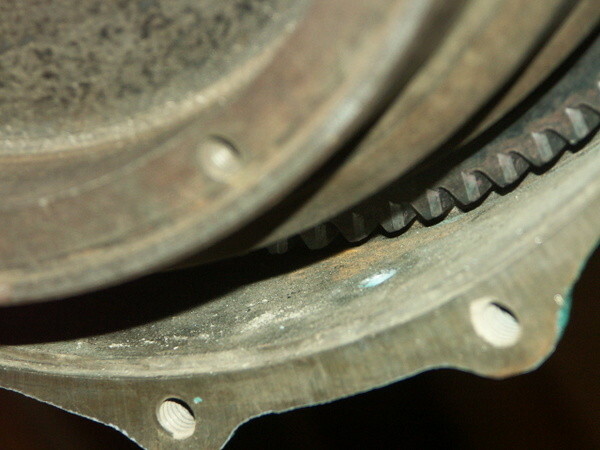 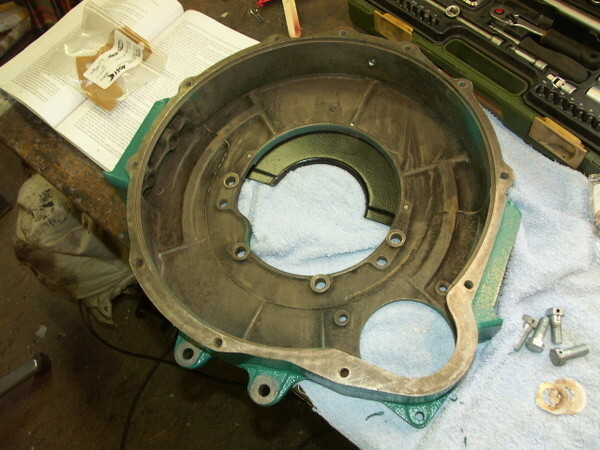 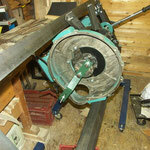 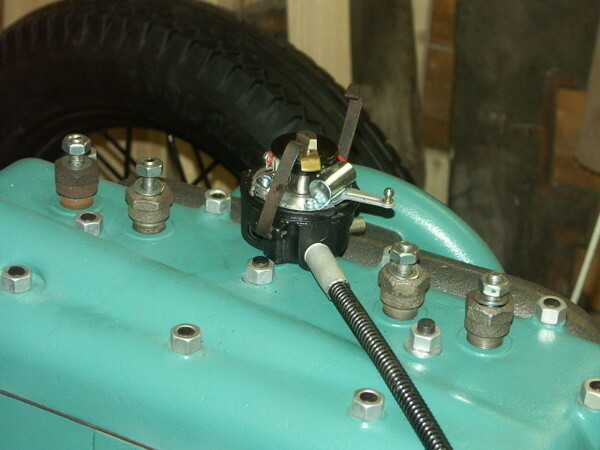 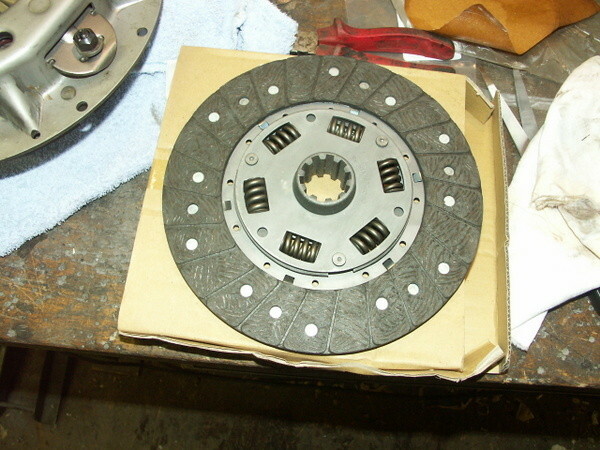 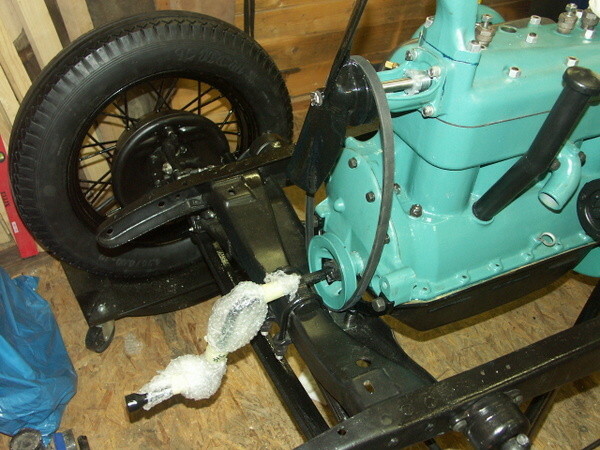 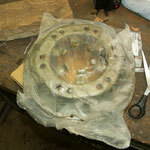 The adjustment of the flywheel housing was done as discribed by Les Andrews. 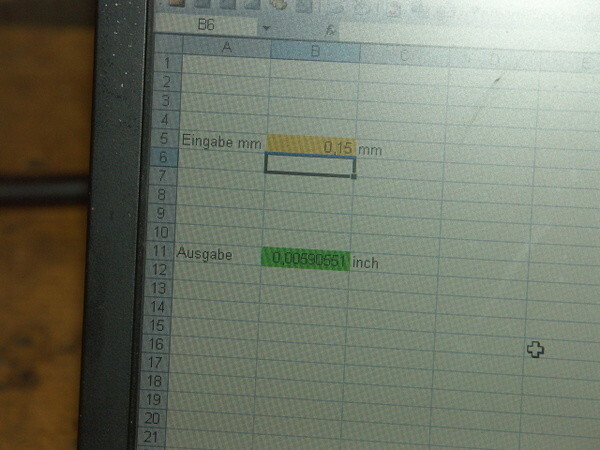 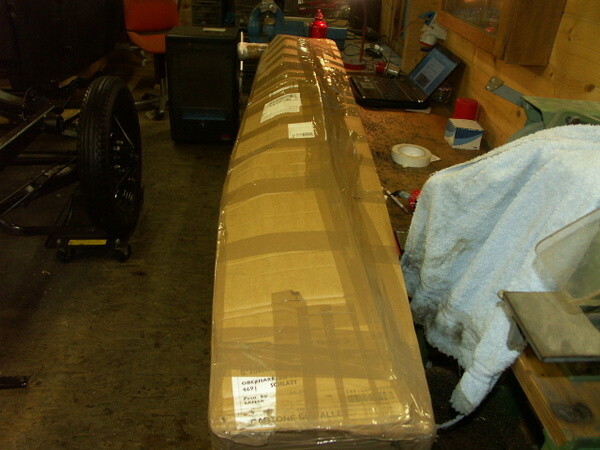 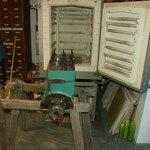 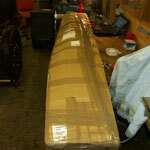 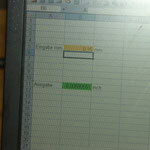 We could get the variation down to 0,008 inches, we hope good enough. 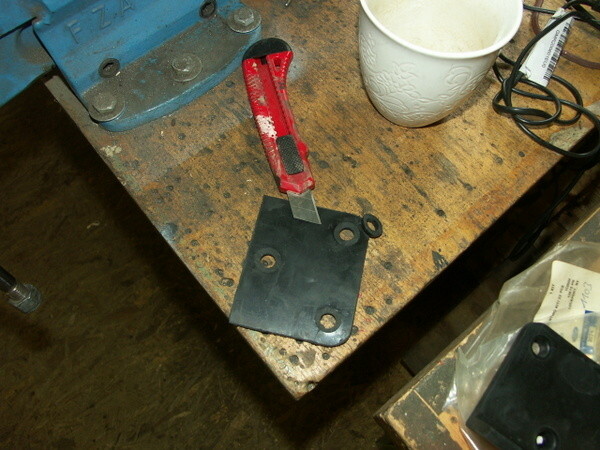 The used shims had in the end the same thickness as the original ones. 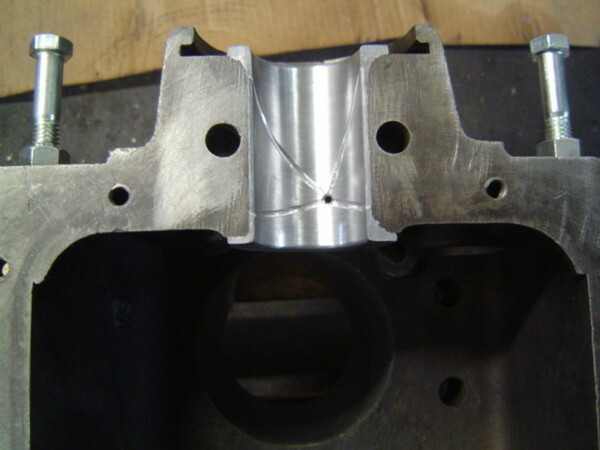 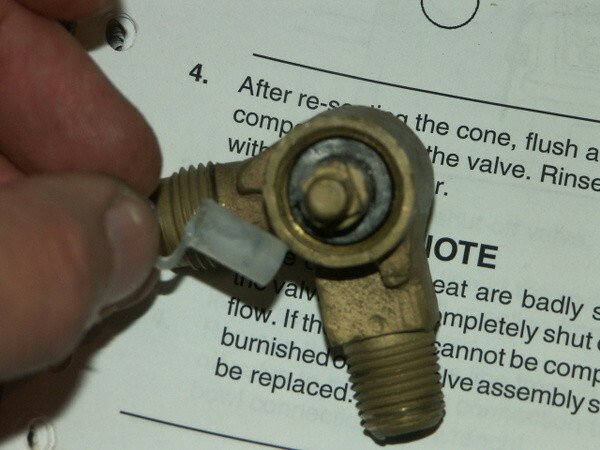 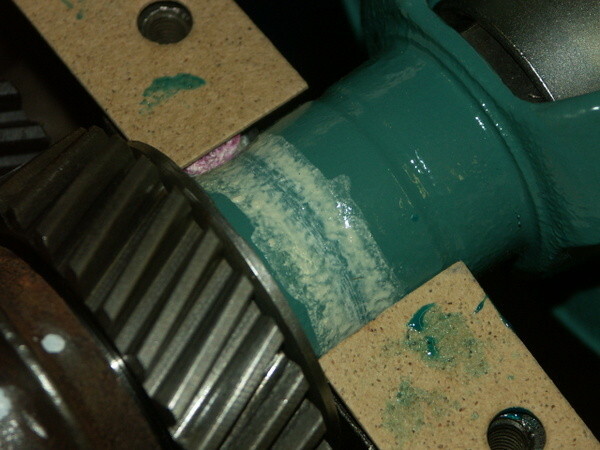 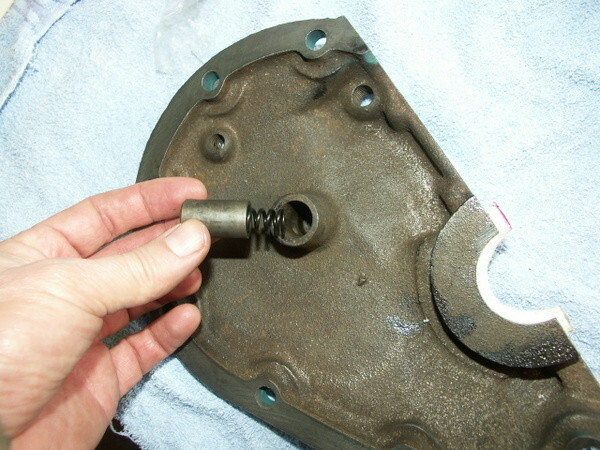 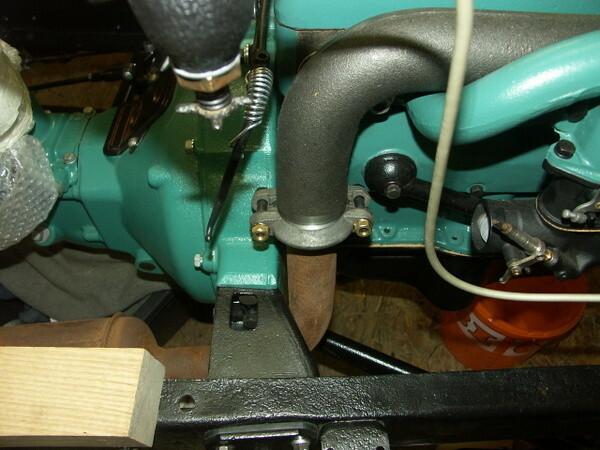 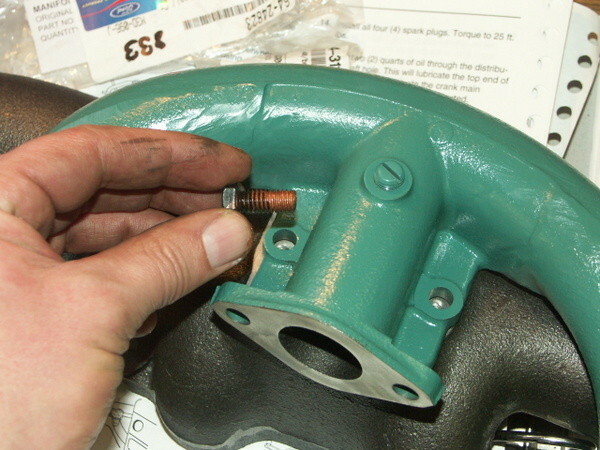 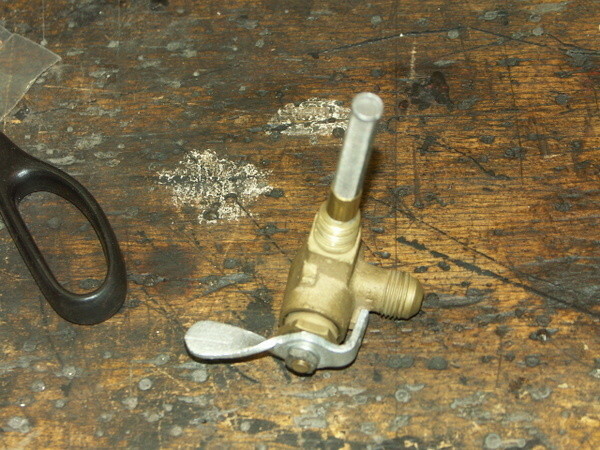 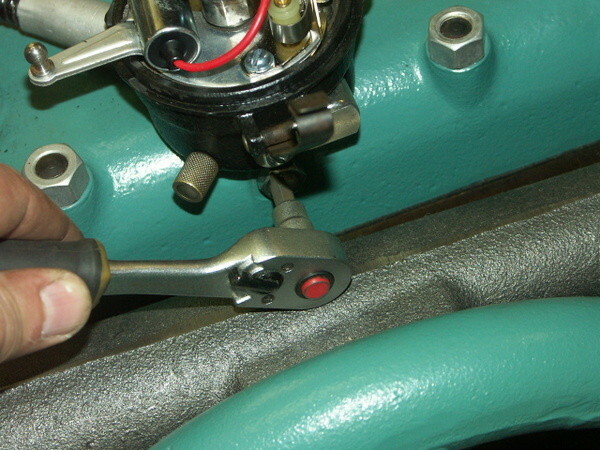 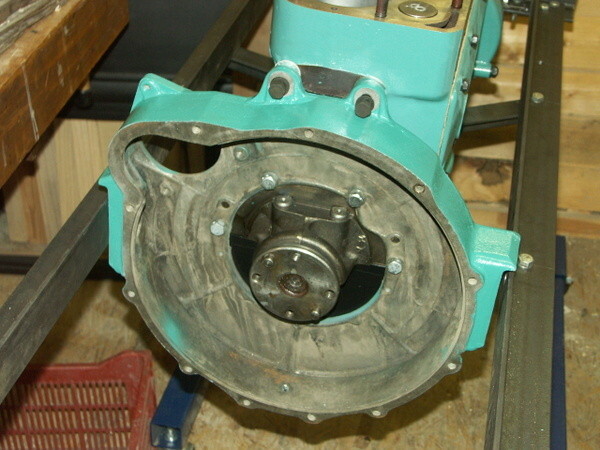 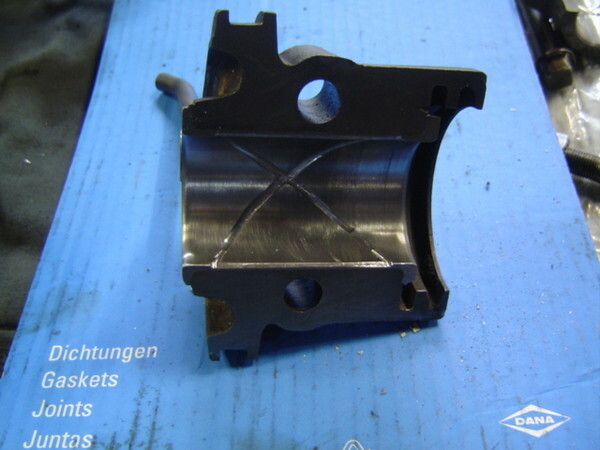 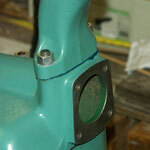 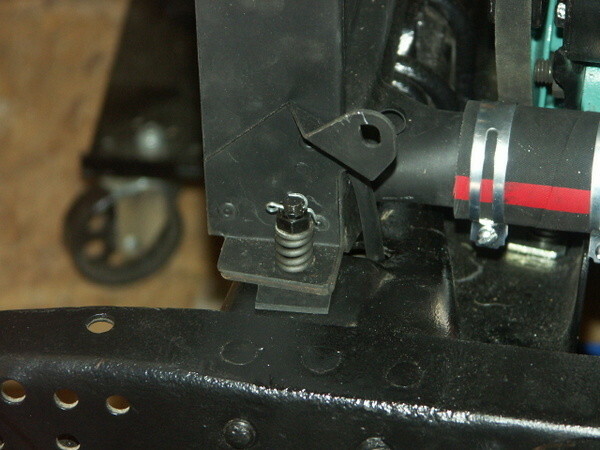 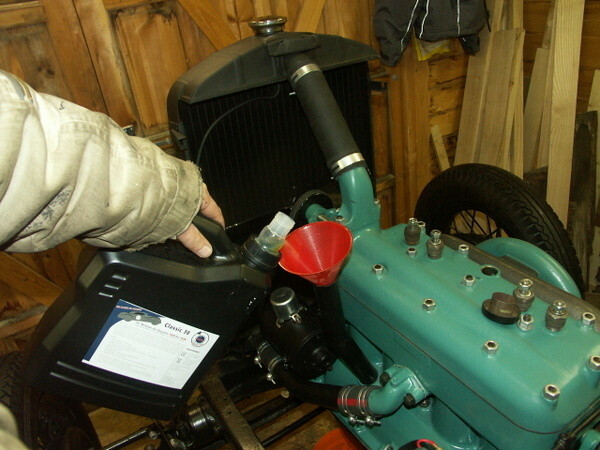 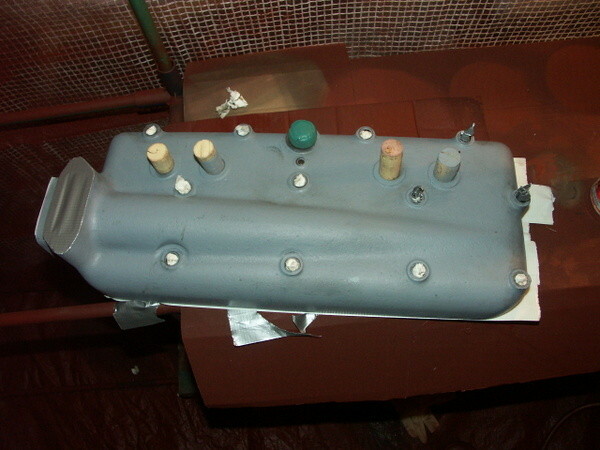 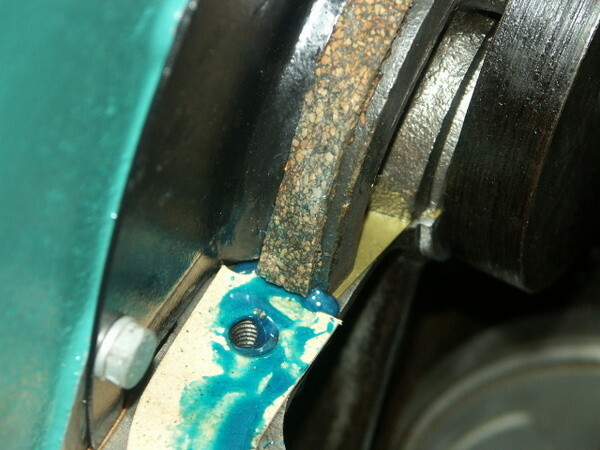 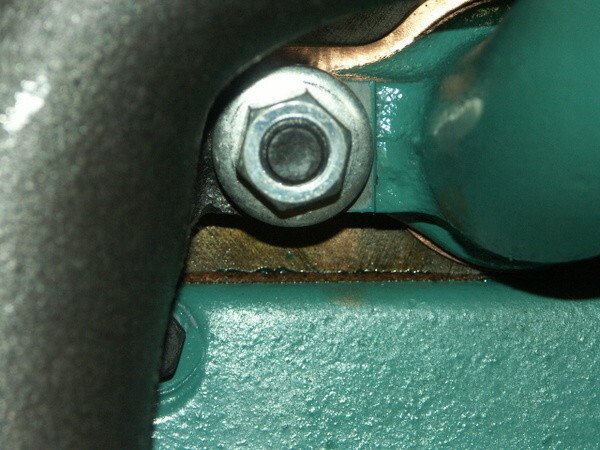 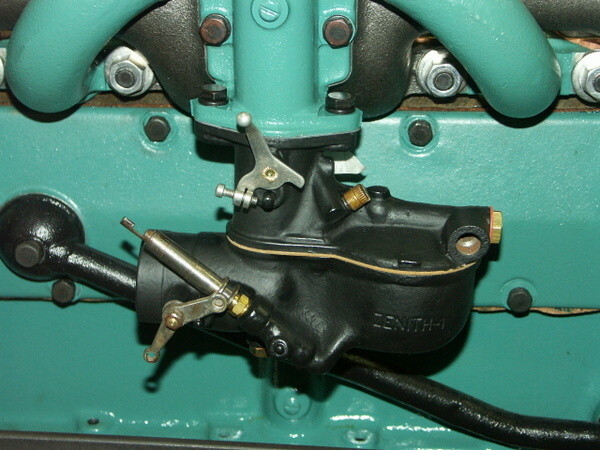 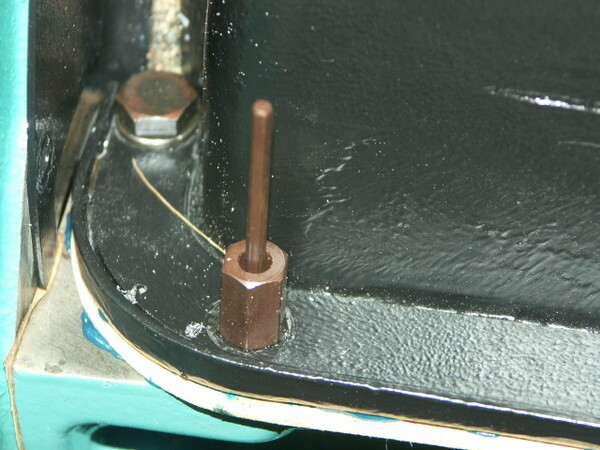 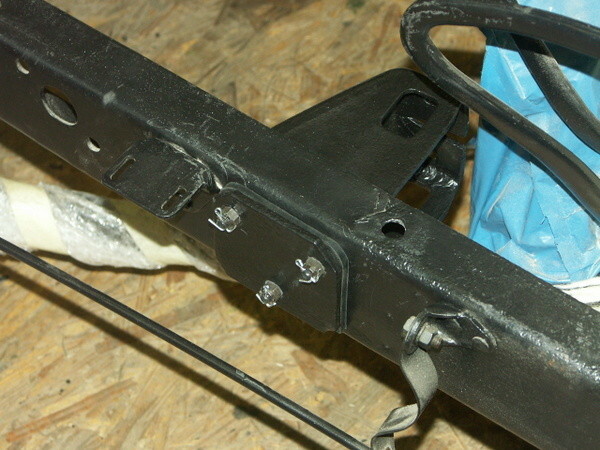 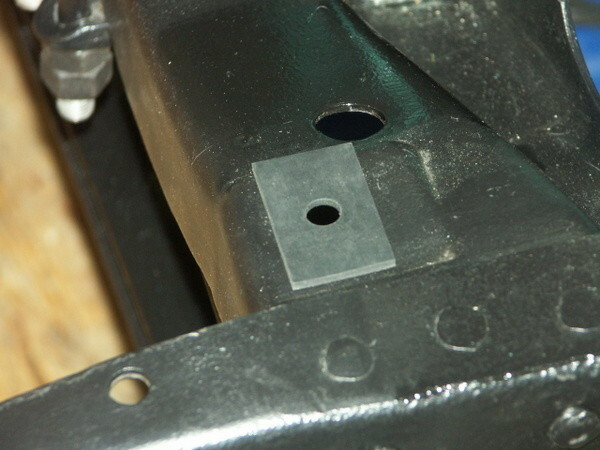 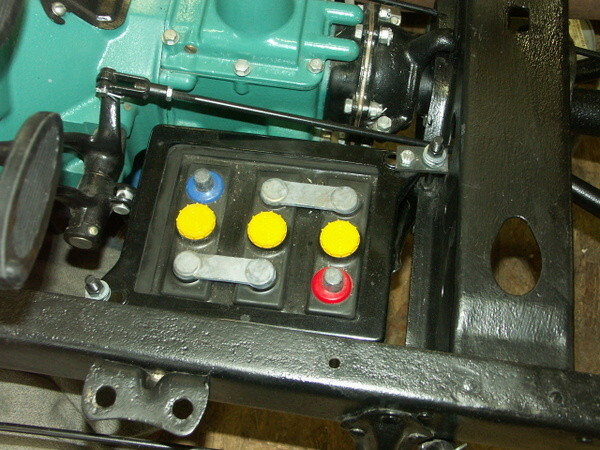 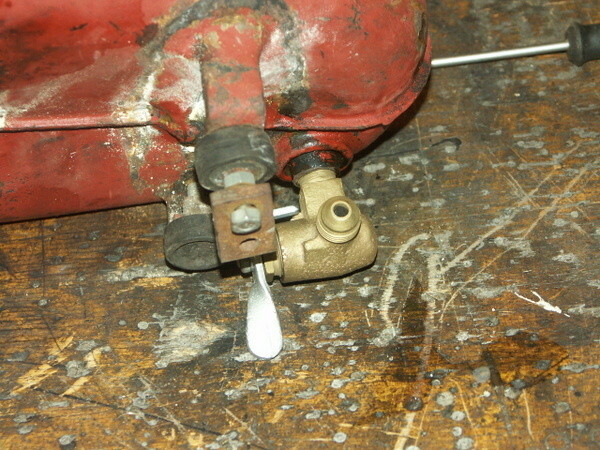 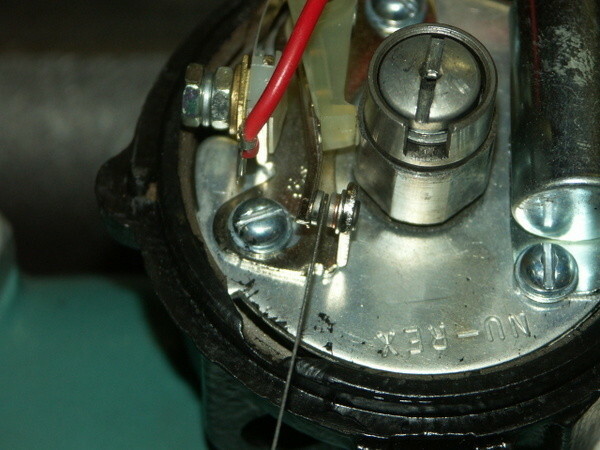 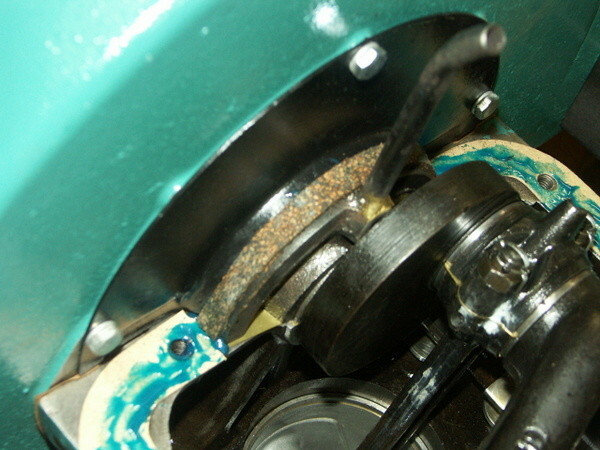 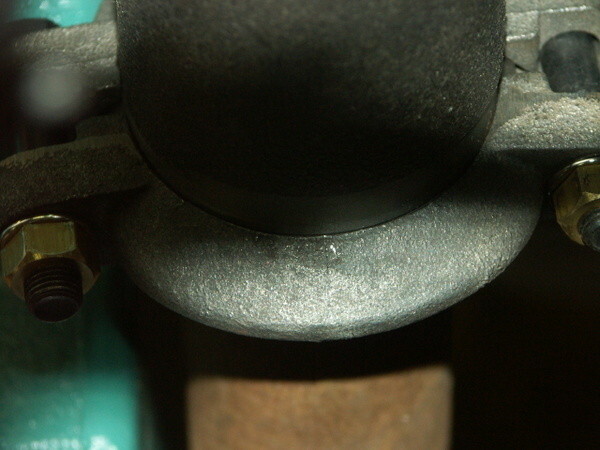 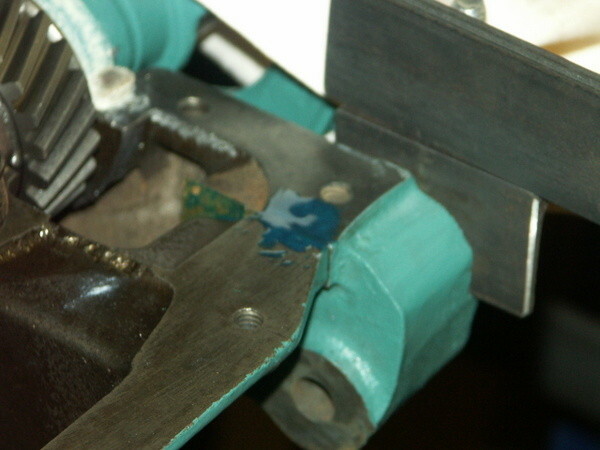 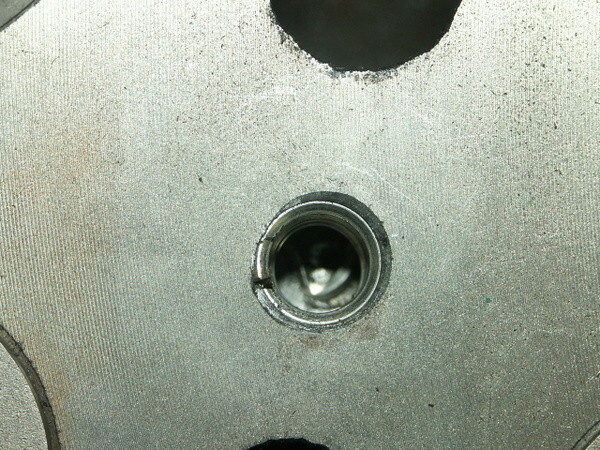 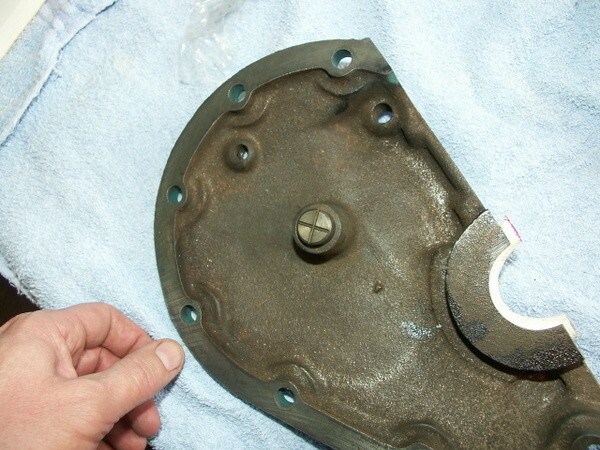 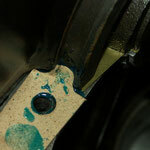 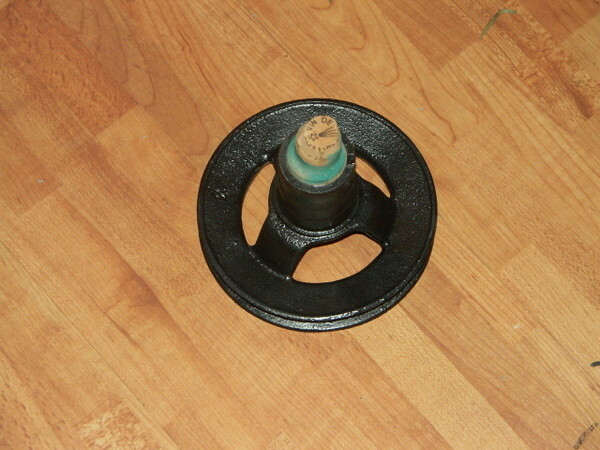 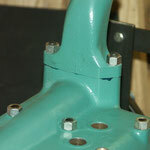 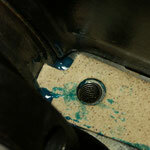 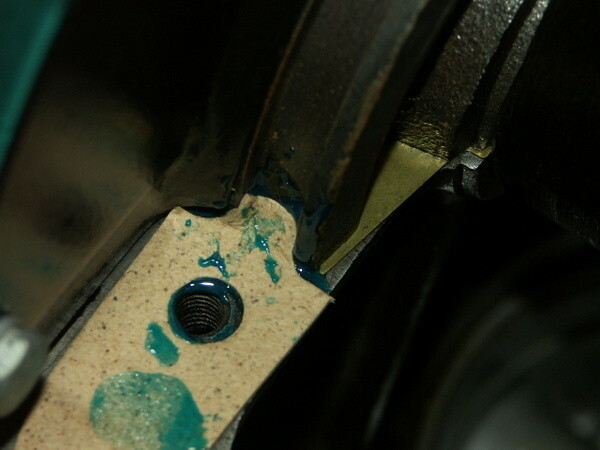 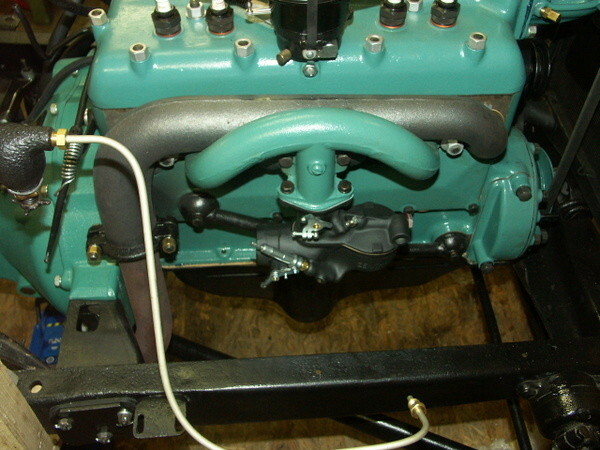 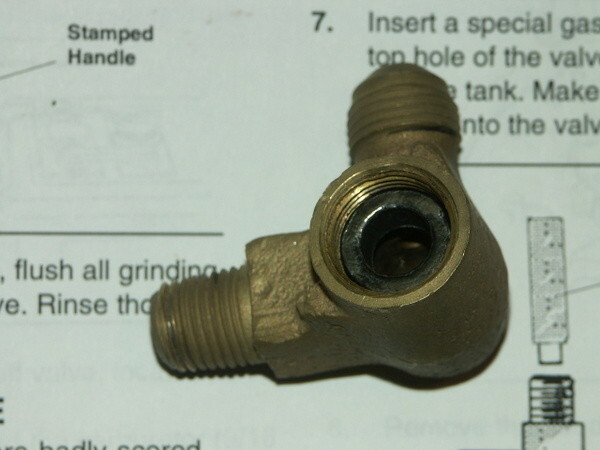 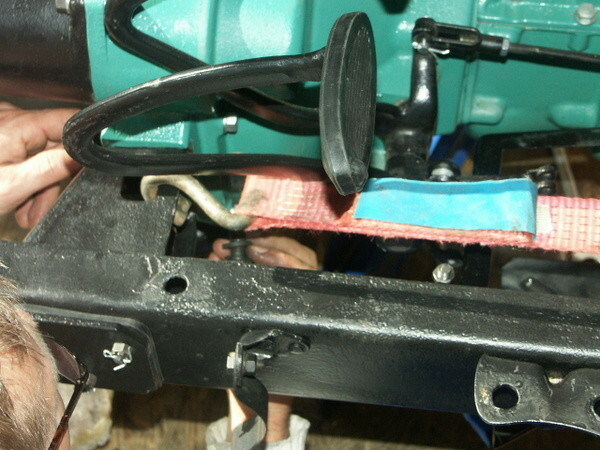 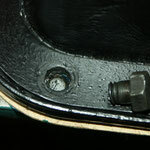 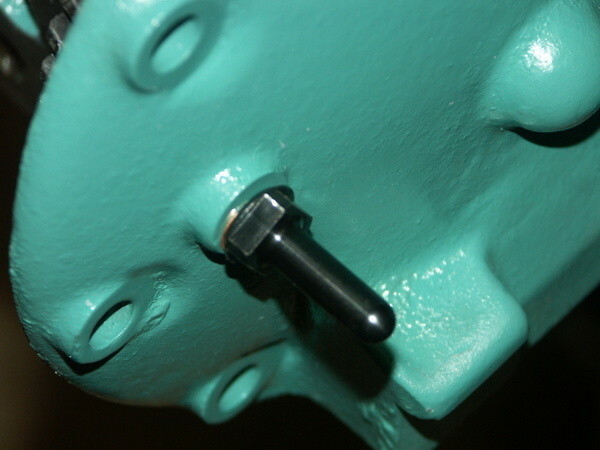 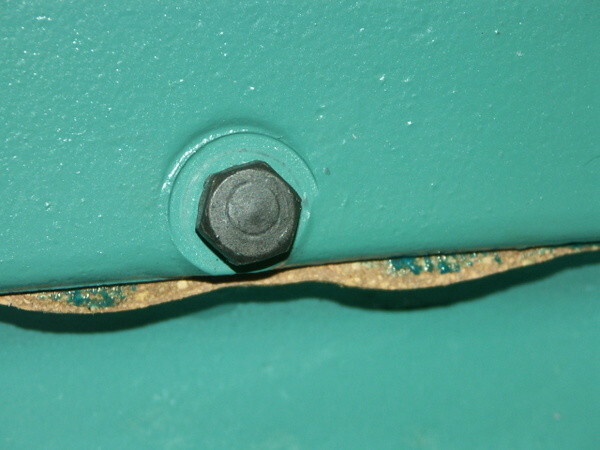 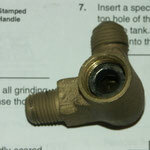 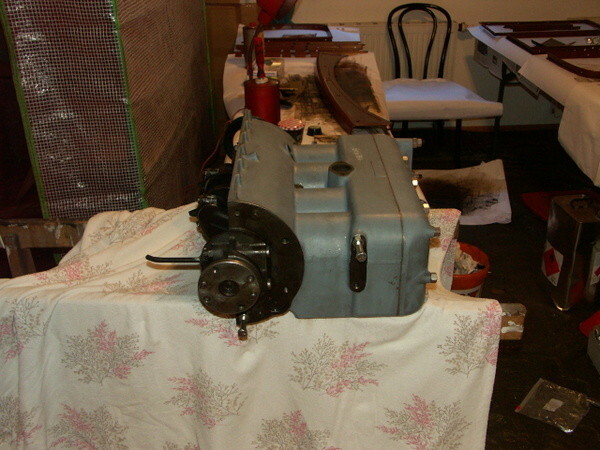 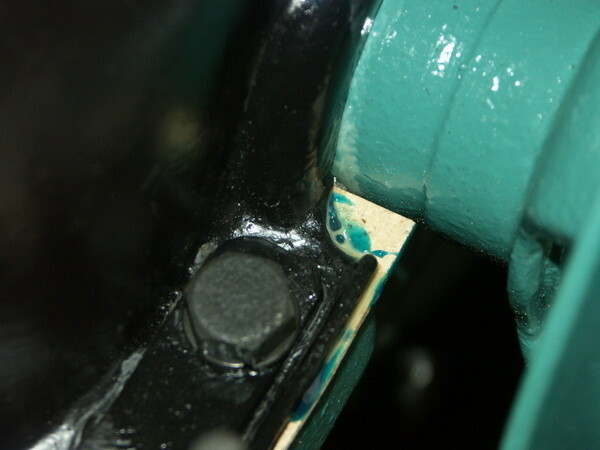 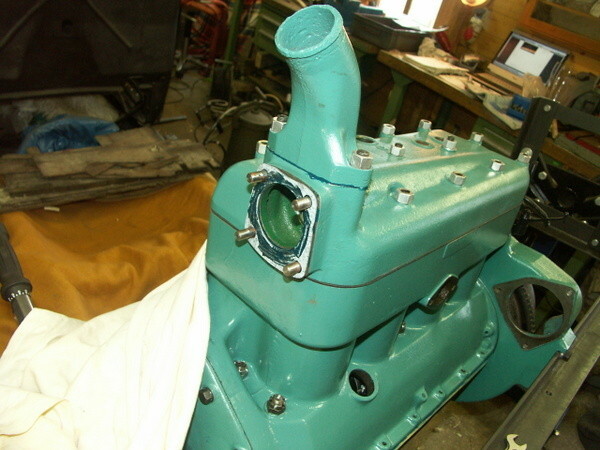 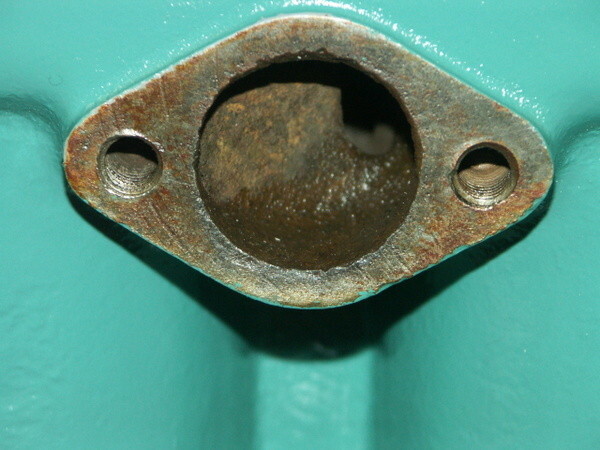 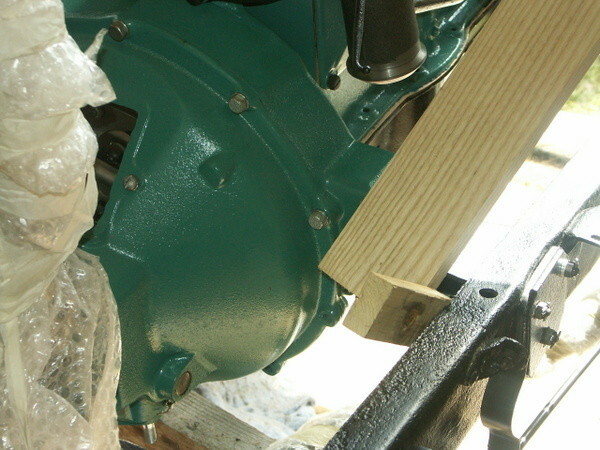 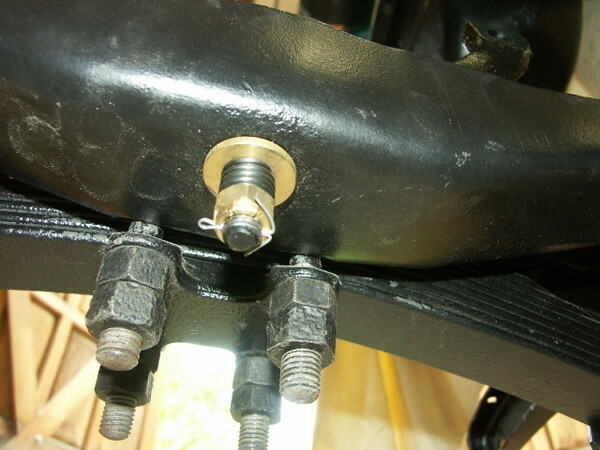 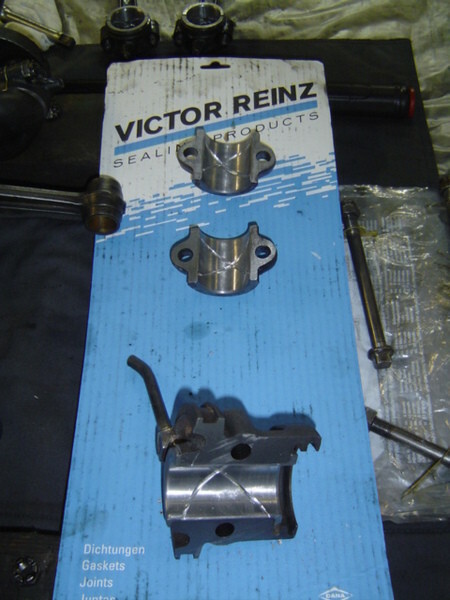 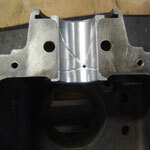 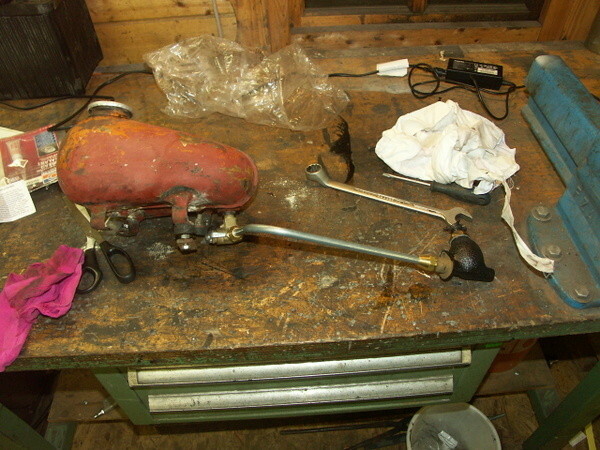 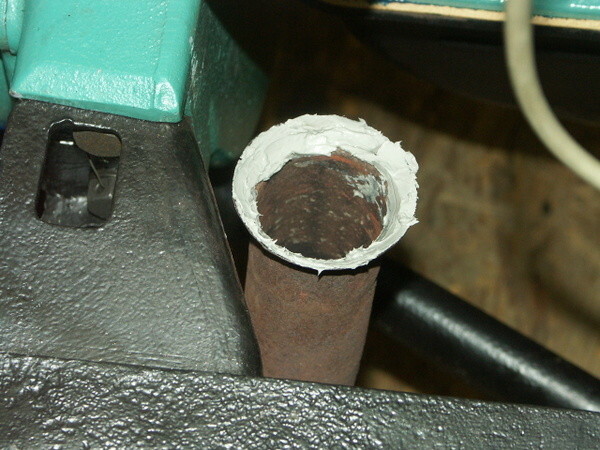 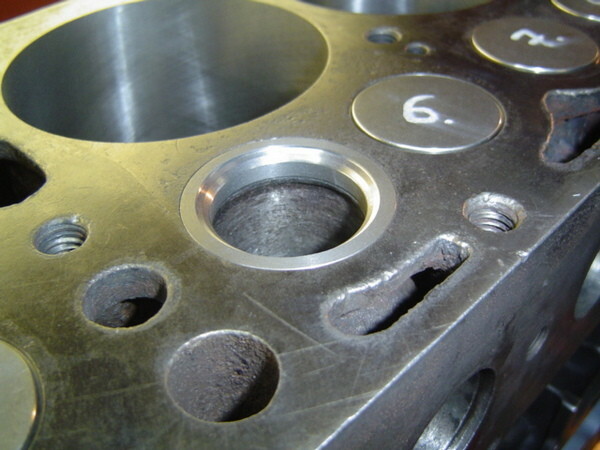 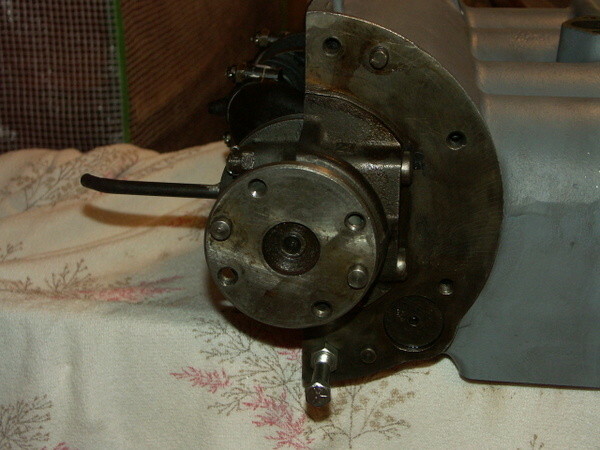 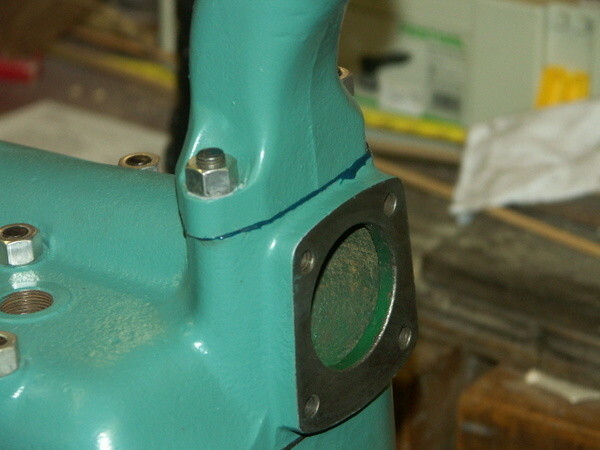 The oil pump was sealed with JB welt, as the housing came loose during assembly. 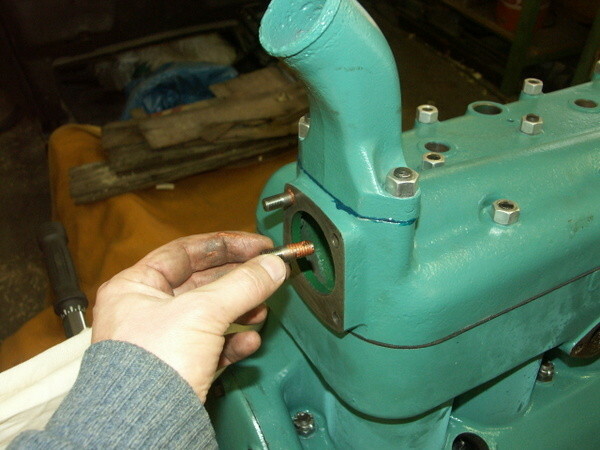 One of the original engine bolts broke and had to be replaced by a reproduction. 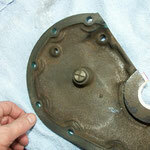 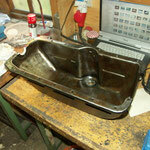 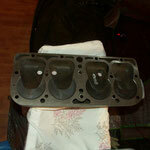 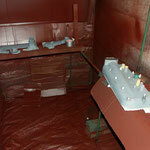 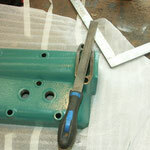 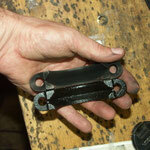 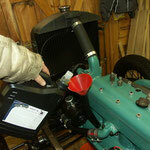 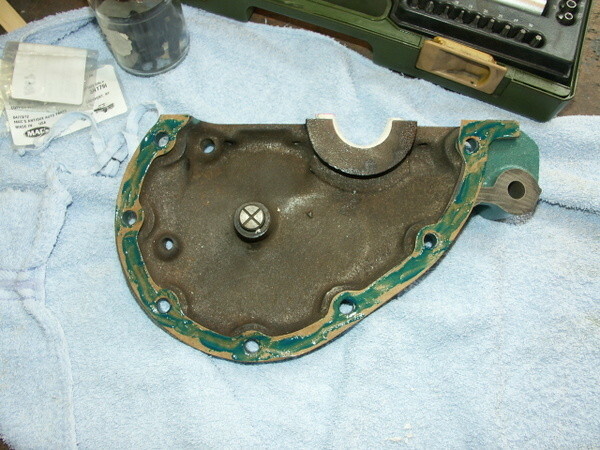 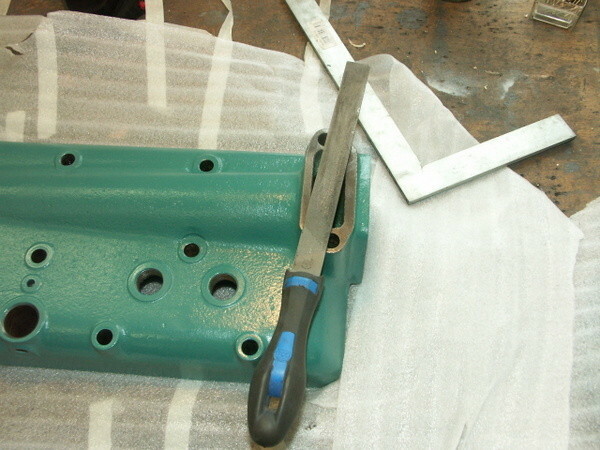 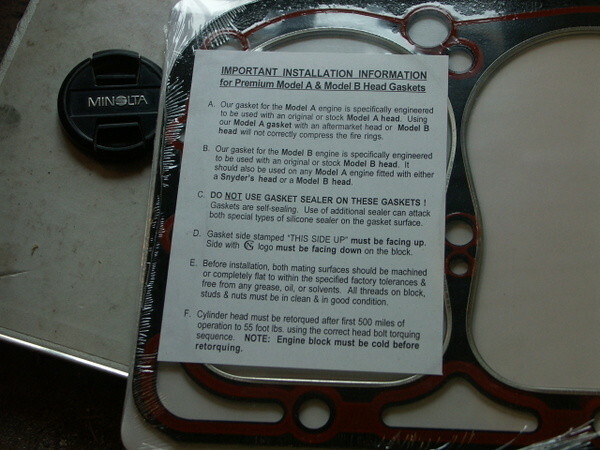 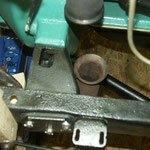 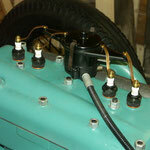 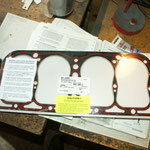 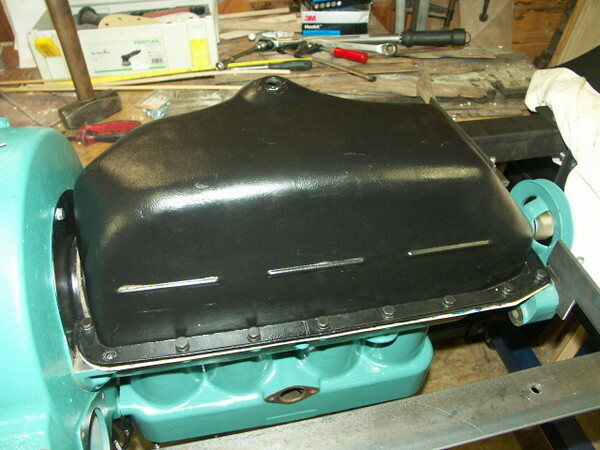 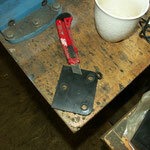 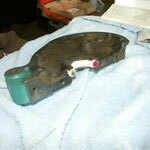 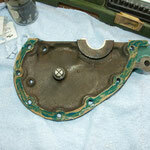 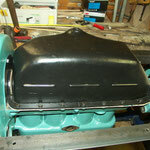 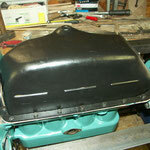 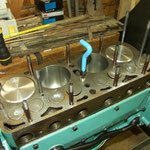 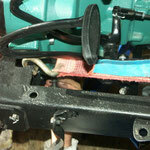 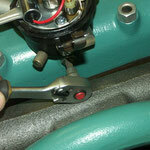 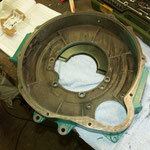 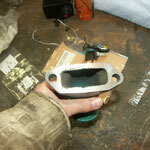 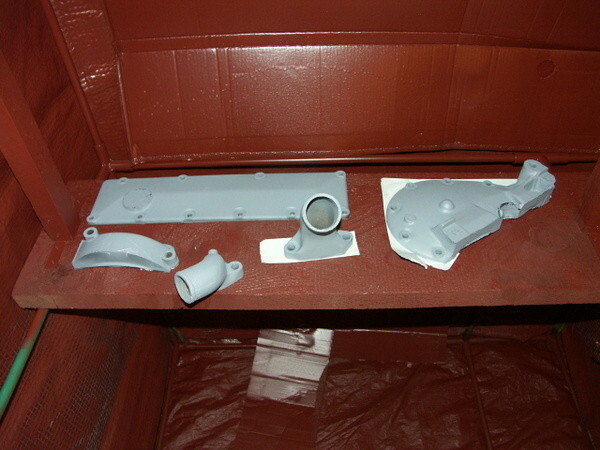 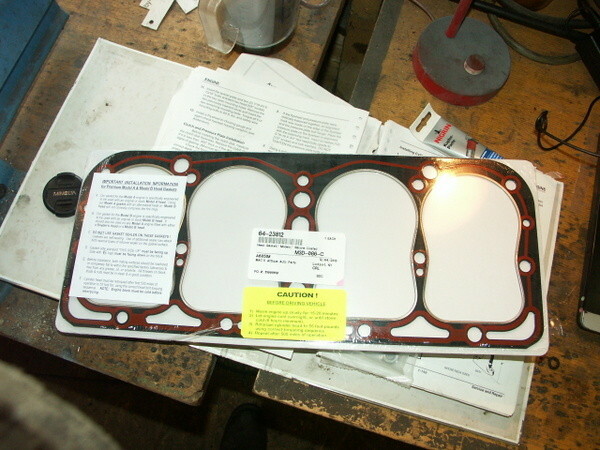 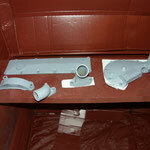 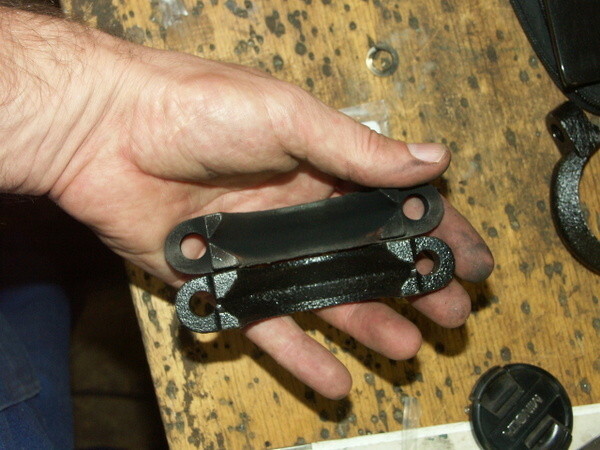 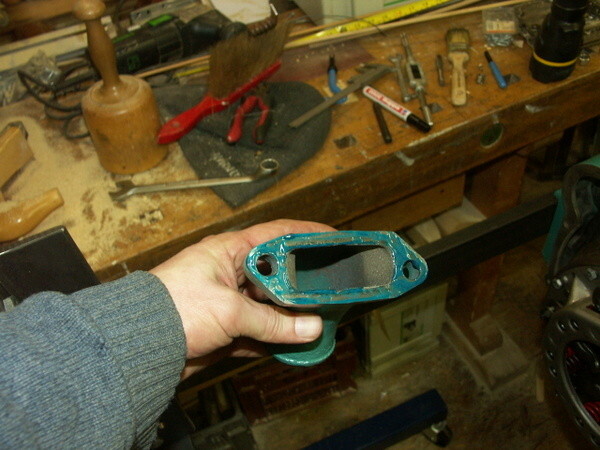 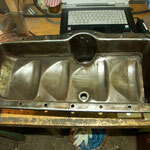 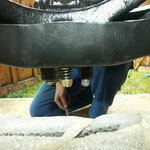 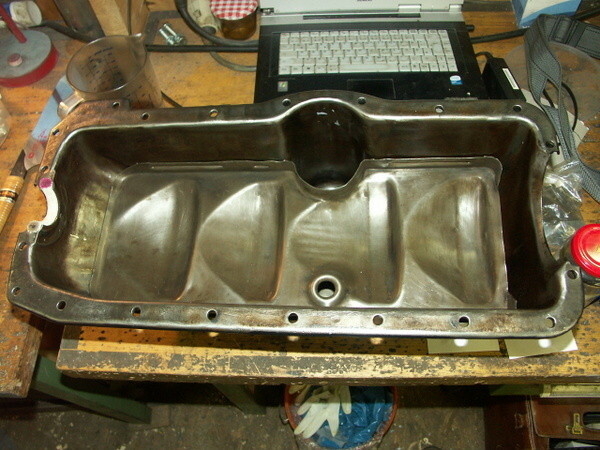 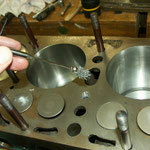 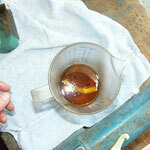 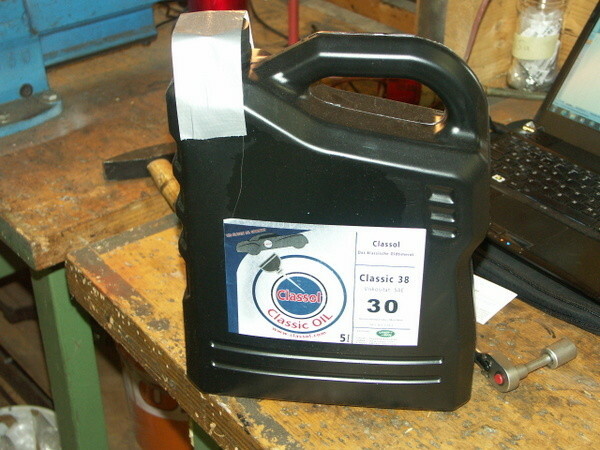 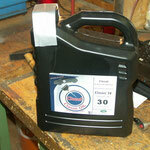 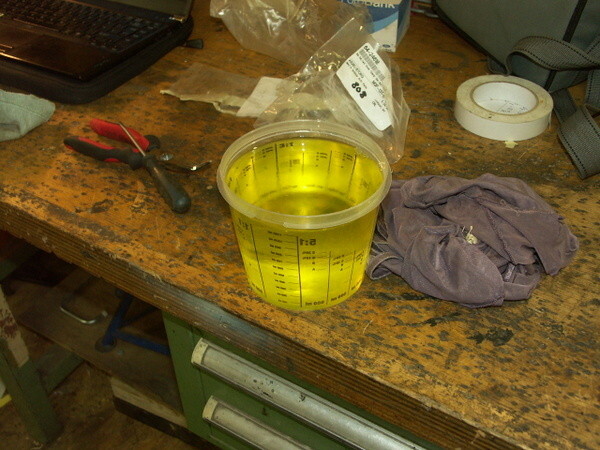 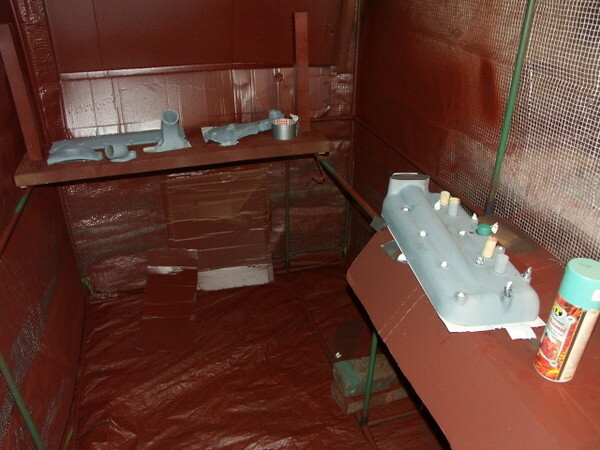 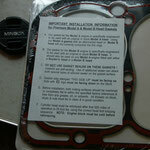 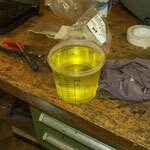 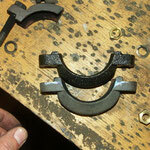 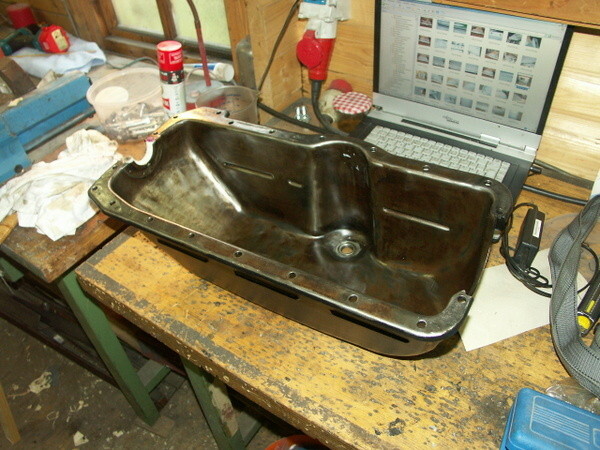 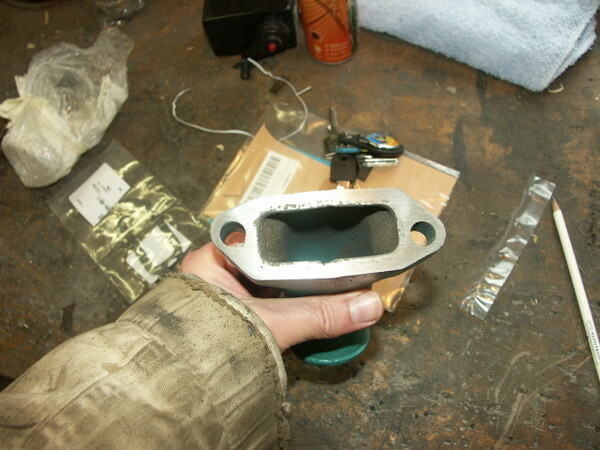 All oil pan gaskets were treated with liquid gasket. 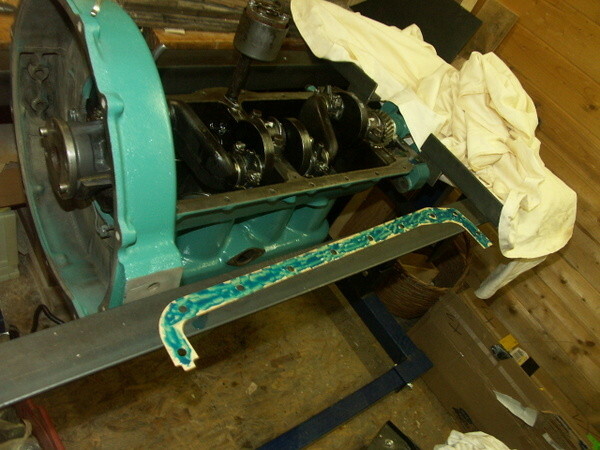 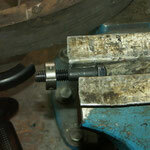 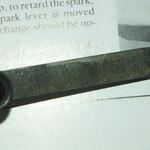 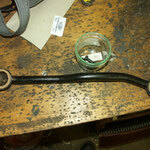 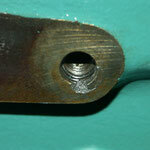 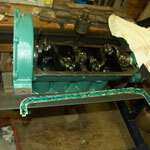 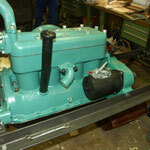 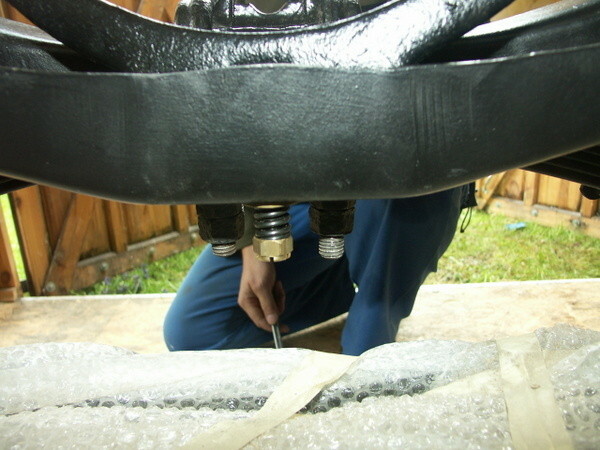 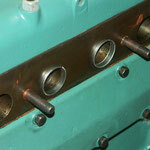 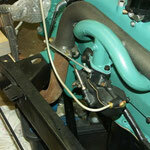 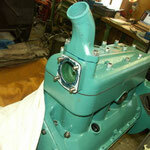 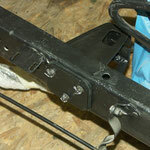 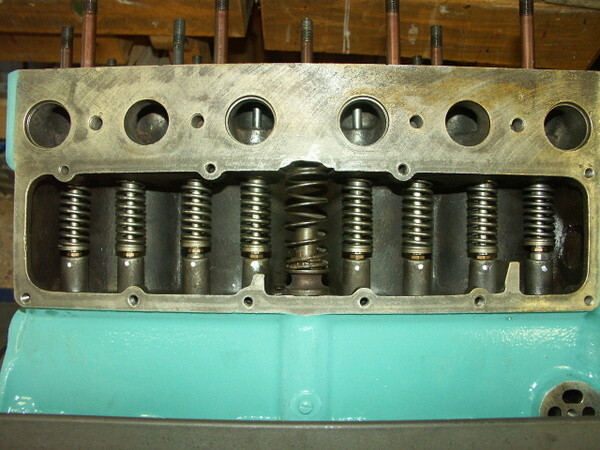 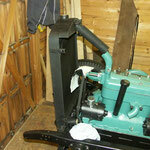 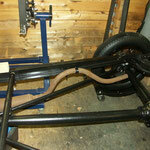 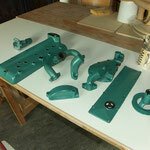 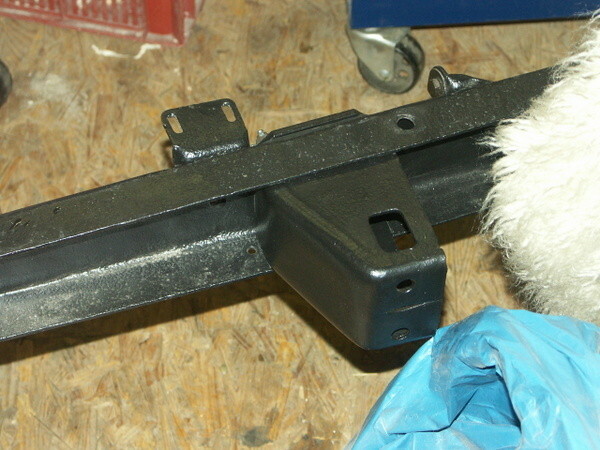 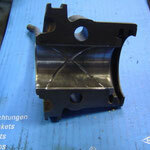 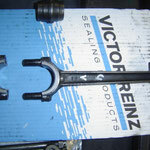 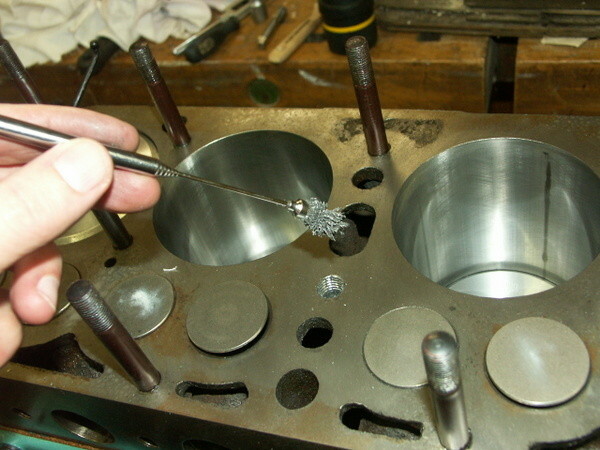 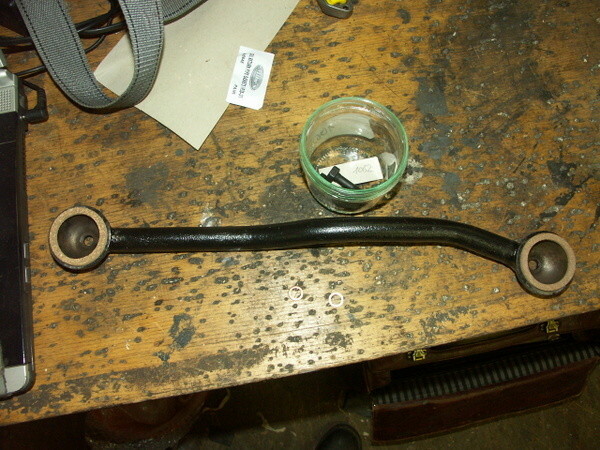 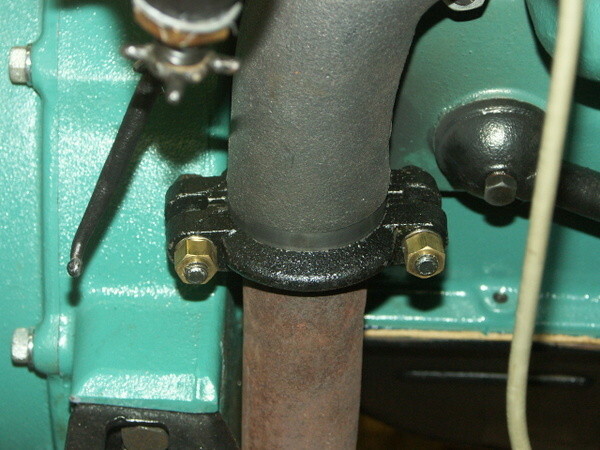 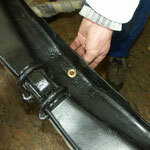 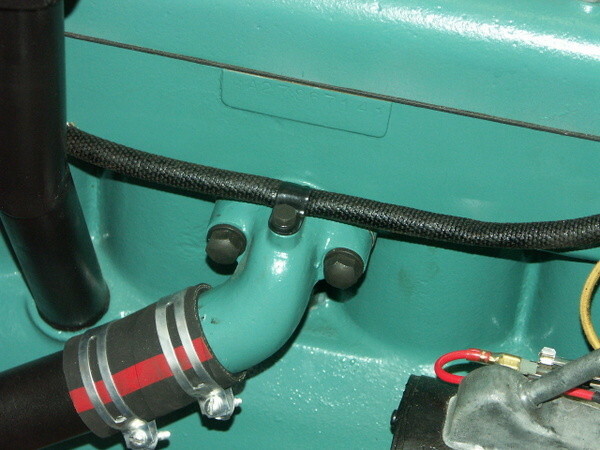 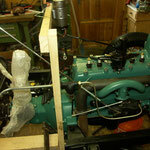 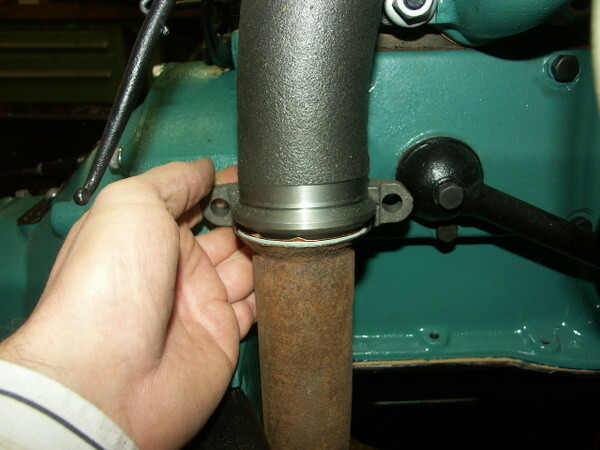 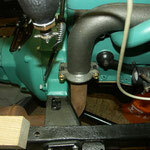 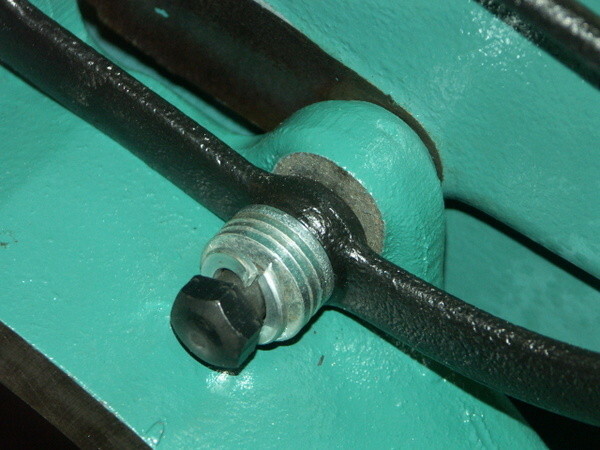 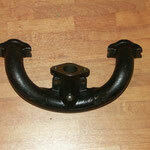 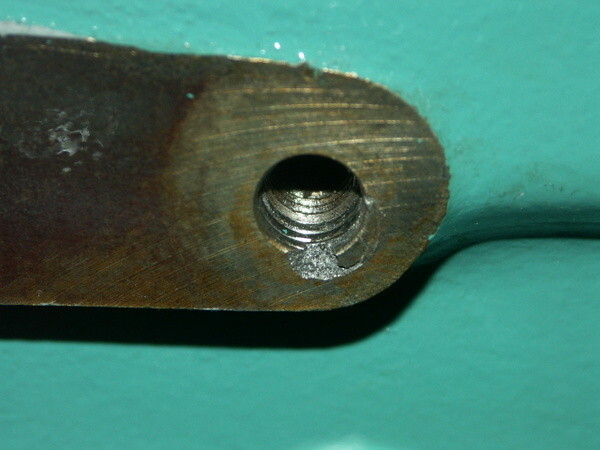 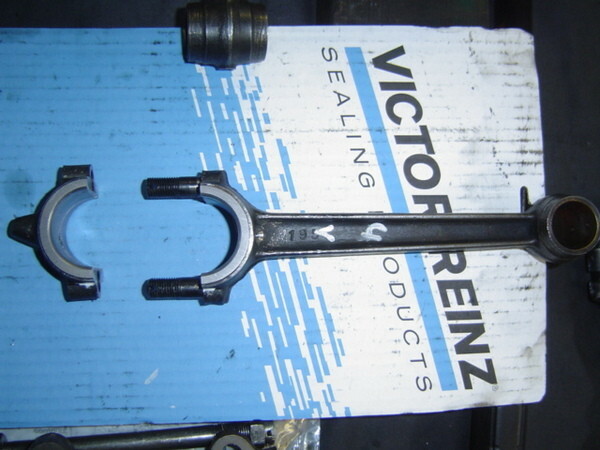 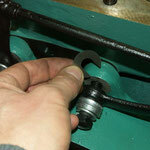 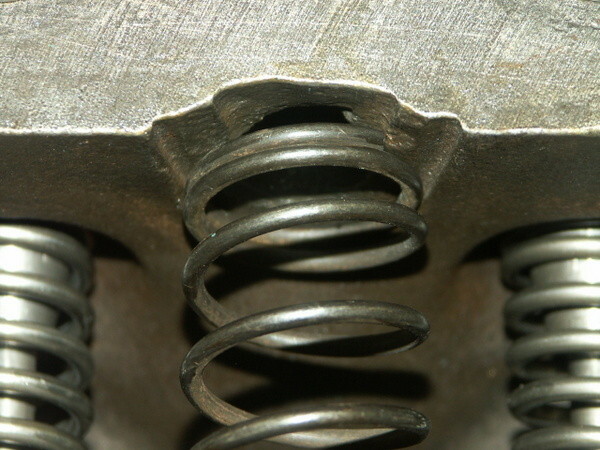 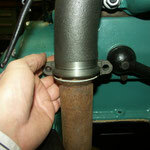 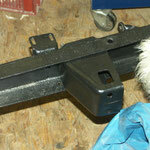 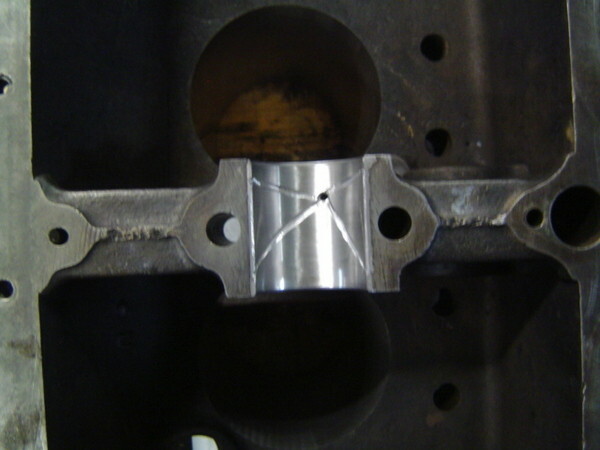 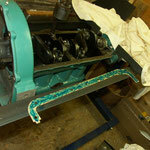 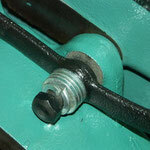 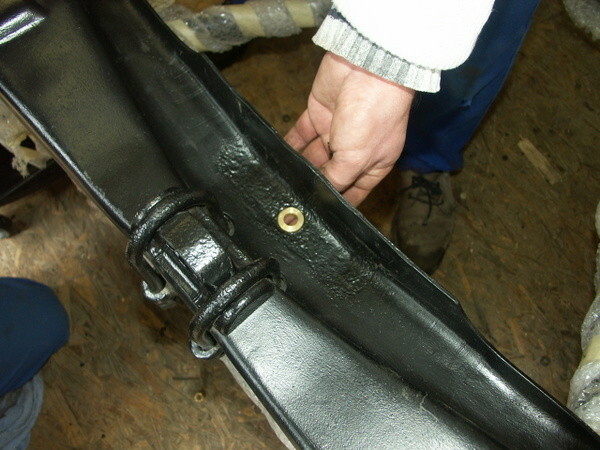 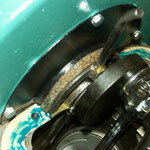 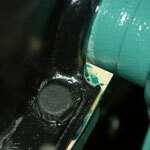 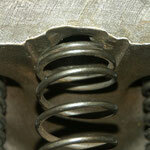 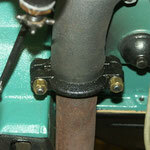 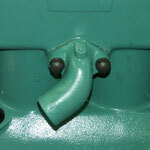 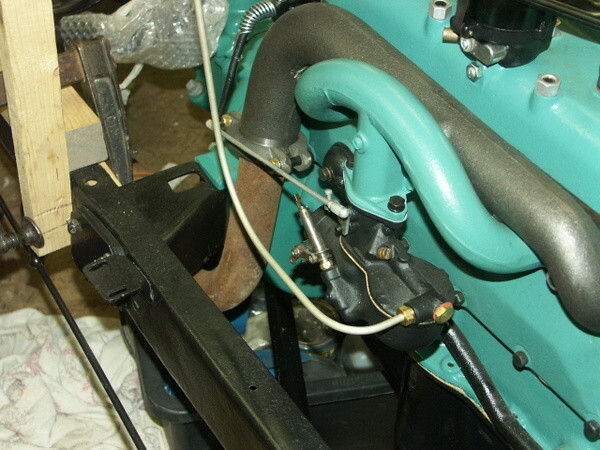 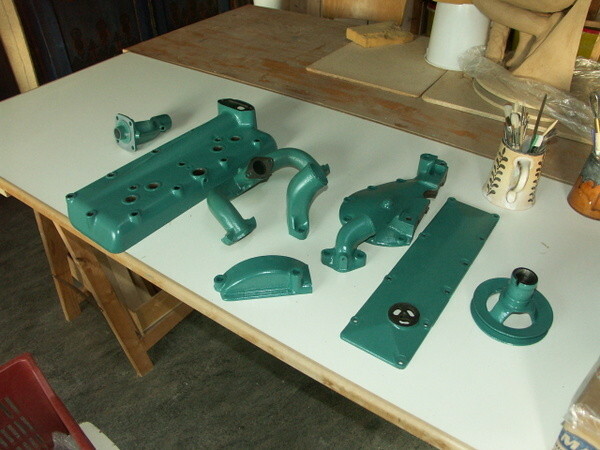 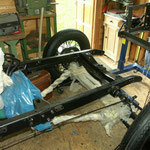 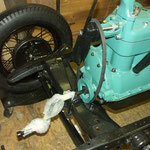 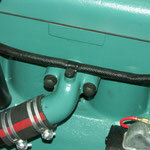 The rope like gaskets were not cut and could easliy pressed together during assembly of the engine bolt. 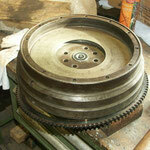 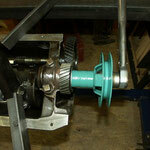 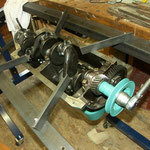 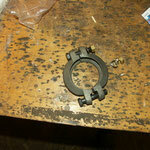 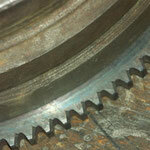 Unfortunately I assembled the ring gear on the flywheel the wrong way, so we had to redo this. 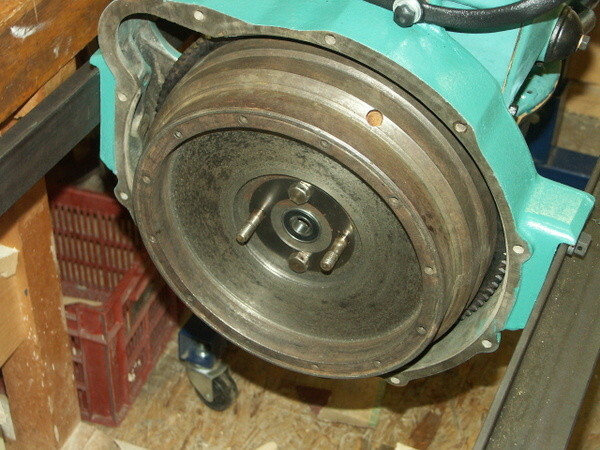 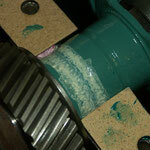 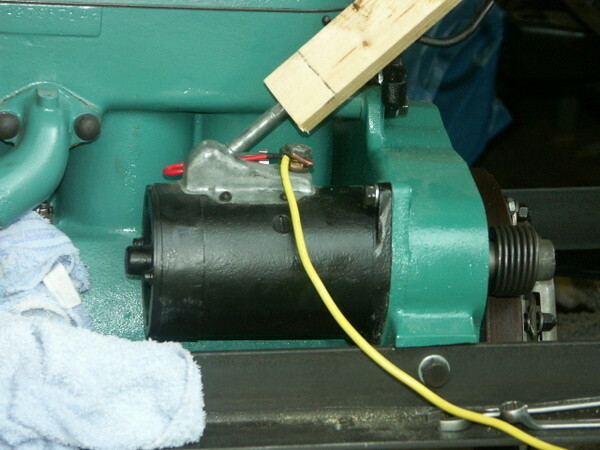 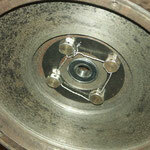 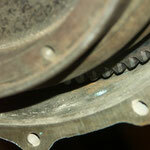 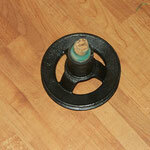 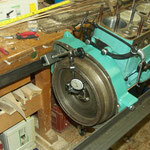 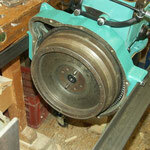 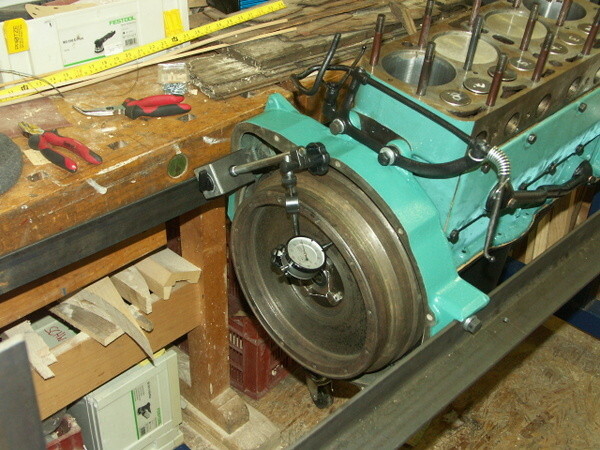 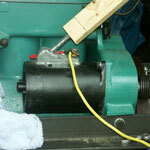 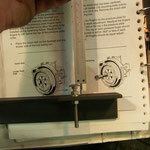 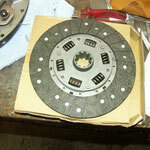 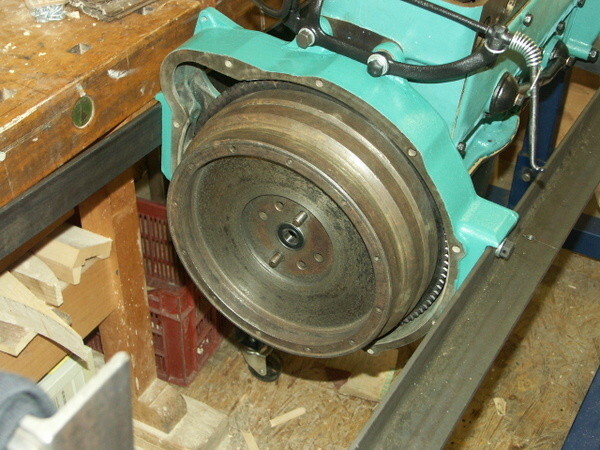 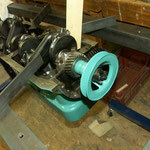 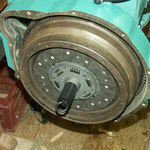 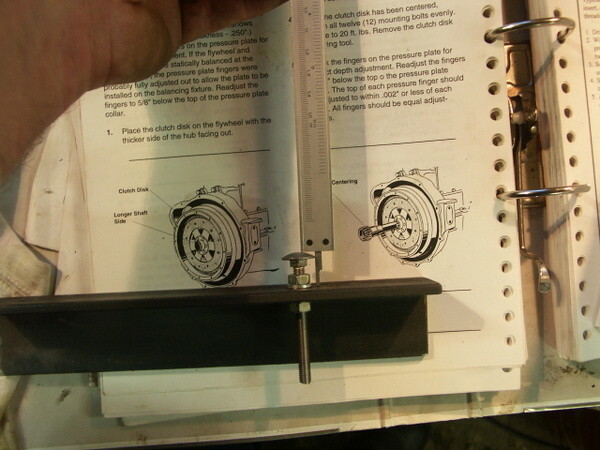 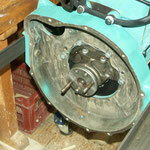 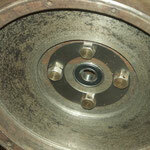 The flywheel wobble test showed 0,15 mm. 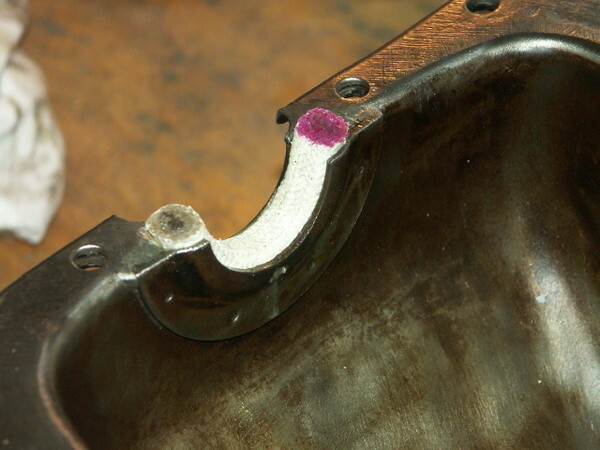 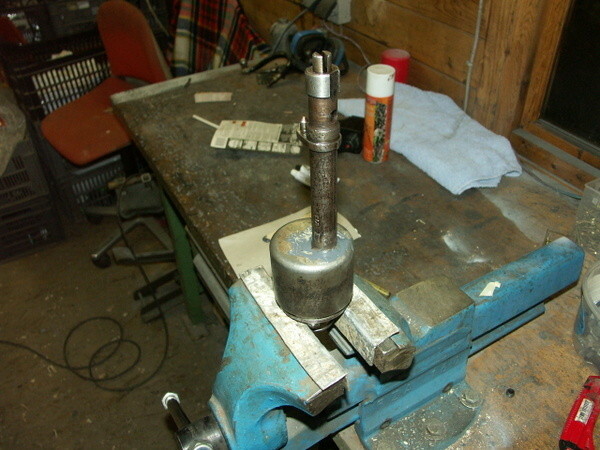 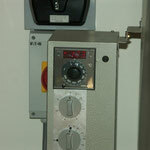 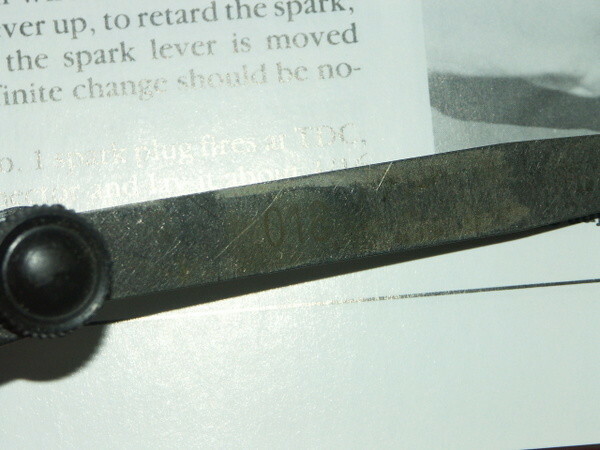 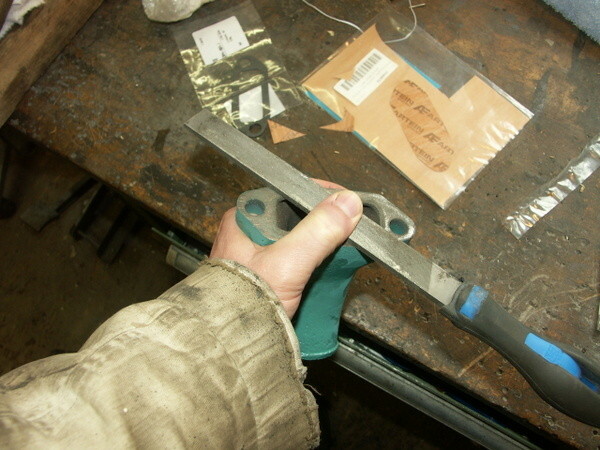 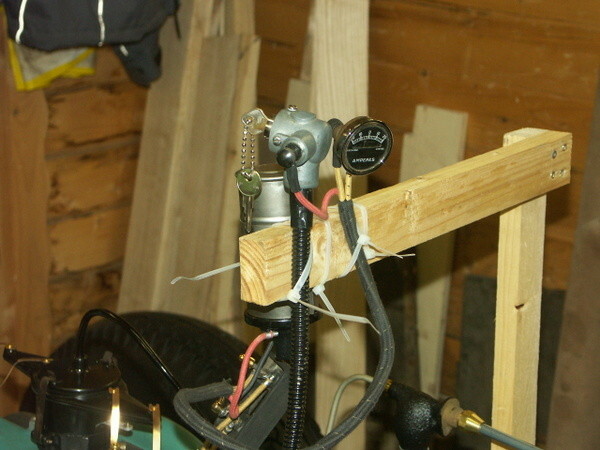 The fingers of the pressure plate were adjusted according to a tip of Tom Wesenberg in fordbarn.com with a special tool and a feeler gauge. 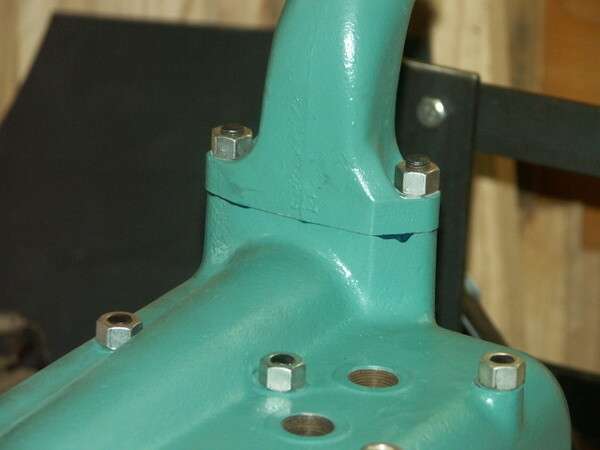 During torquing the head nuts one of the studs came out of the block at 35 footpounds and literally removed the thread in the block (Nr. 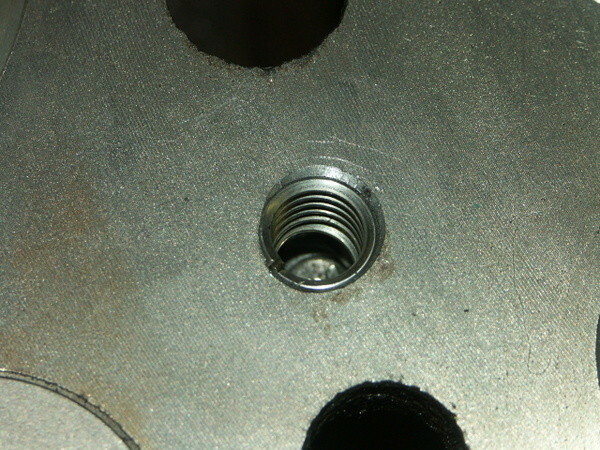 1 stud). 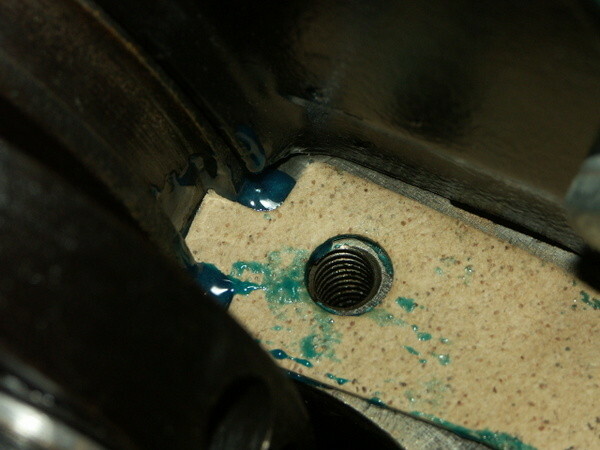 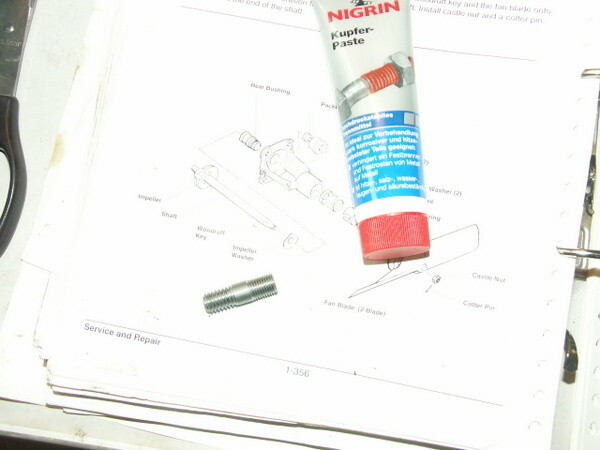 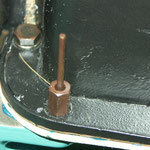 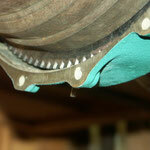 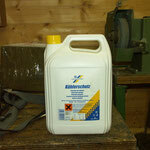 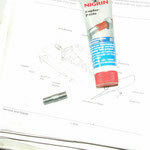 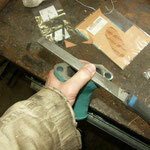 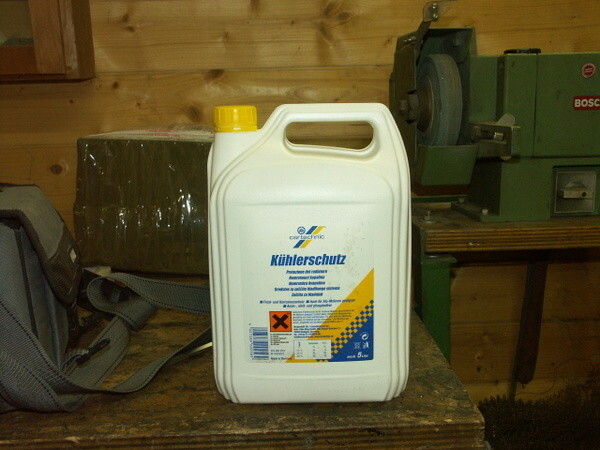 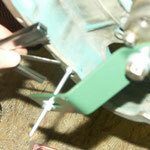 We had to use helicoil for the thread repair. 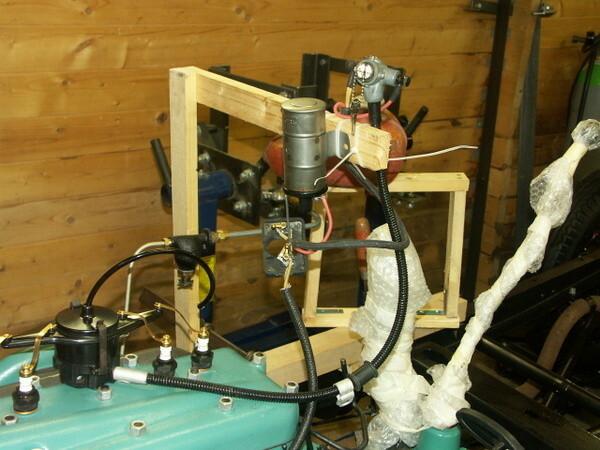 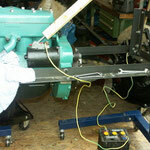 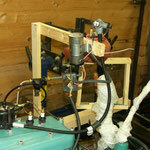 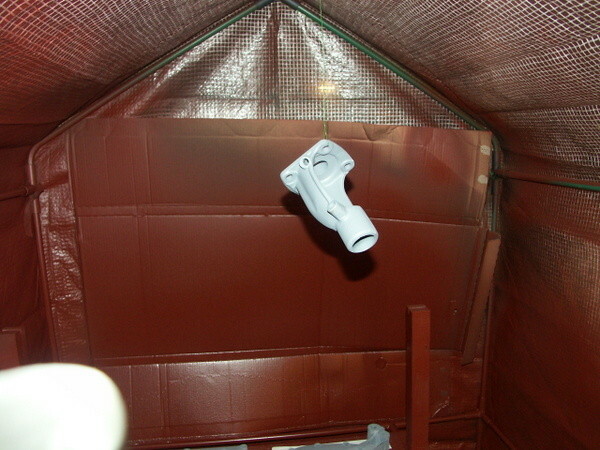 Worked well but we had to shorten the helicoil itself. 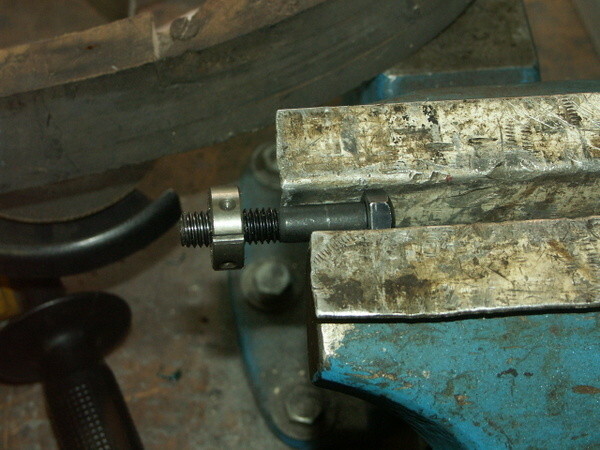 And the stud was afterwords not absolutely perpenticular to the block. 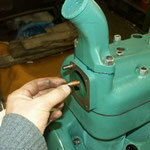 We hope this is not a problem later. 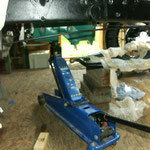 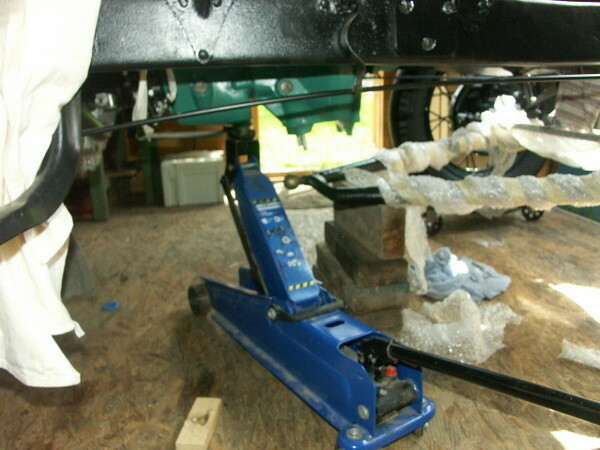 After that we could torque all bolts to 55 footpounds. 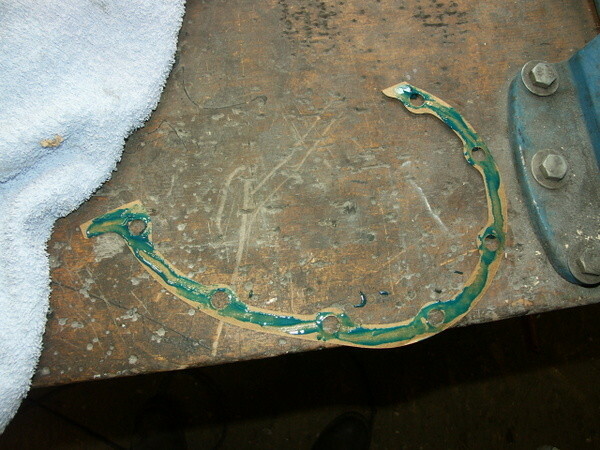 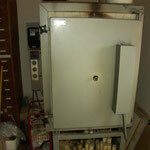 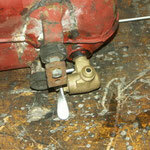 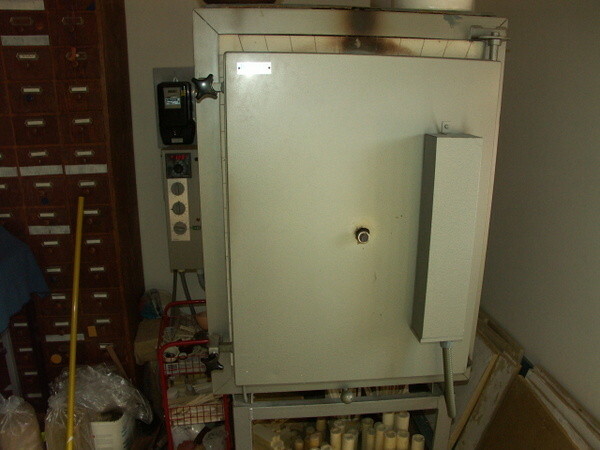 We did not use any gasket at the water outlet but only liquid gasket. 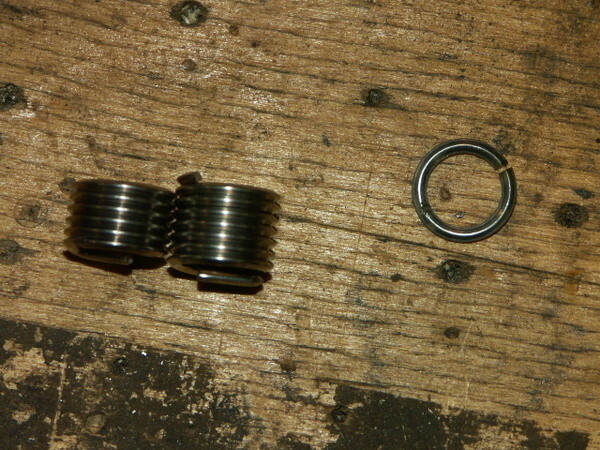 Both parts were filed beforehand. 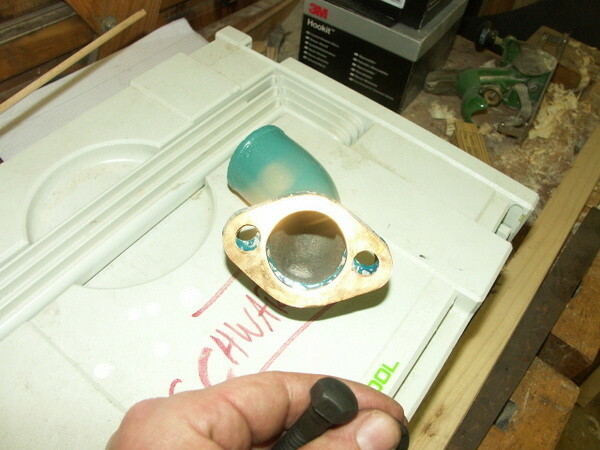 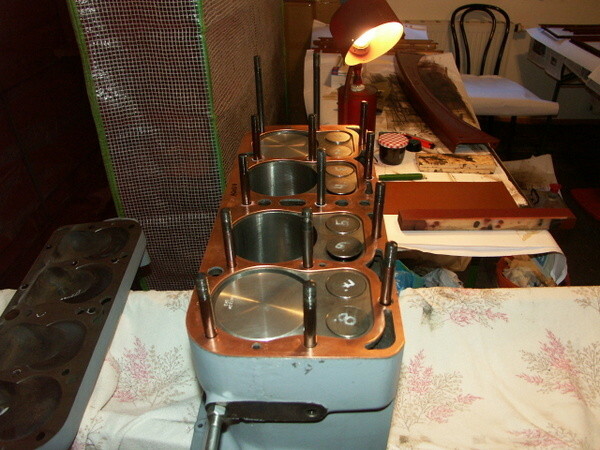 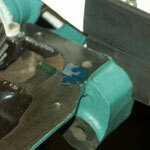 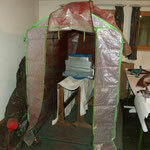 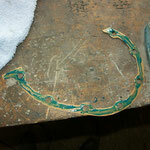 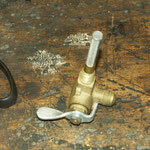 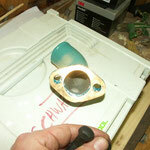 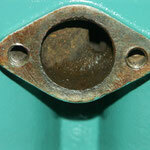 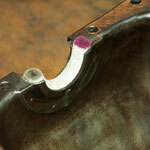 We used the copper gasket at the water inlet. 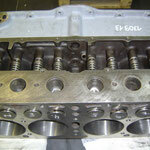 We used a moden head gasket. 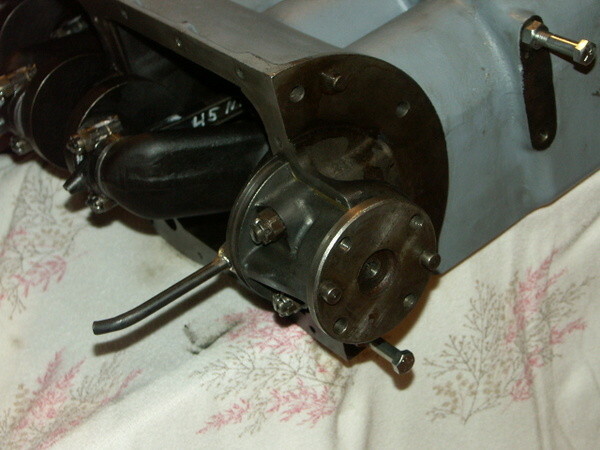 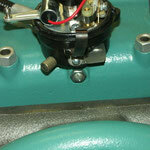 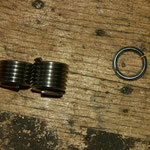 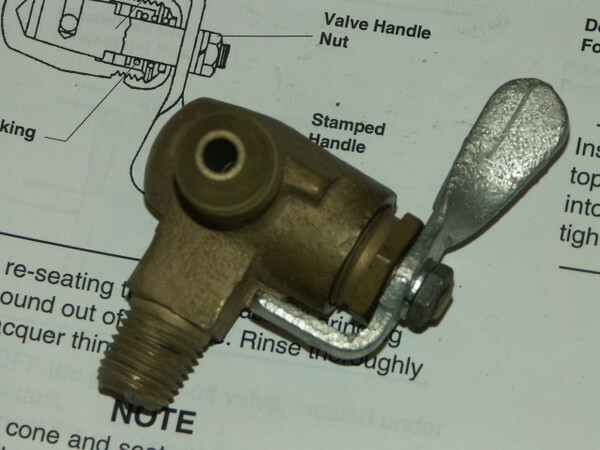 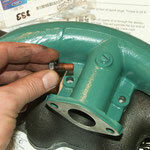 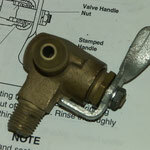 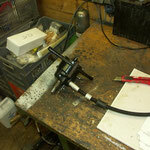 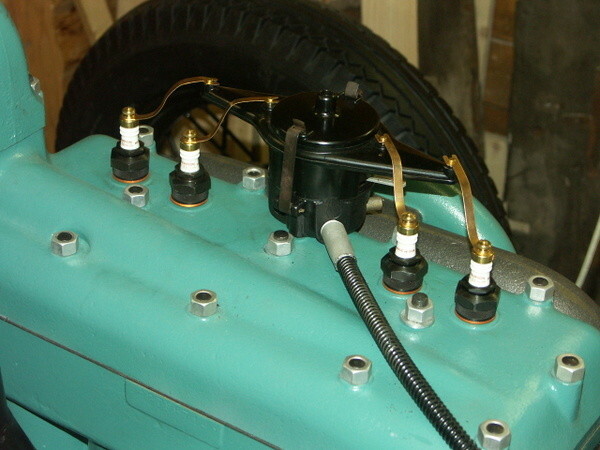 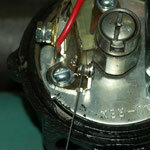 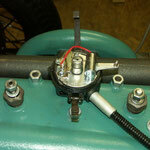 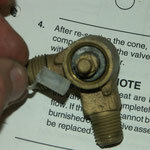 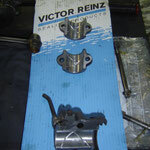 The assembly of the manifold and carburetor showed no problems, gland rings fit well. 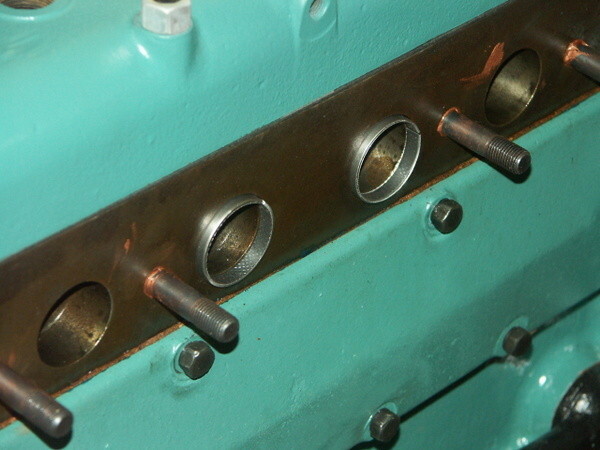 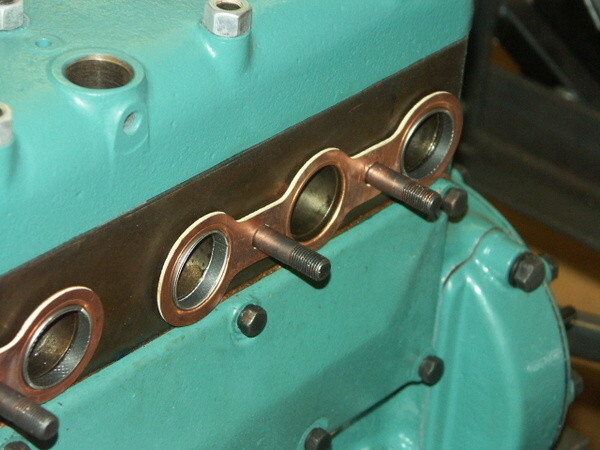 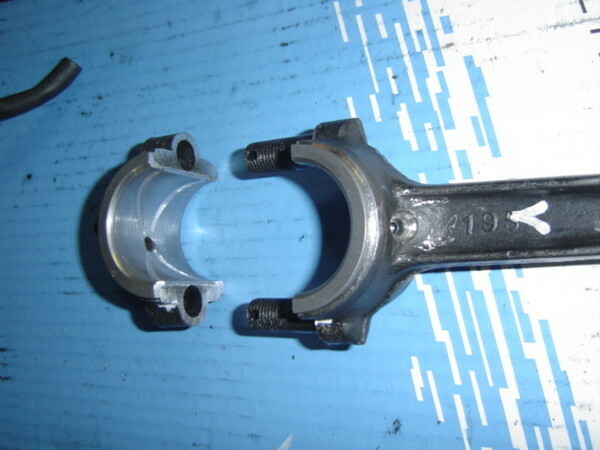 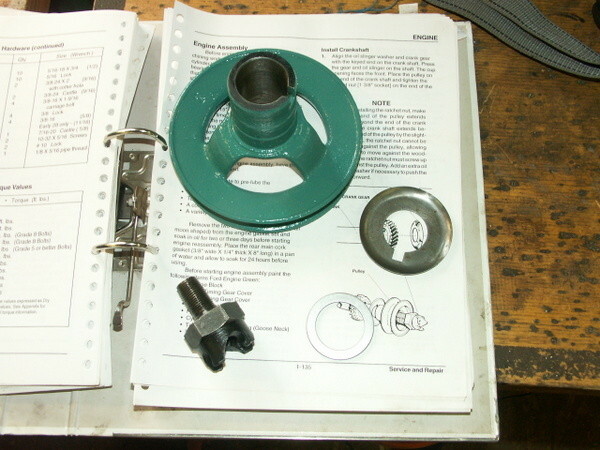 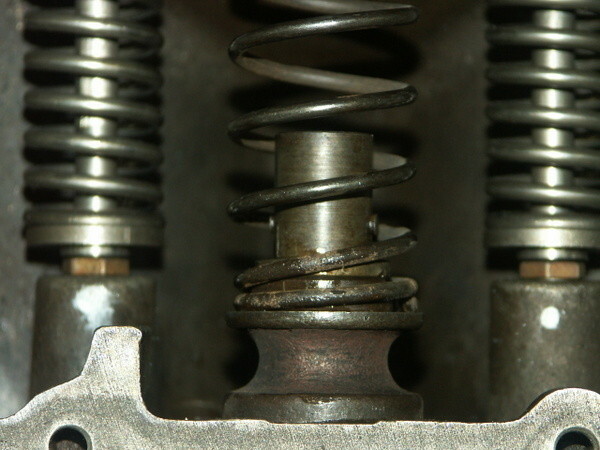 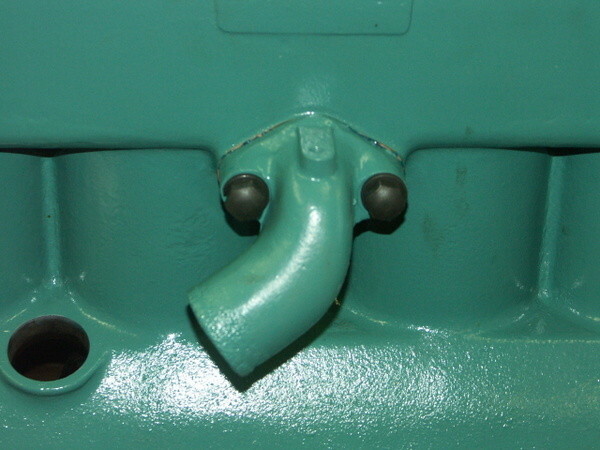 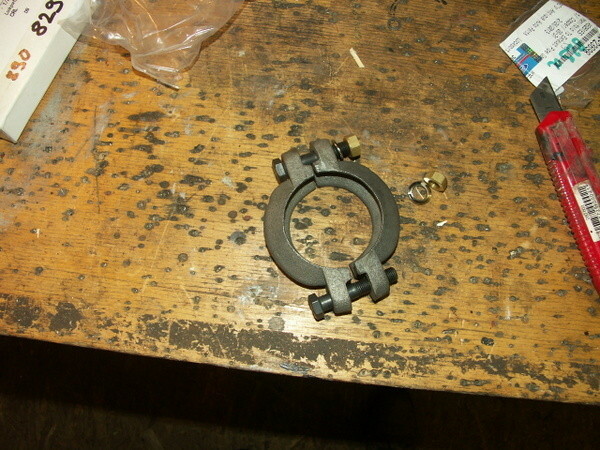 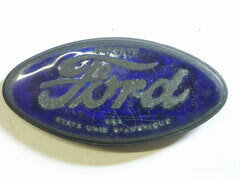 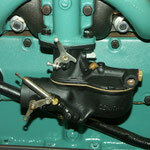 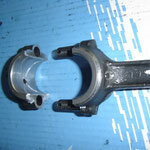 (According to the standards gland rings are necessary for engines from early 1930). 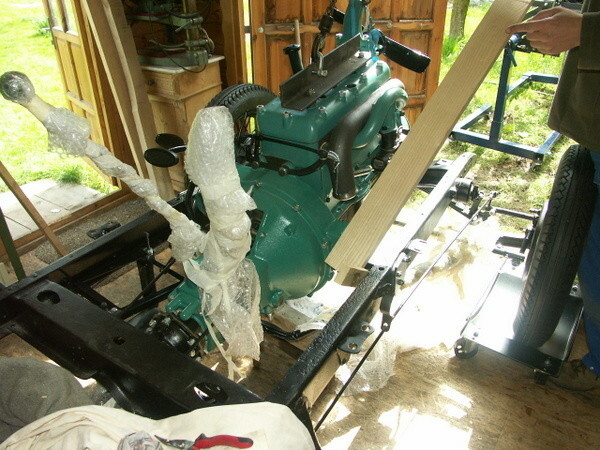 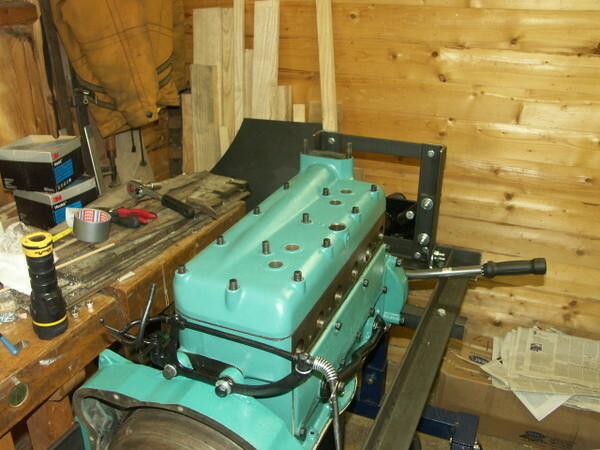 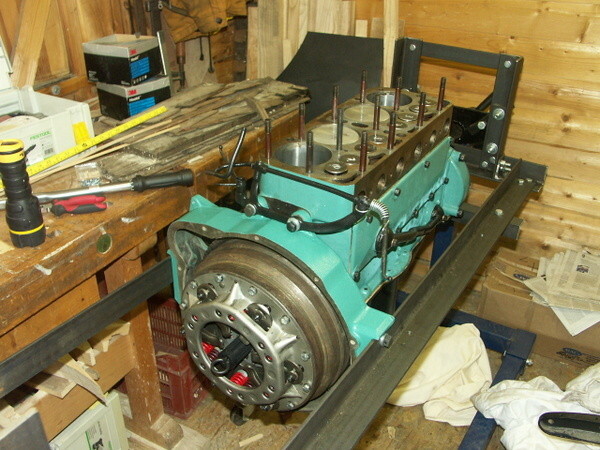 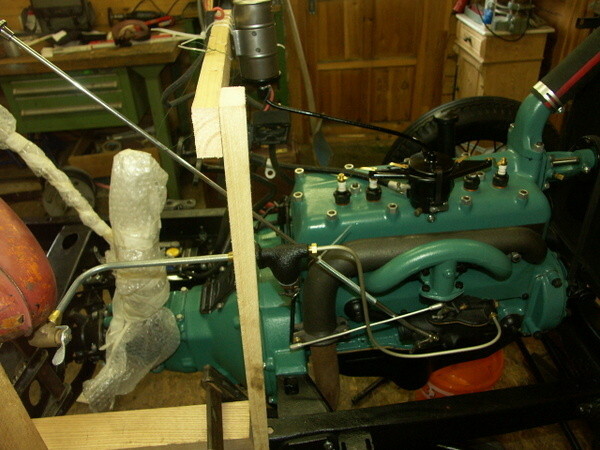 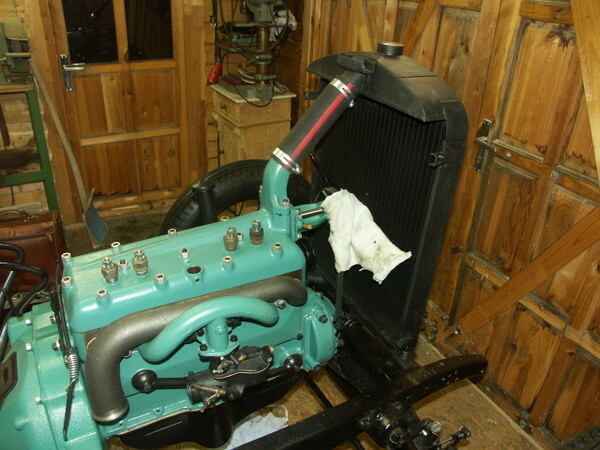 May 19th 2014: The engine is running! 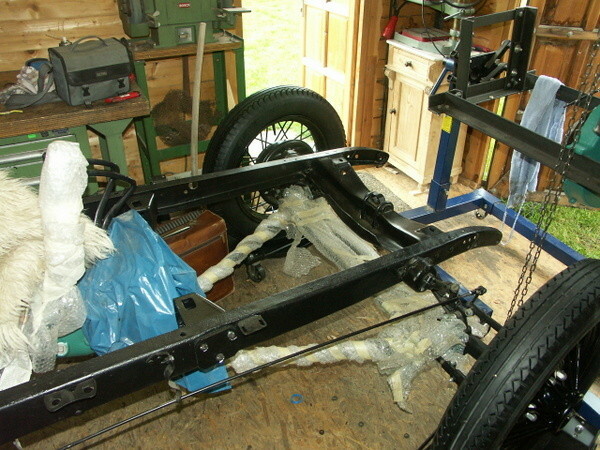 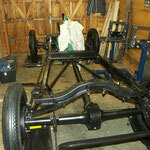 The mounting in the chassis was a bit tricky; The trick was to lower it down in an angle and lift the transmission high up in the same angle. 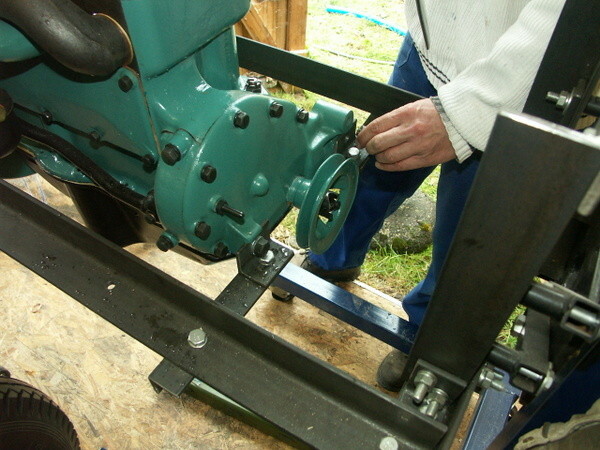 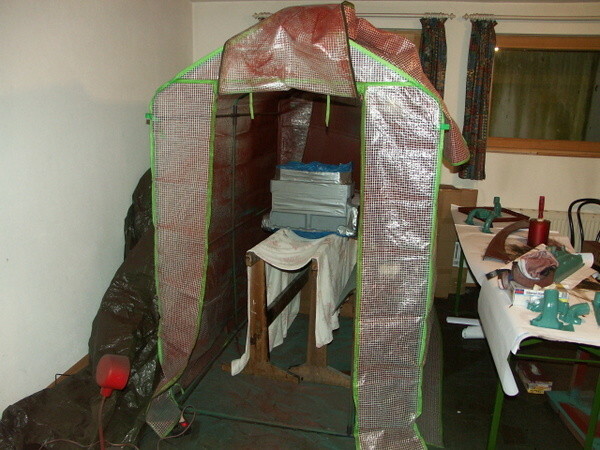 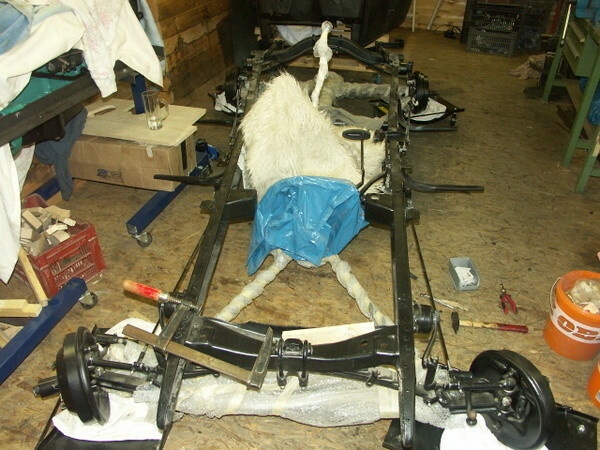 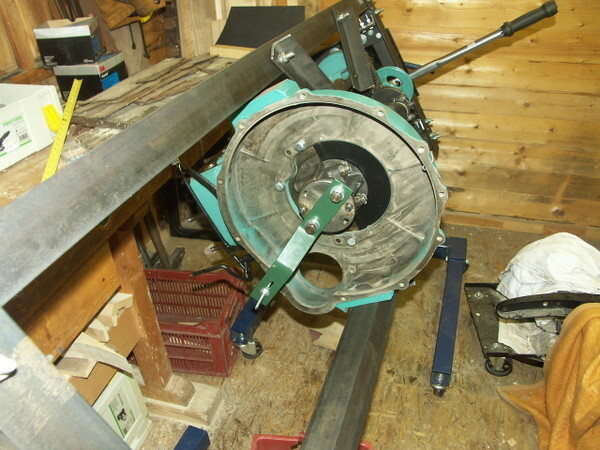 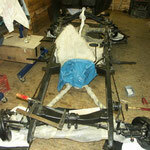 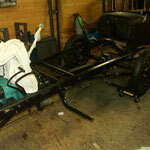 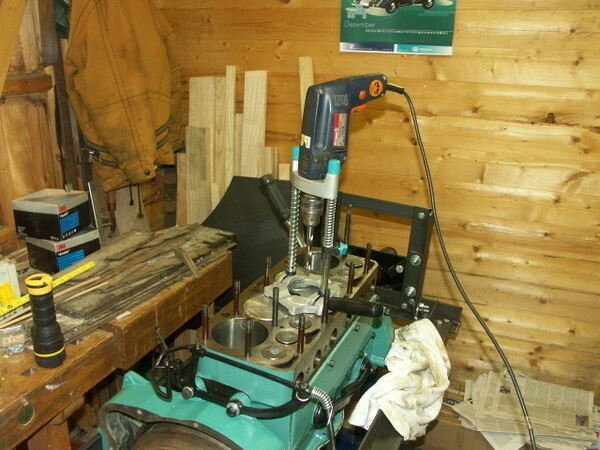 The frame was spreaded with the help of a wooden bar. 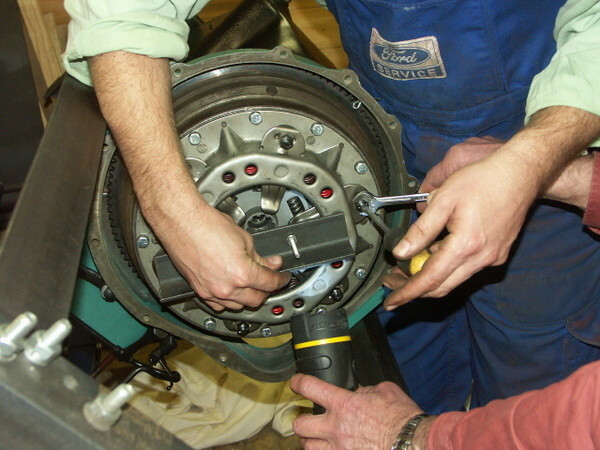 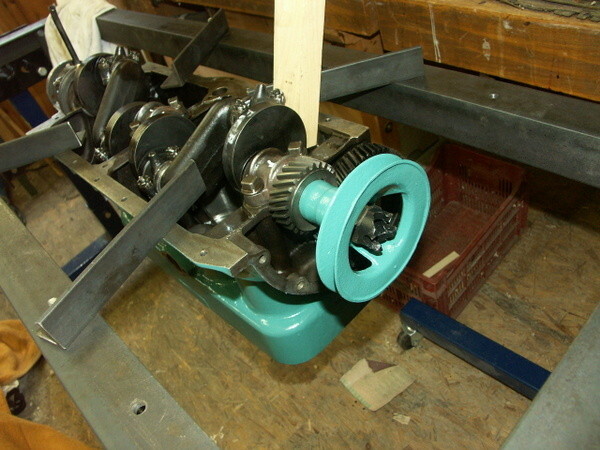 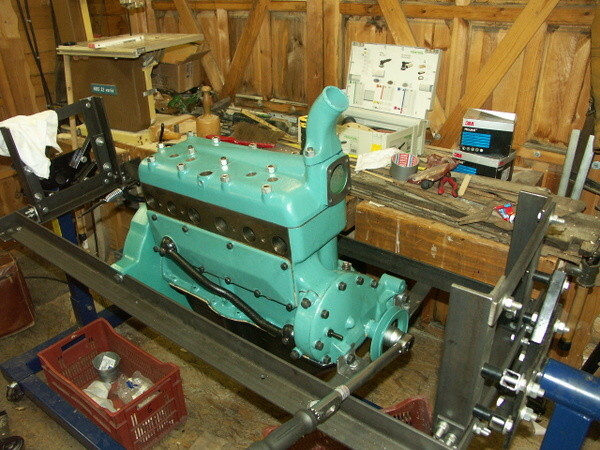 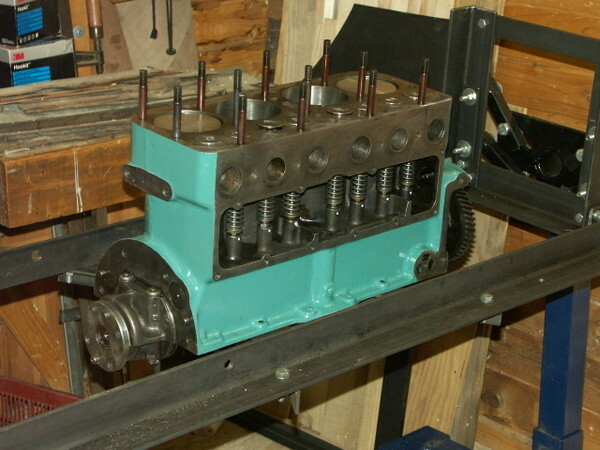 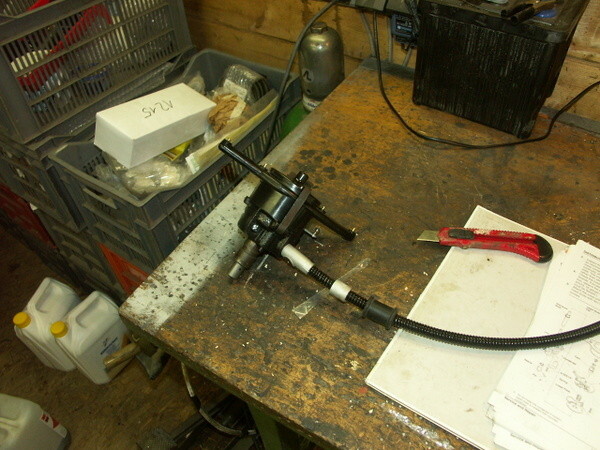 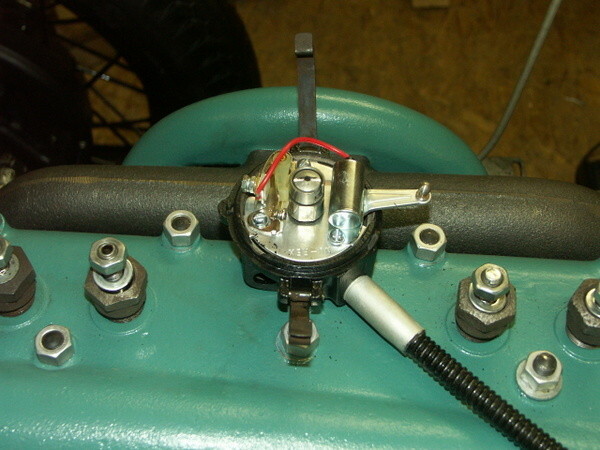 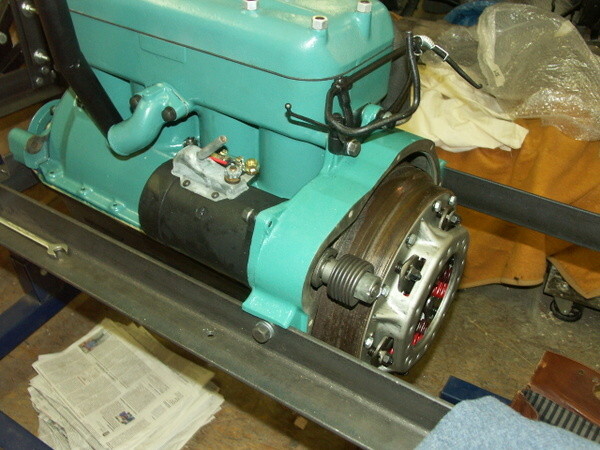 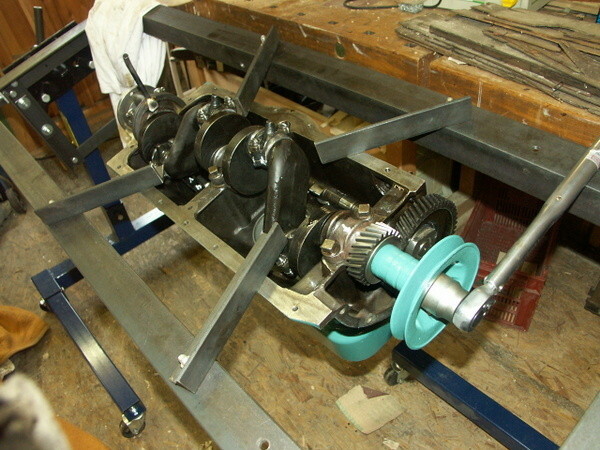 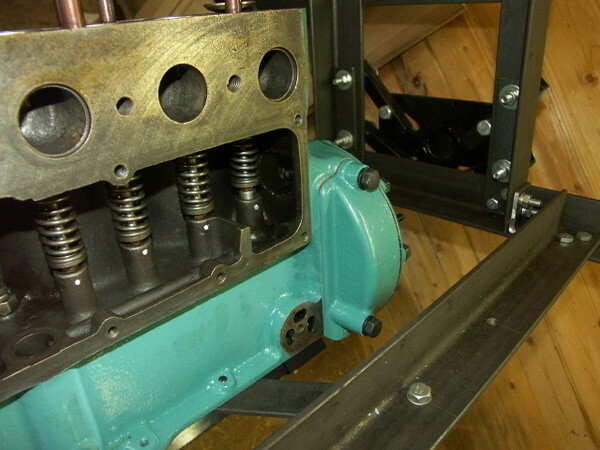 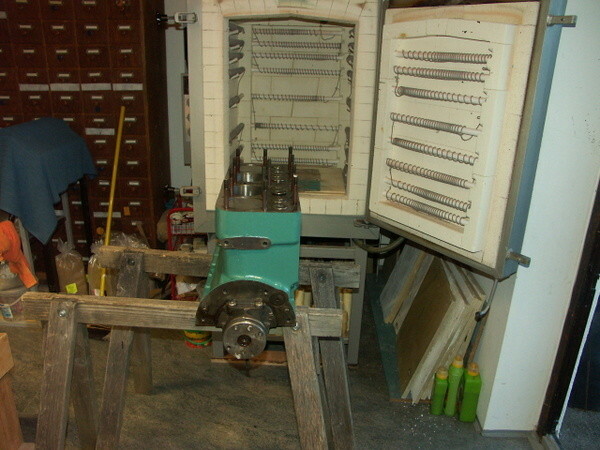 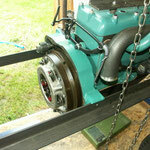 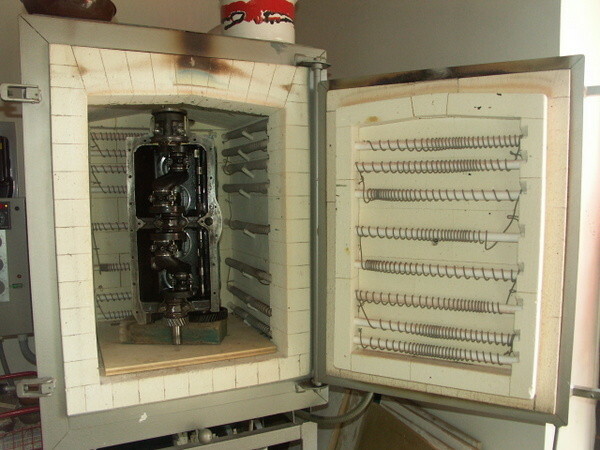 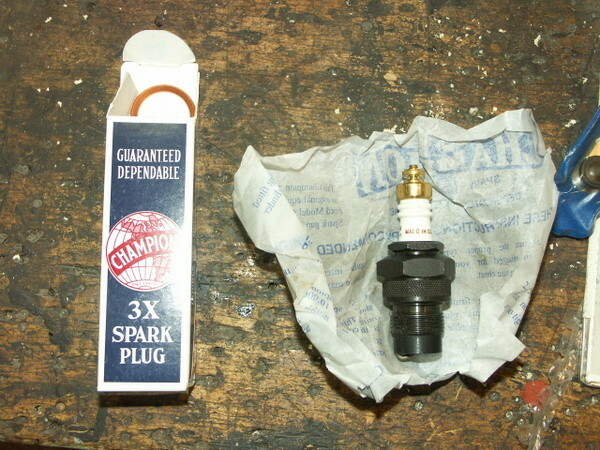 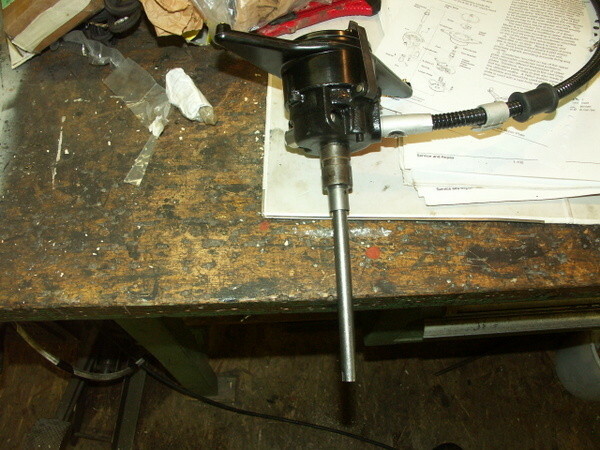 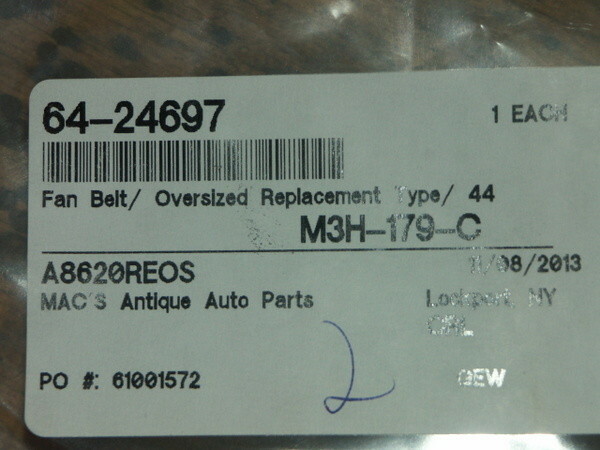 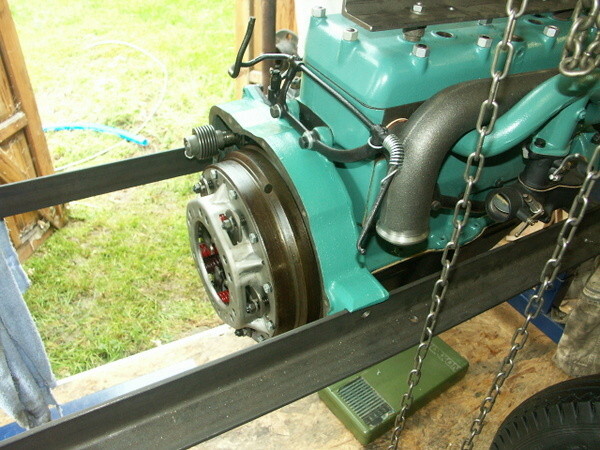 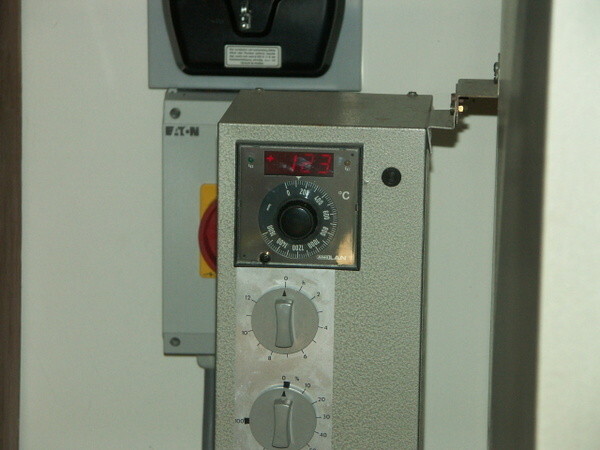 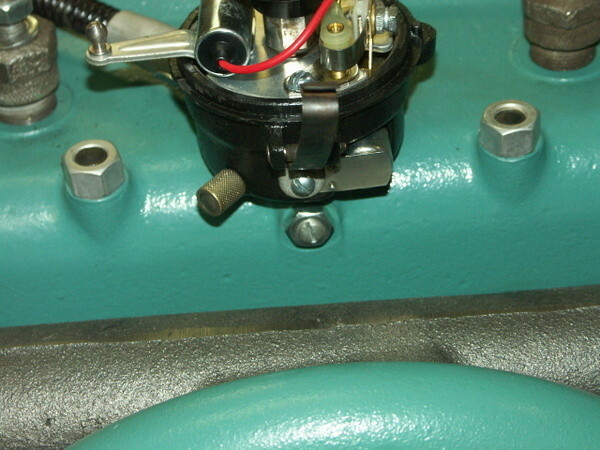 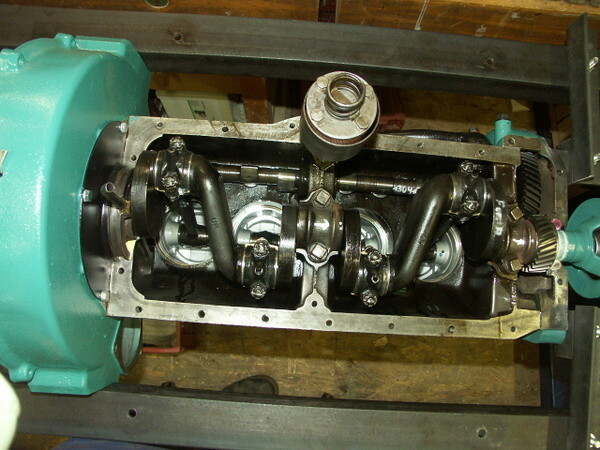 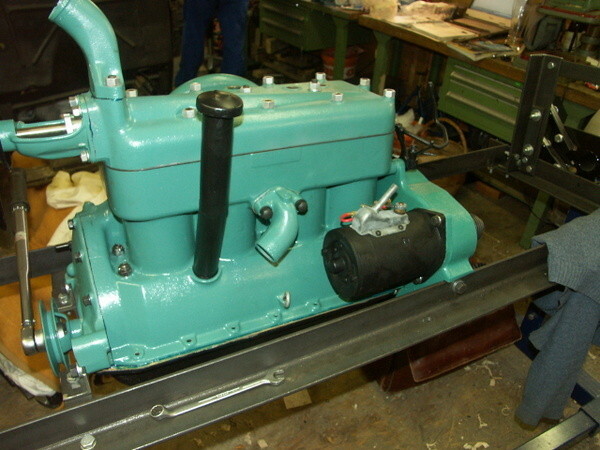 Distributor assembly was performed according to Les Andrews, as well as timing. 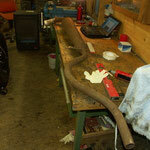 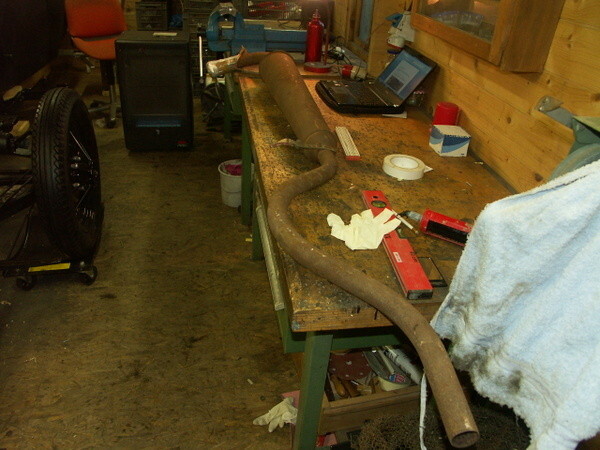 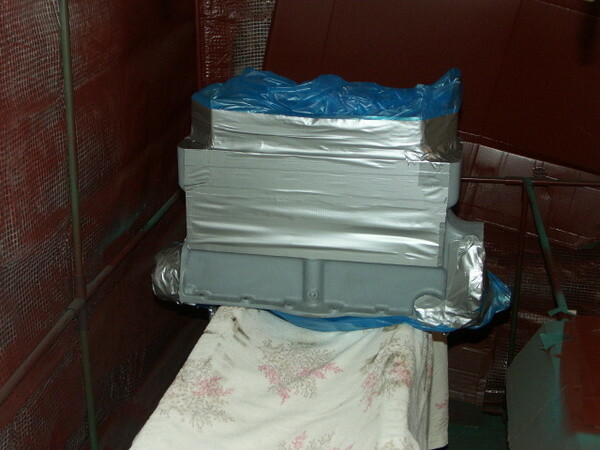 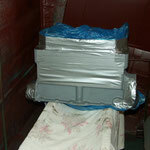 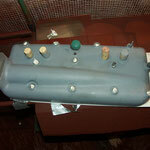 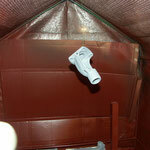 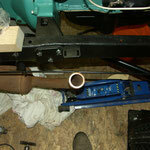 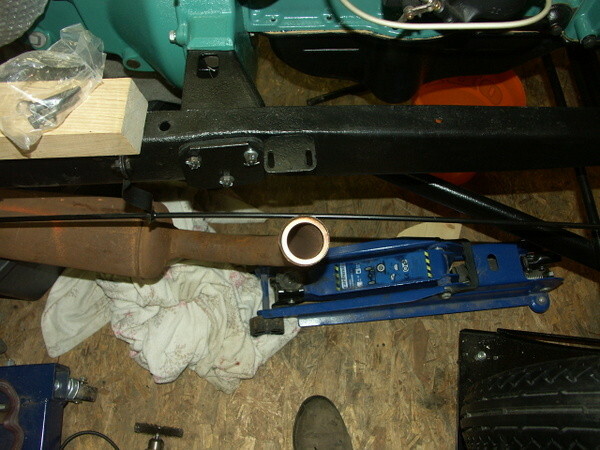 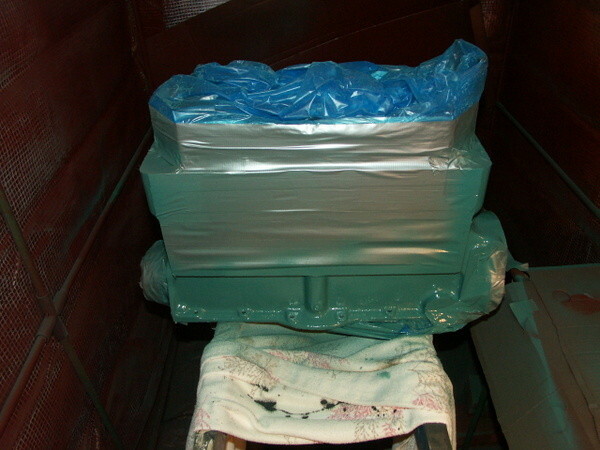 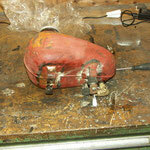 We used a used muffler, to prevent a leakage we used muffler cemen from brattons. 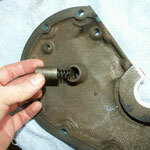 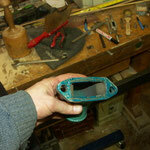 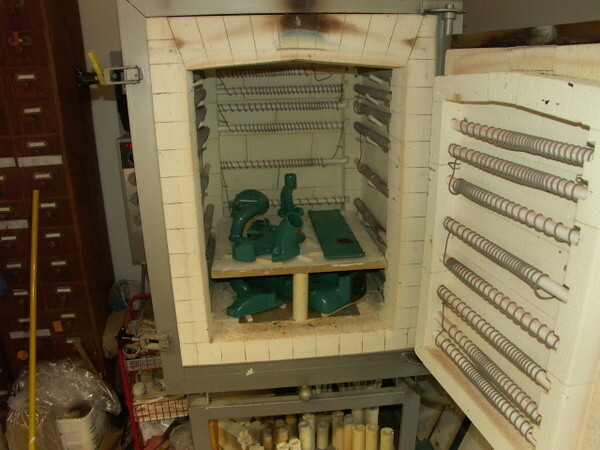 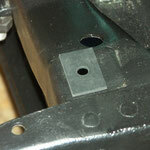 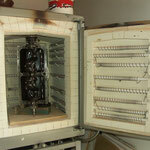 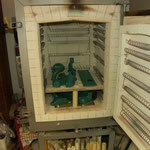 (We could not figure out how to use the gasket). 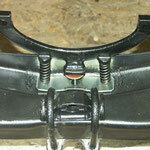 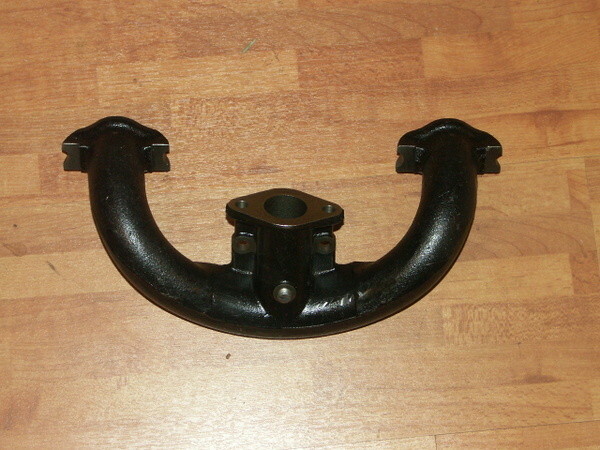 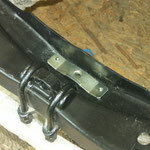 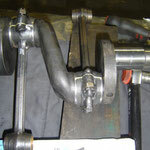 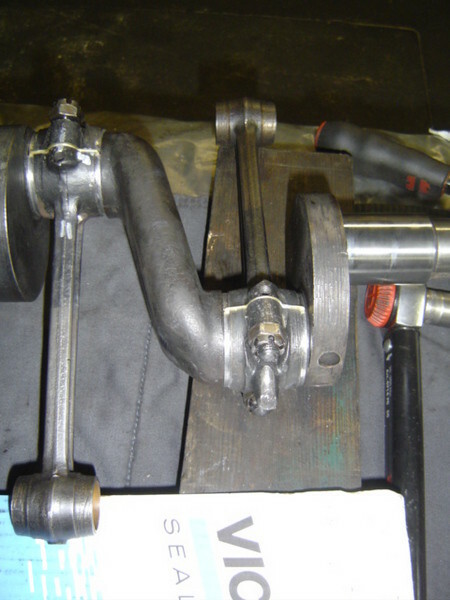 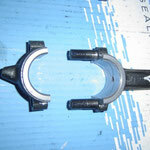 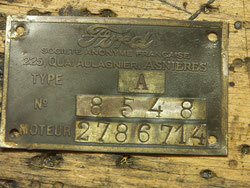 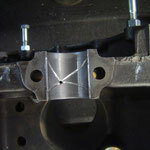 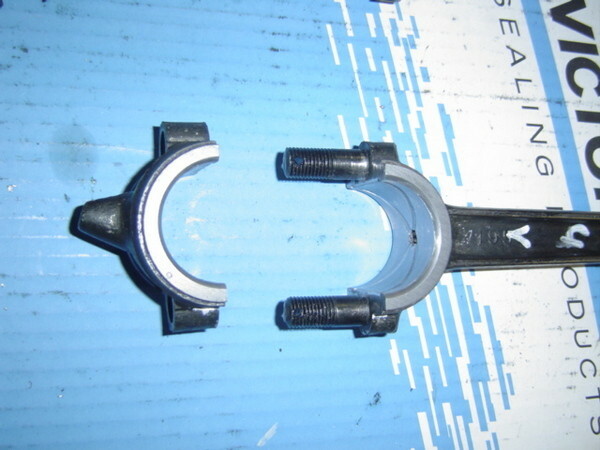 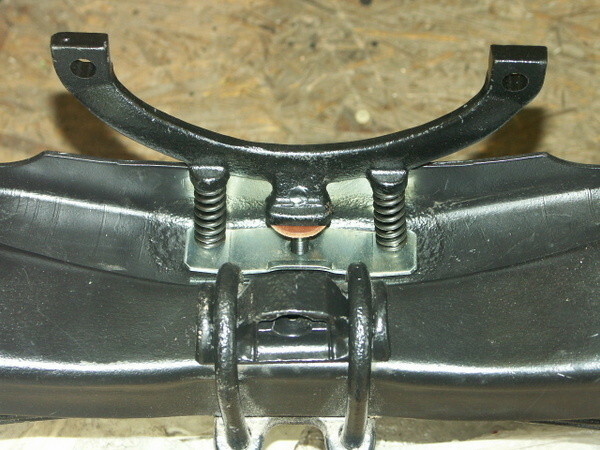 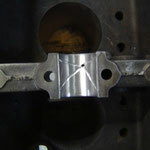 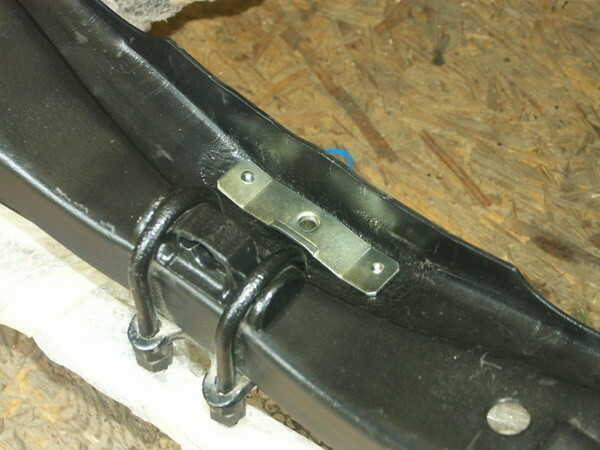 The first muffler clamp we used was ca. 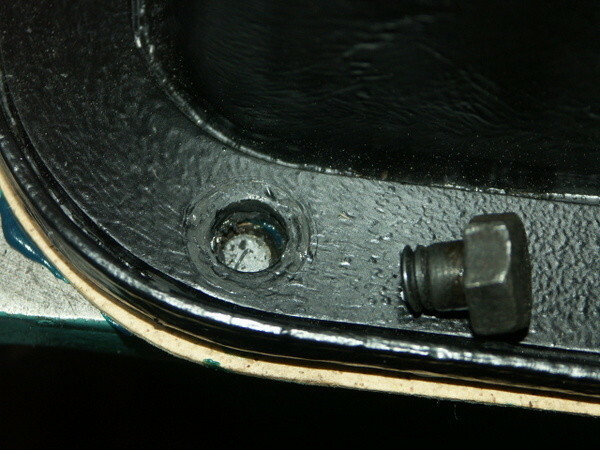 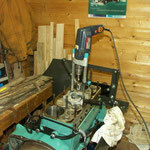 3 mm to narrow and broke, the second (Brattons) fitted well. 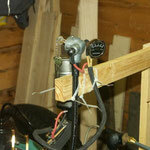 The electrical connections we used as delivered from Macs and assembled everything temporarily. 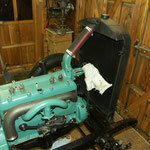 Then the engines started without problems! 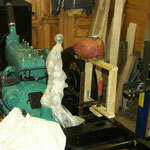 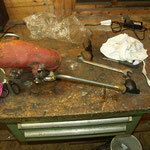 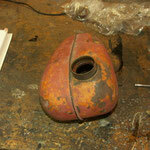 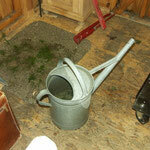 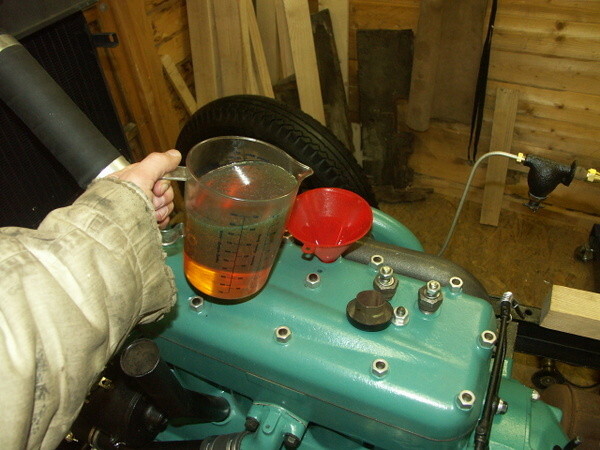 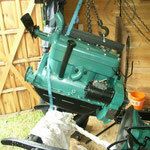 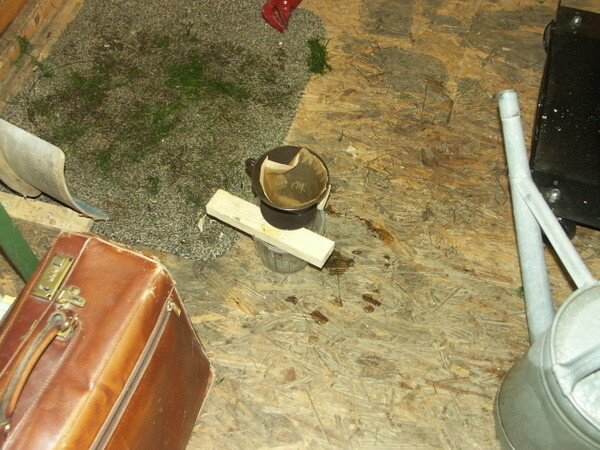 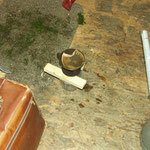 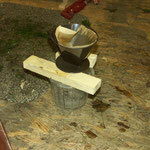 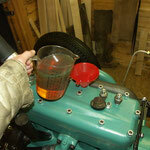 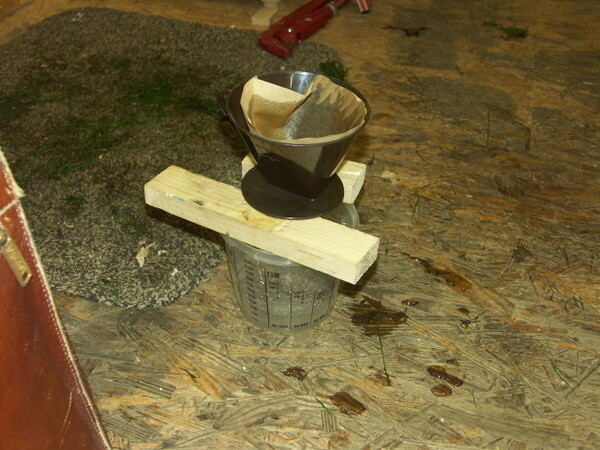 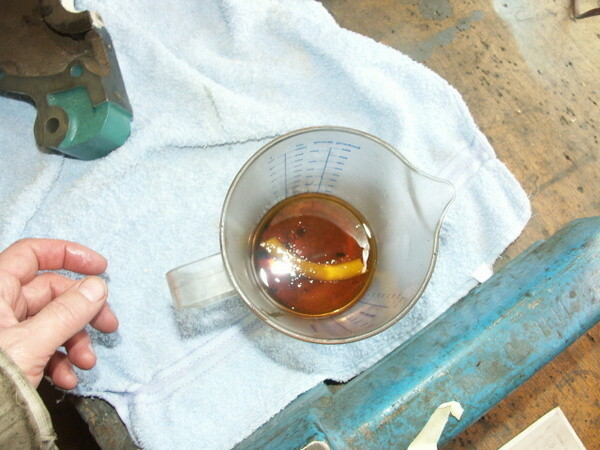 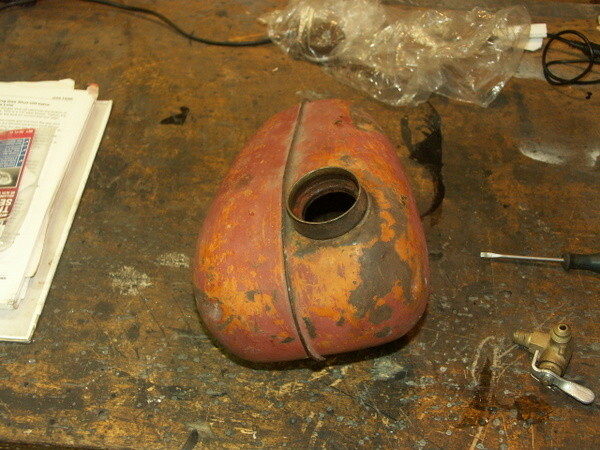 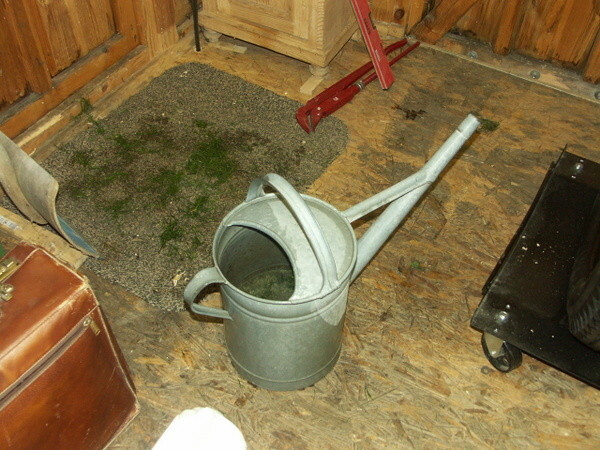 But the mixture was very rich, and the water pump leaking.